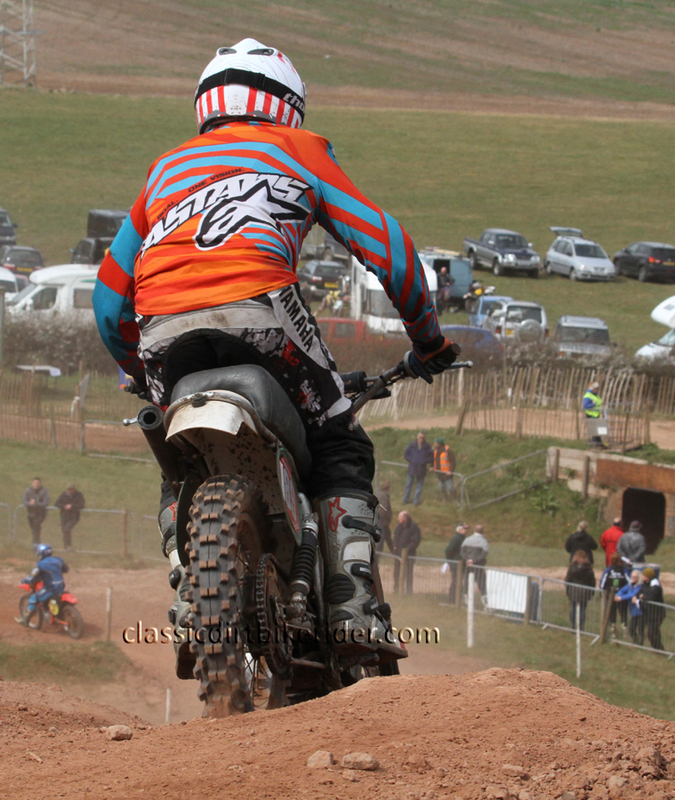 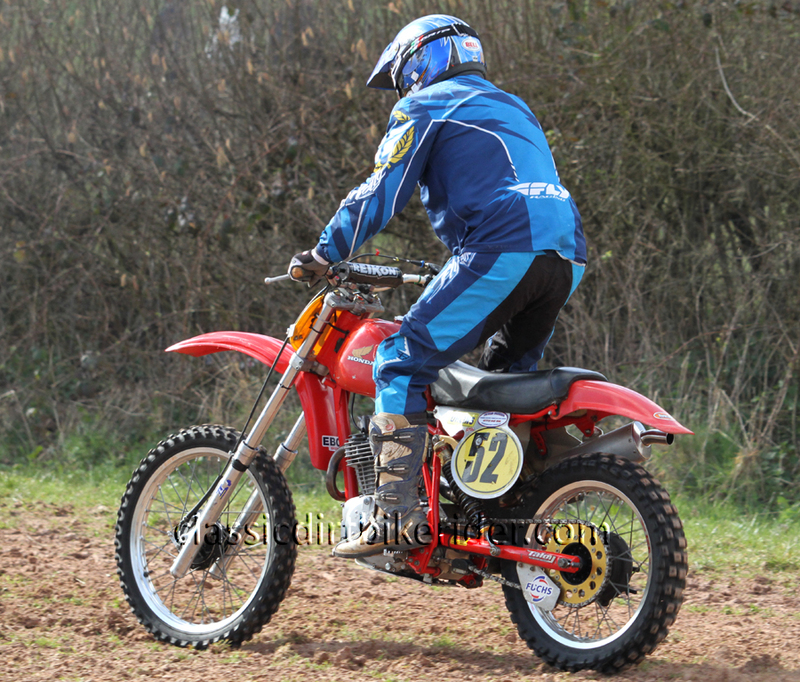 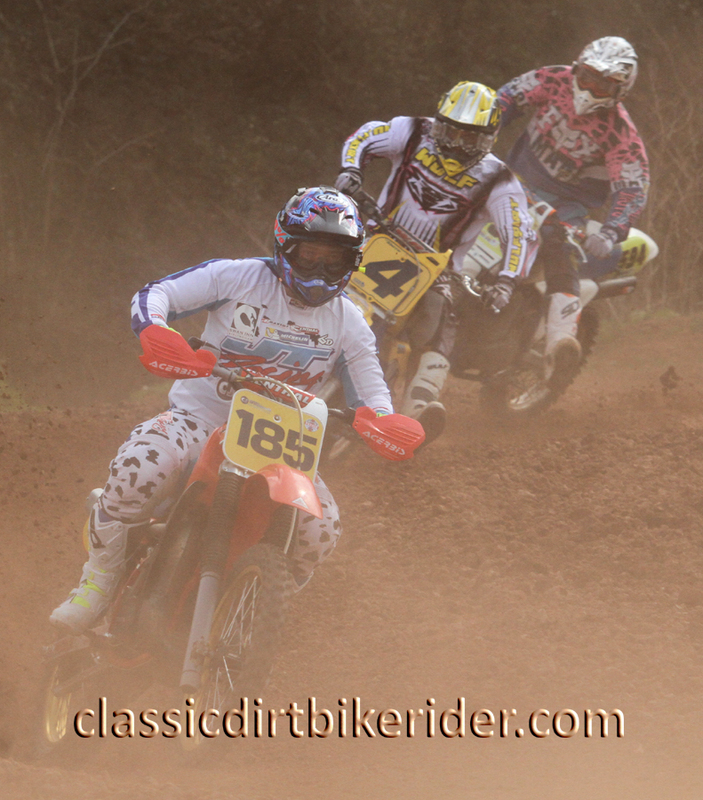 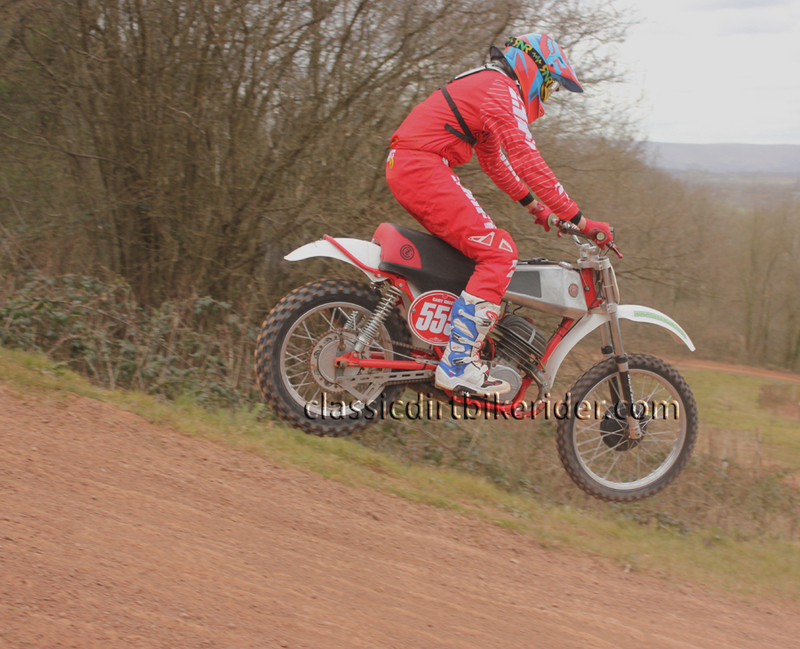 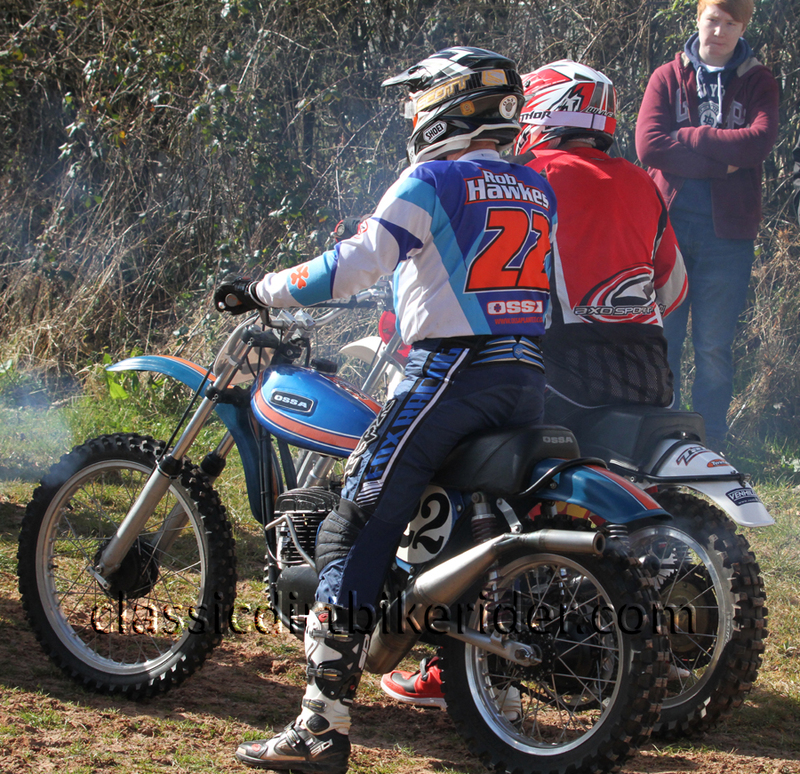 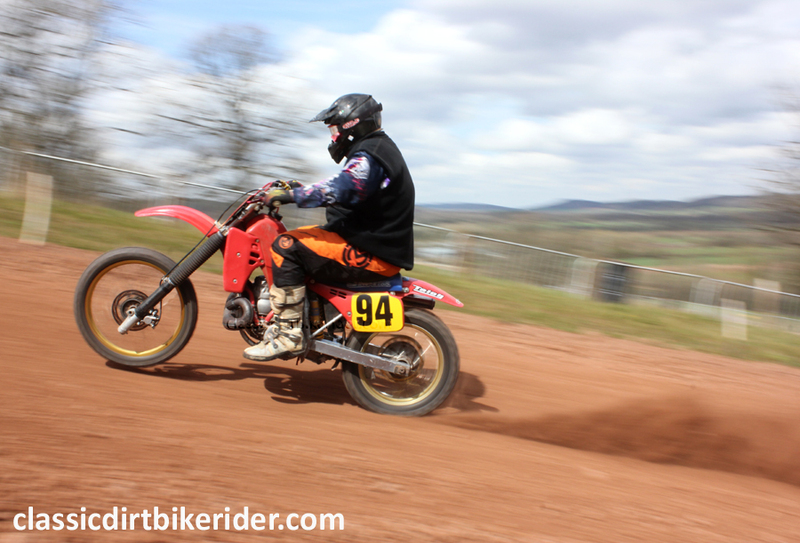 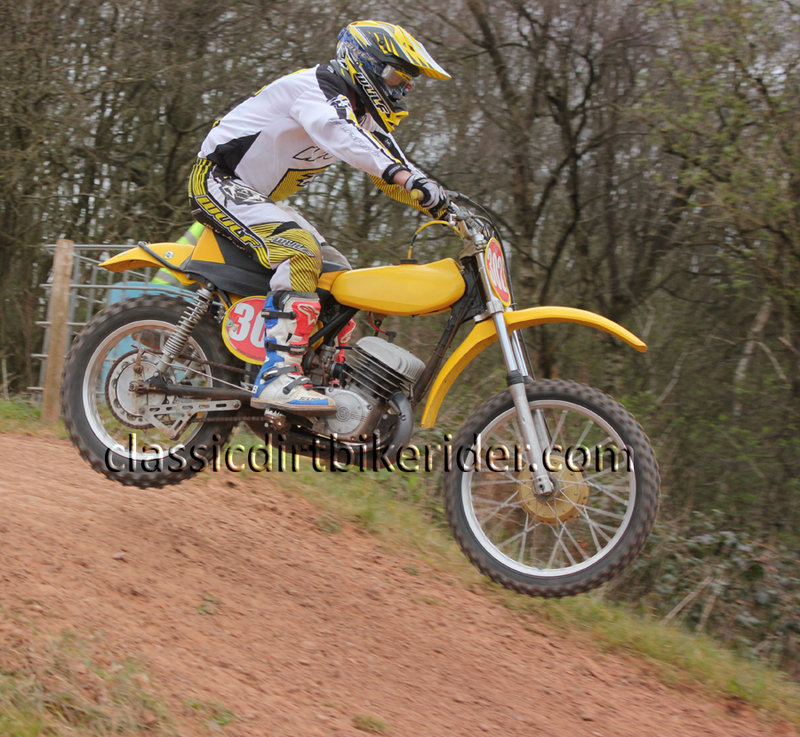 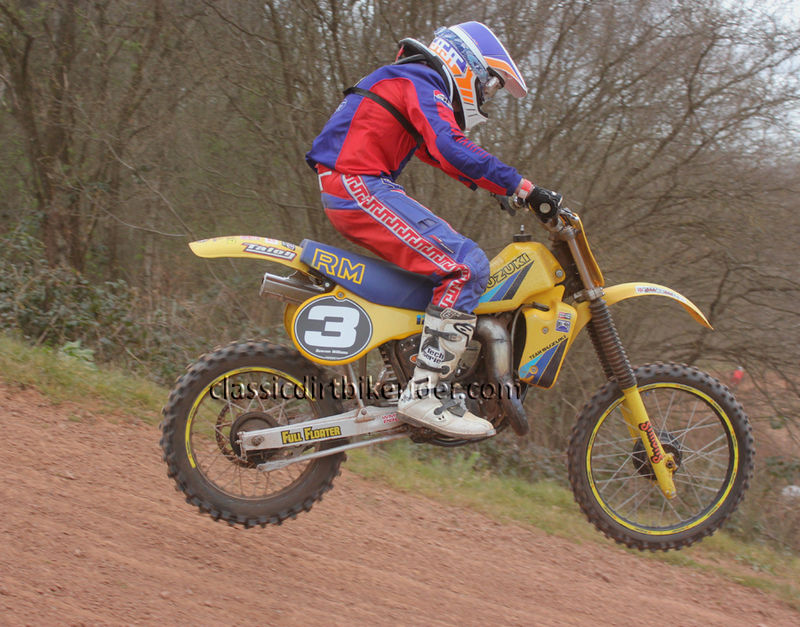 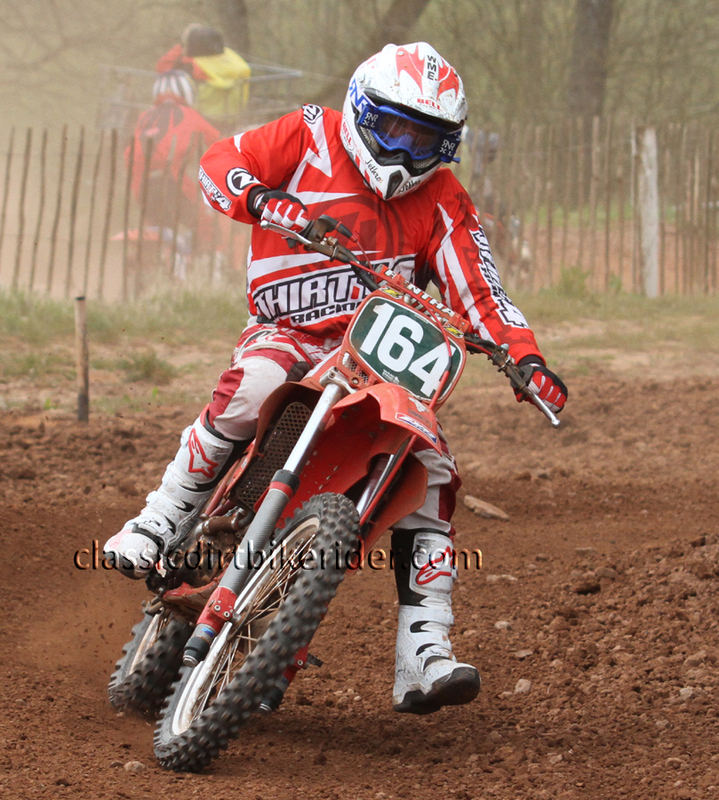 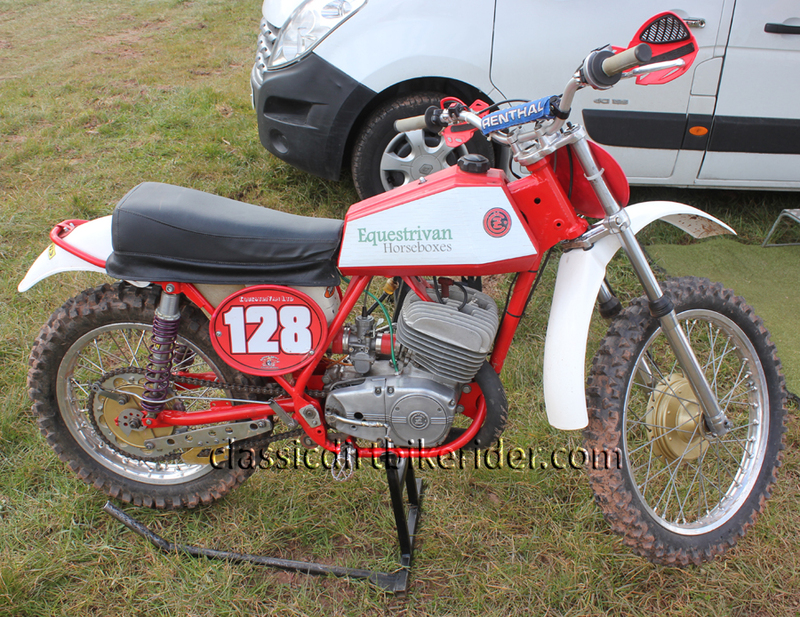 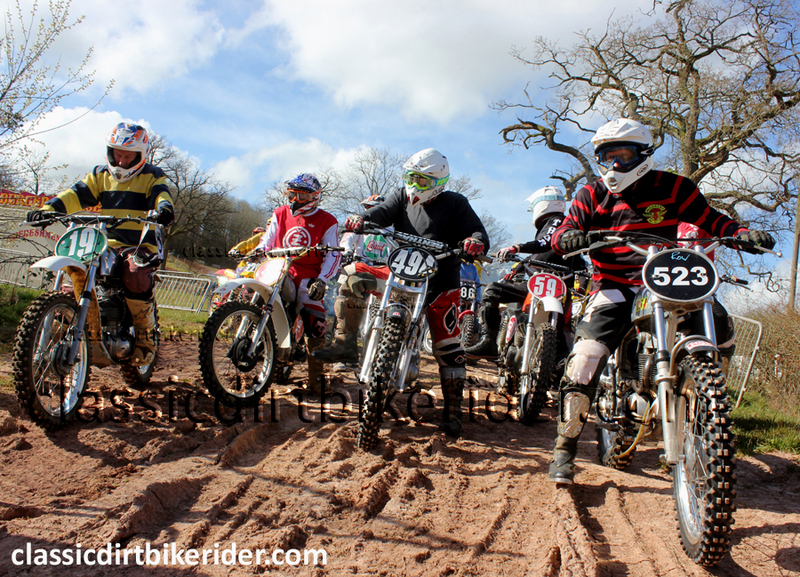 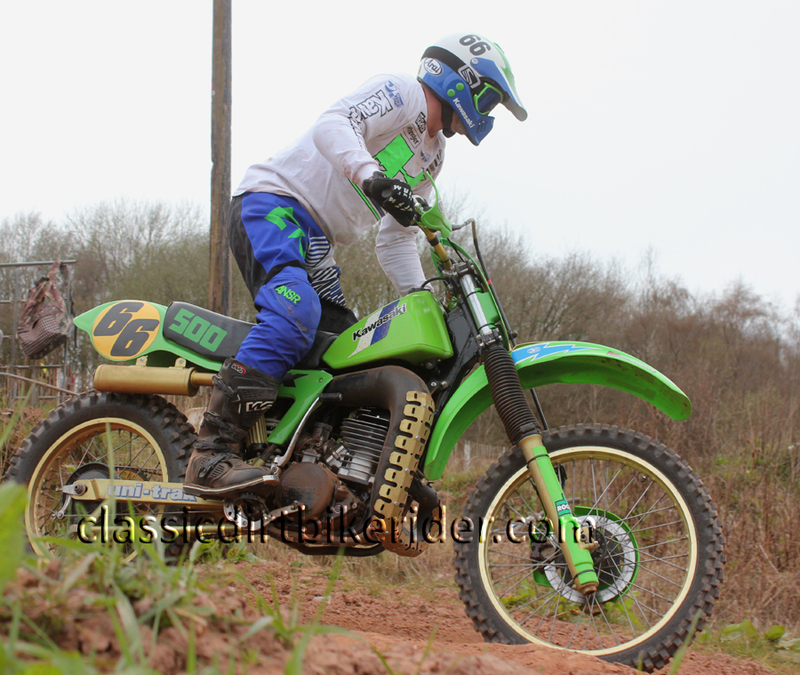 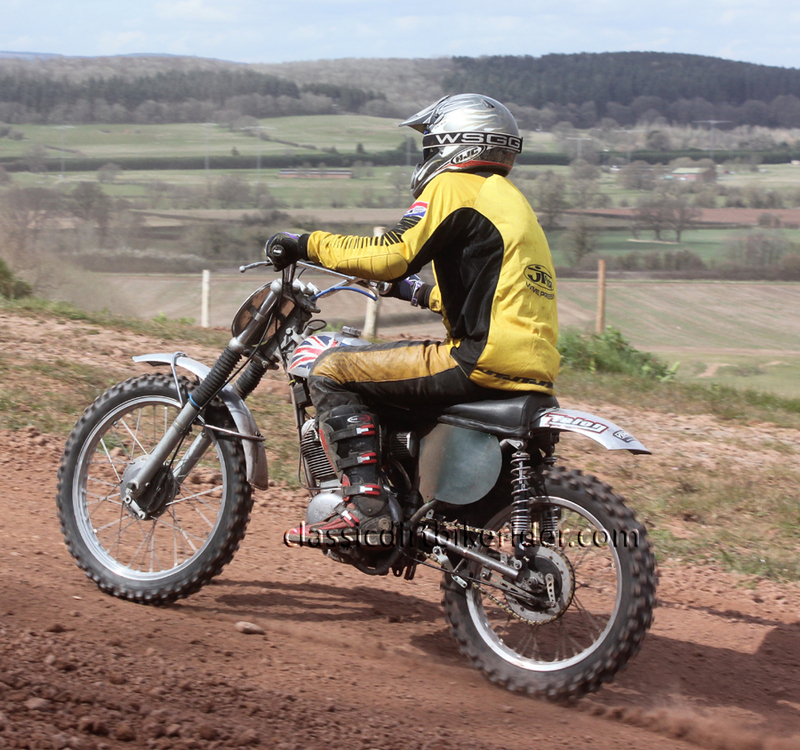 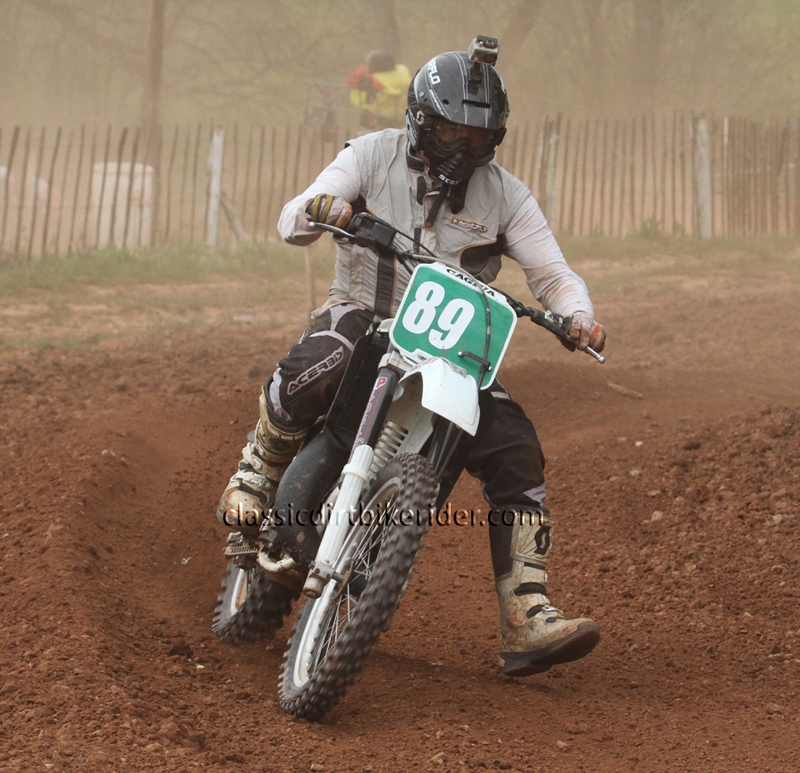 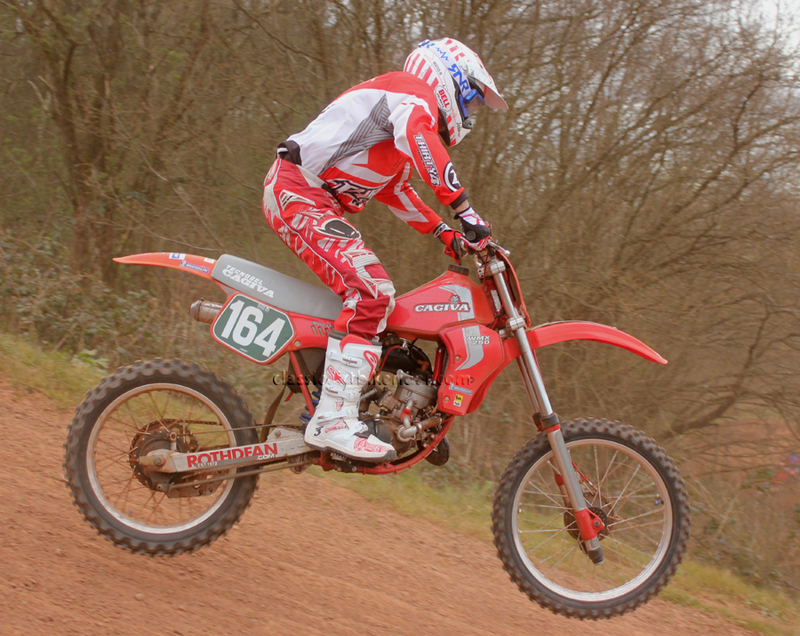 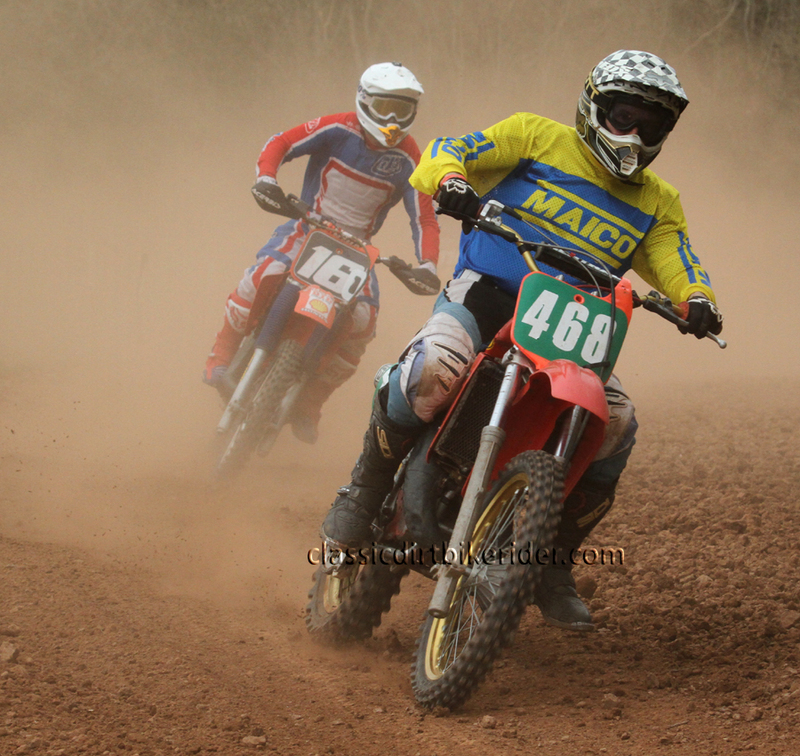 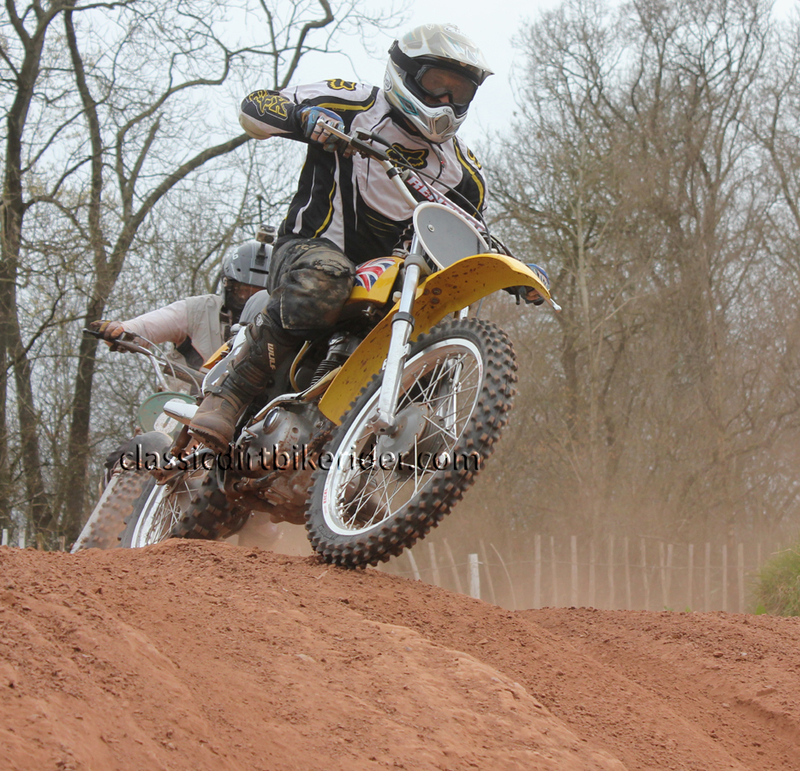 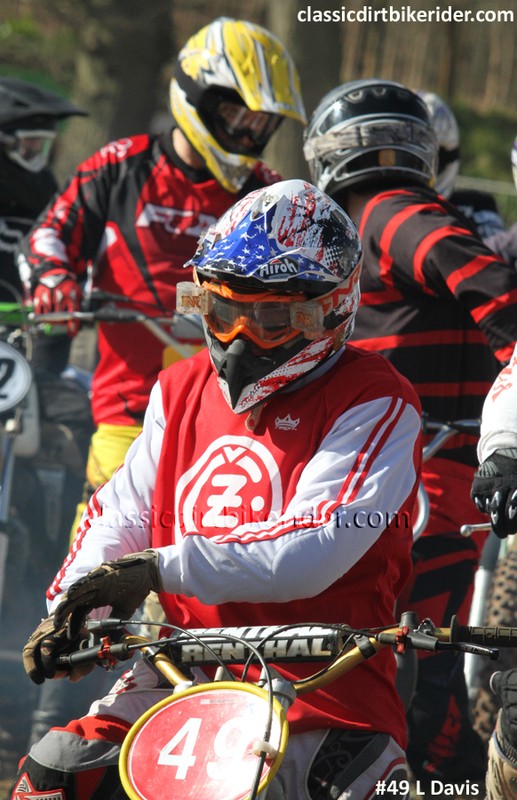 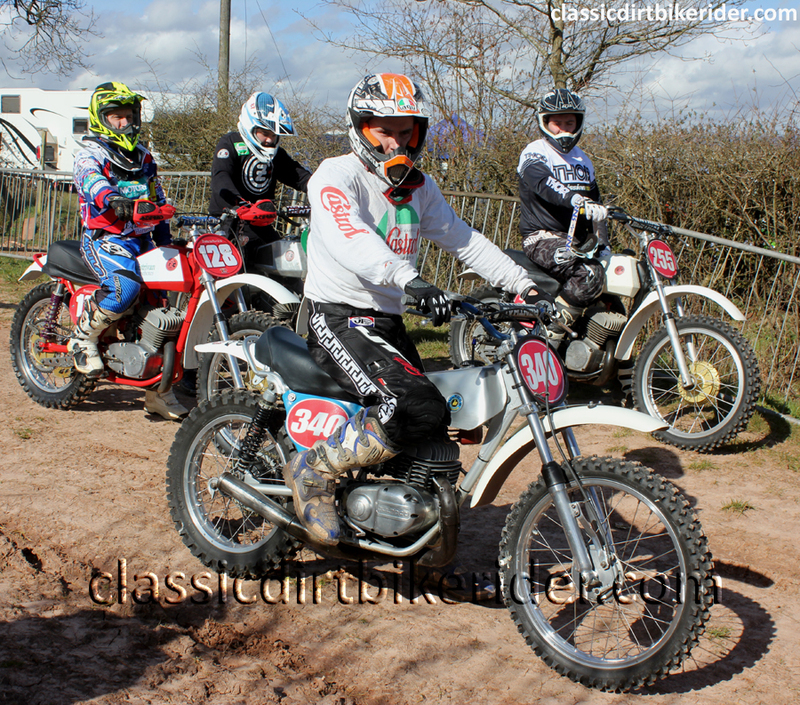 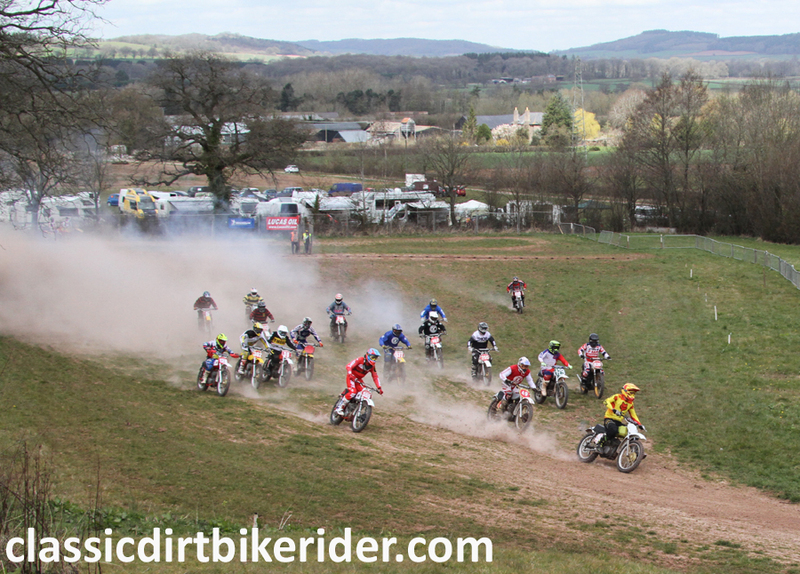 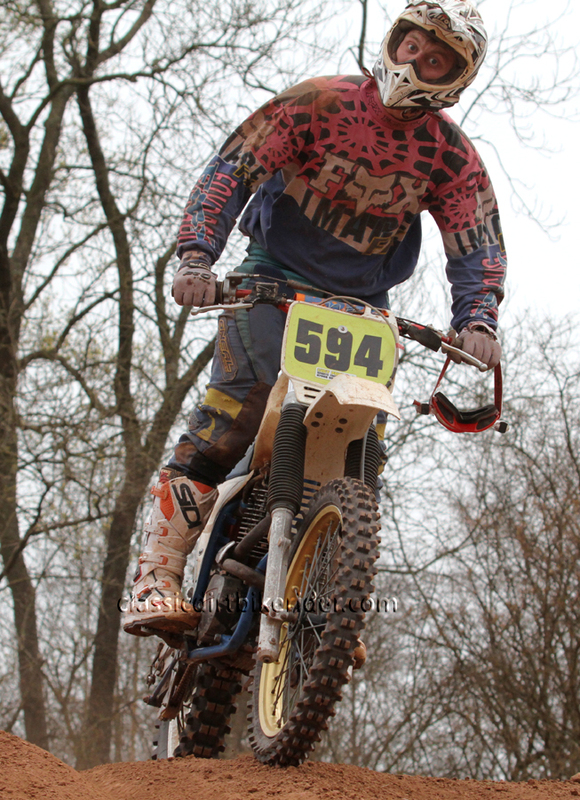 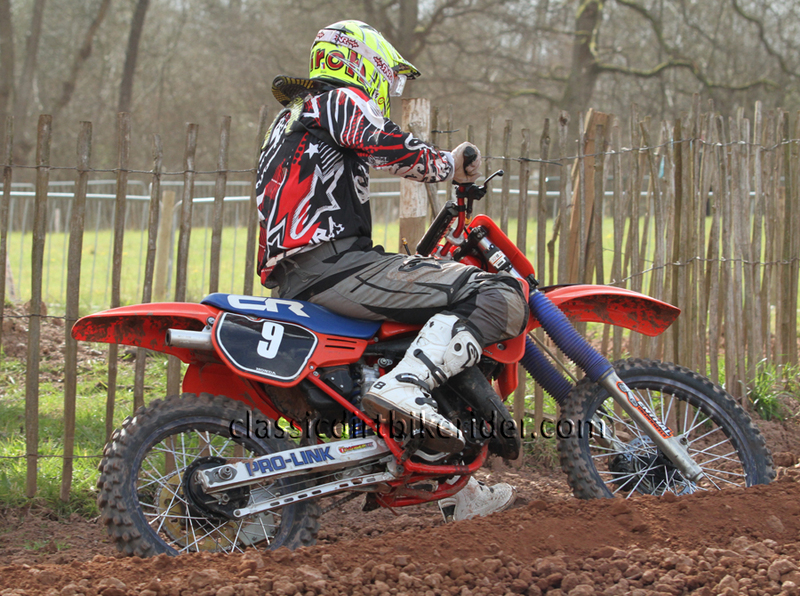 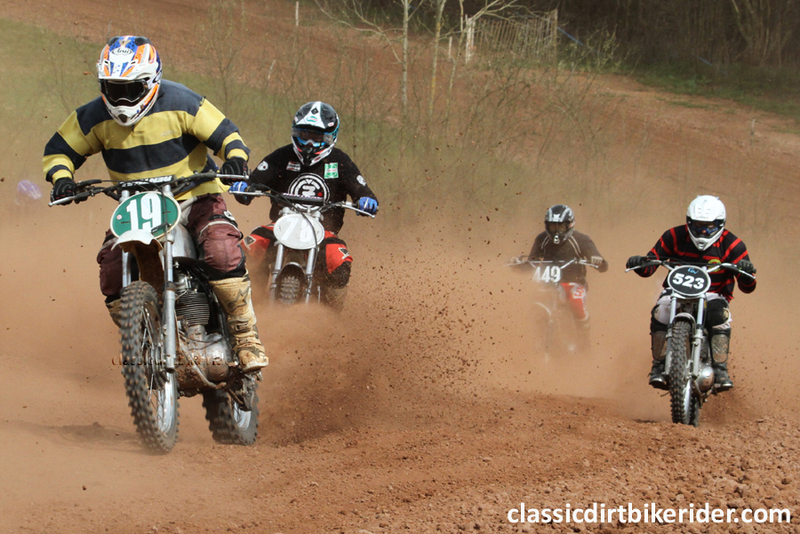 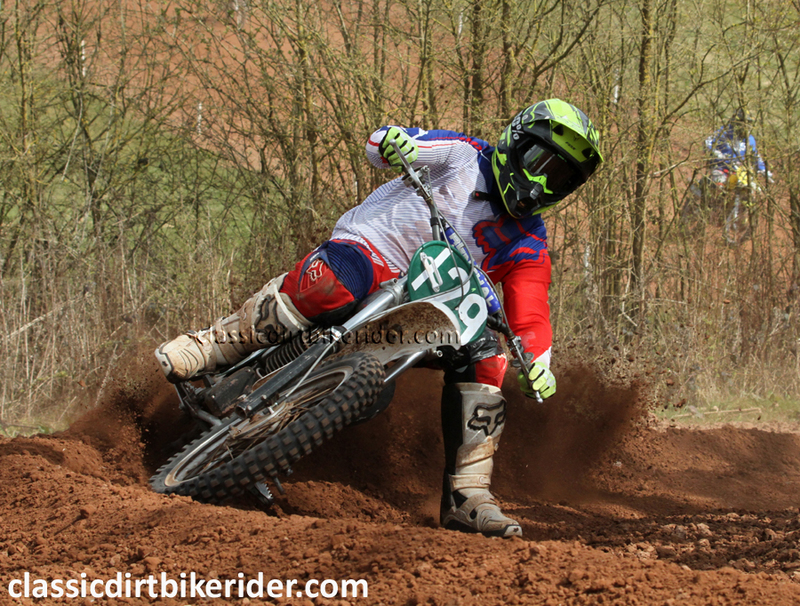 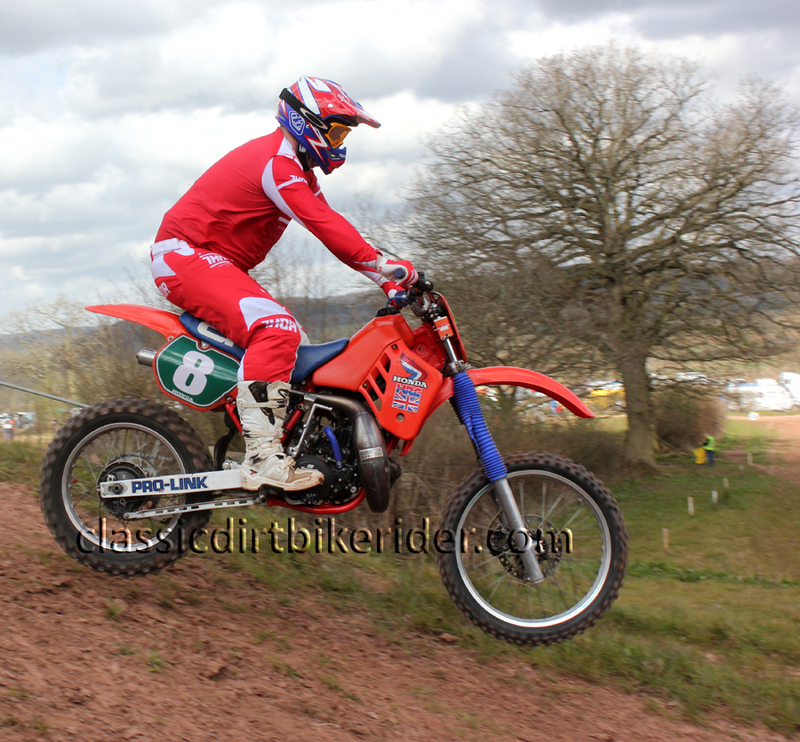 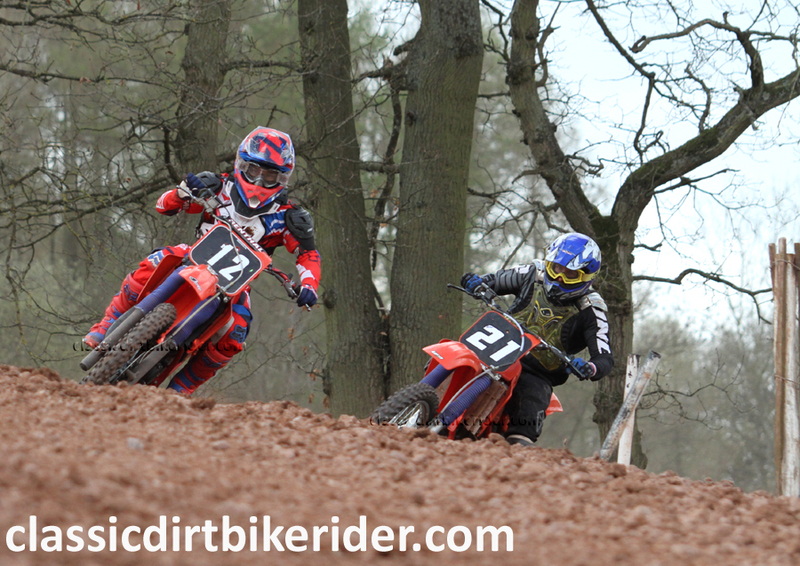 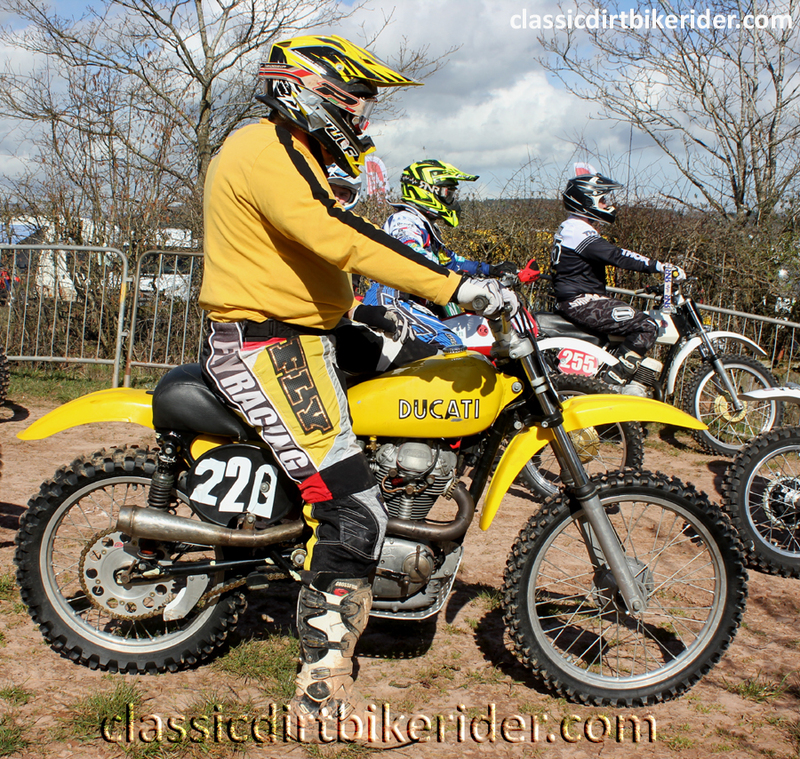 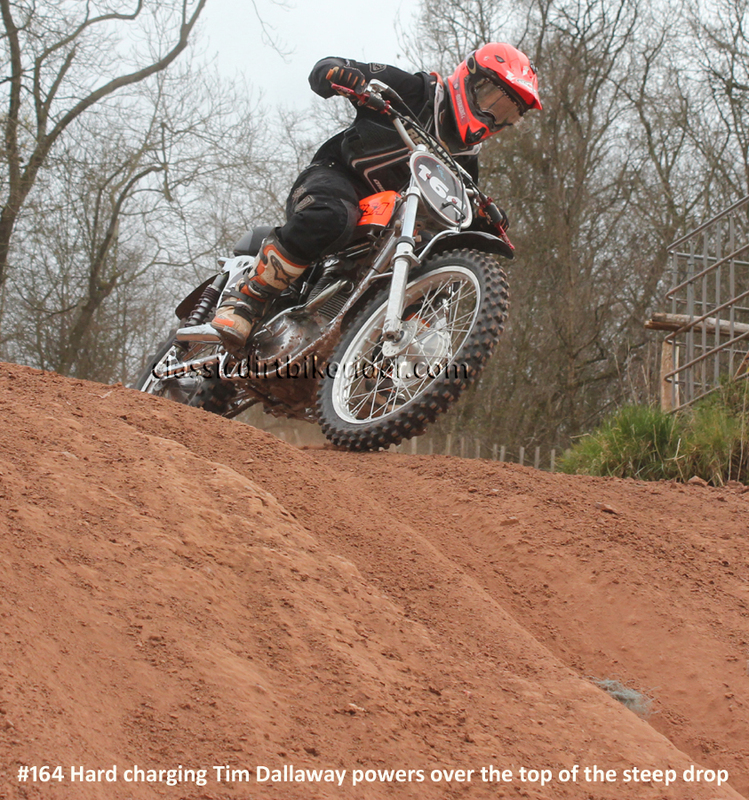 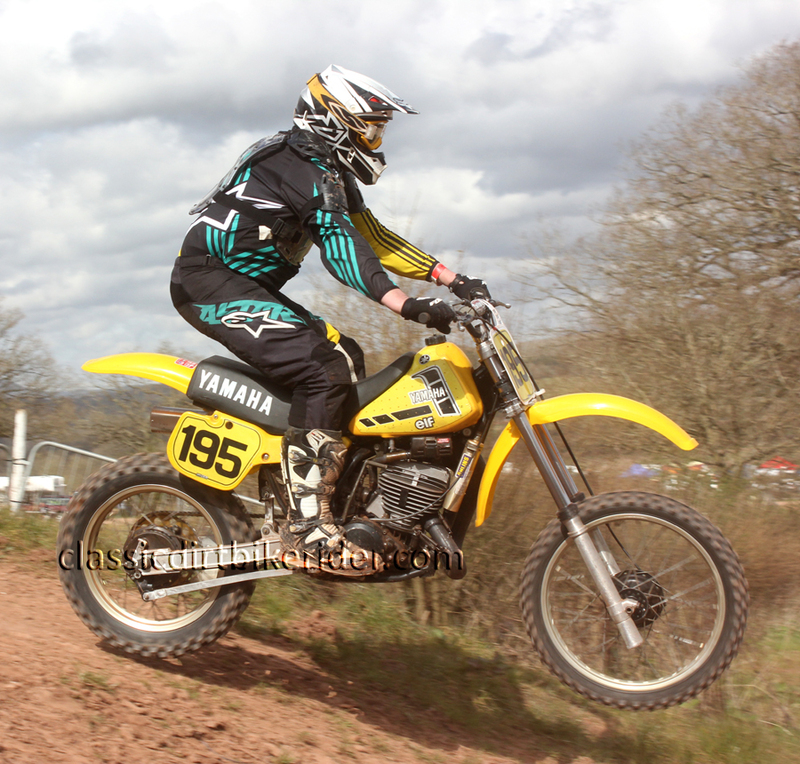 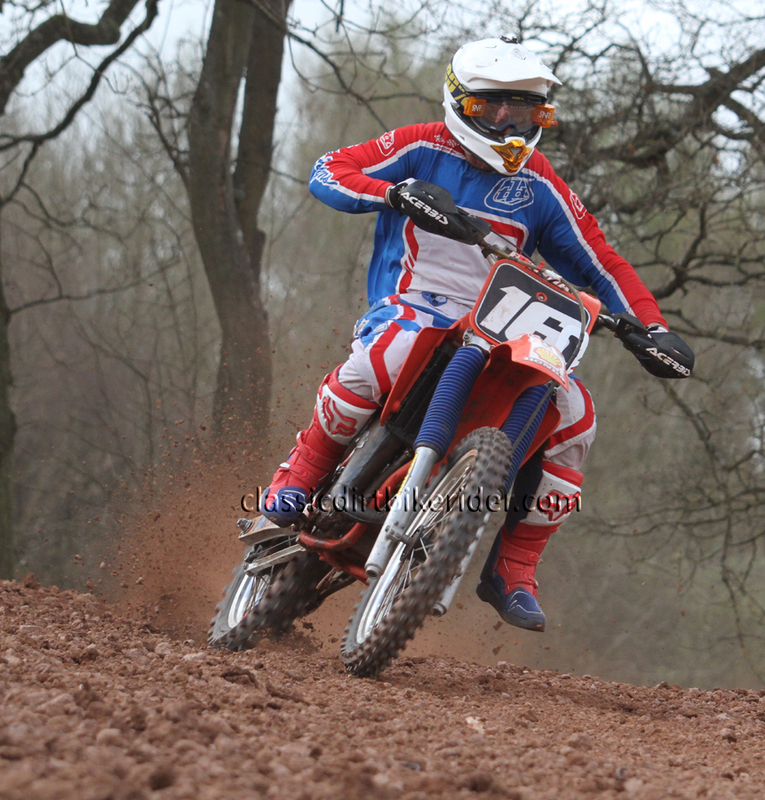 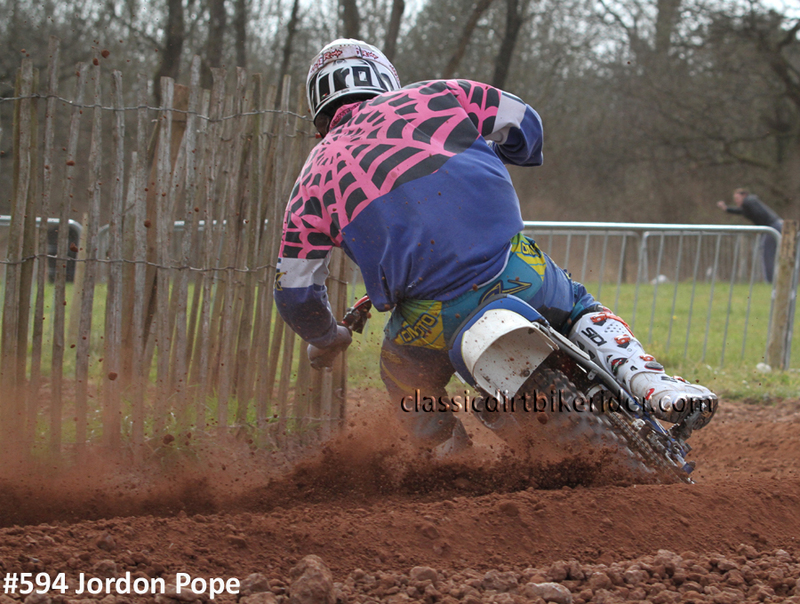 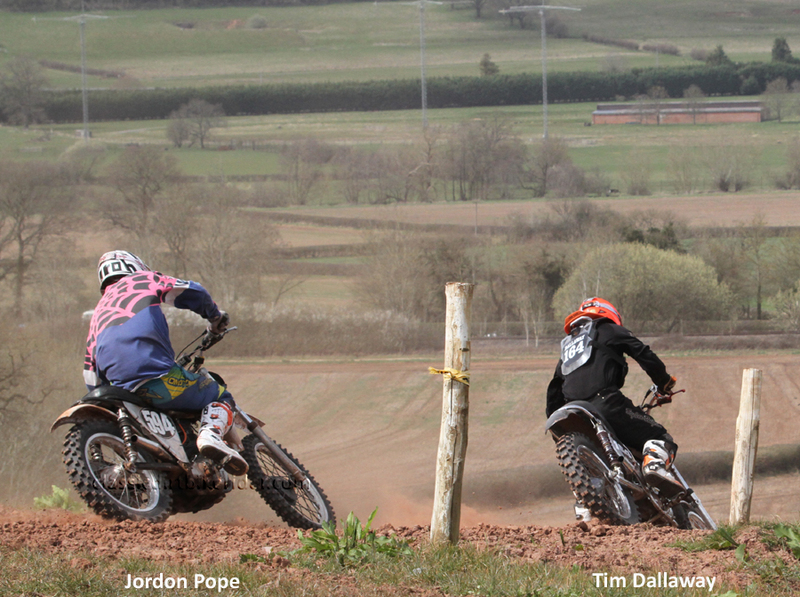 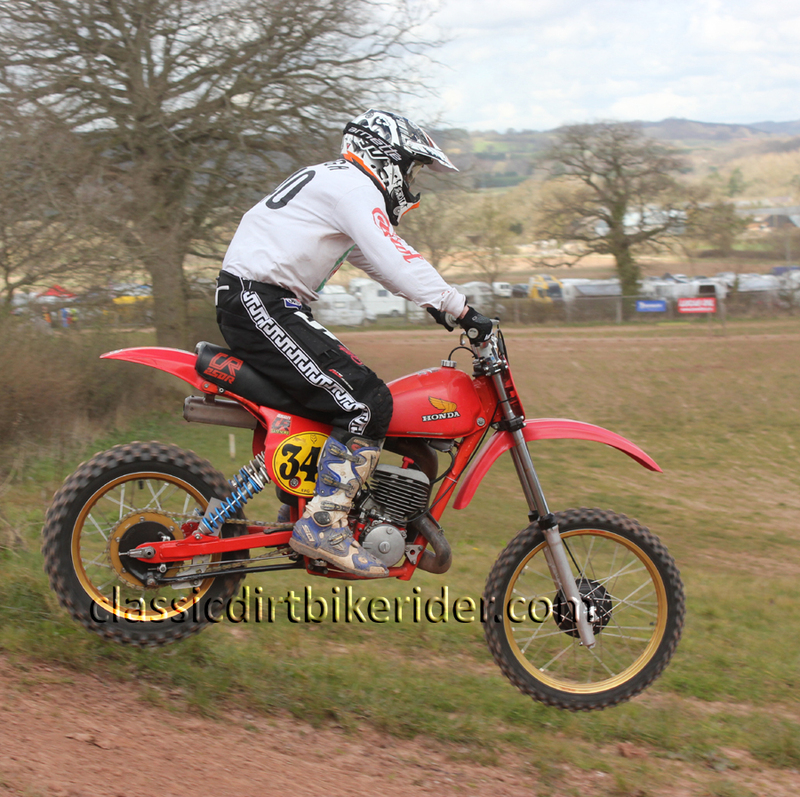 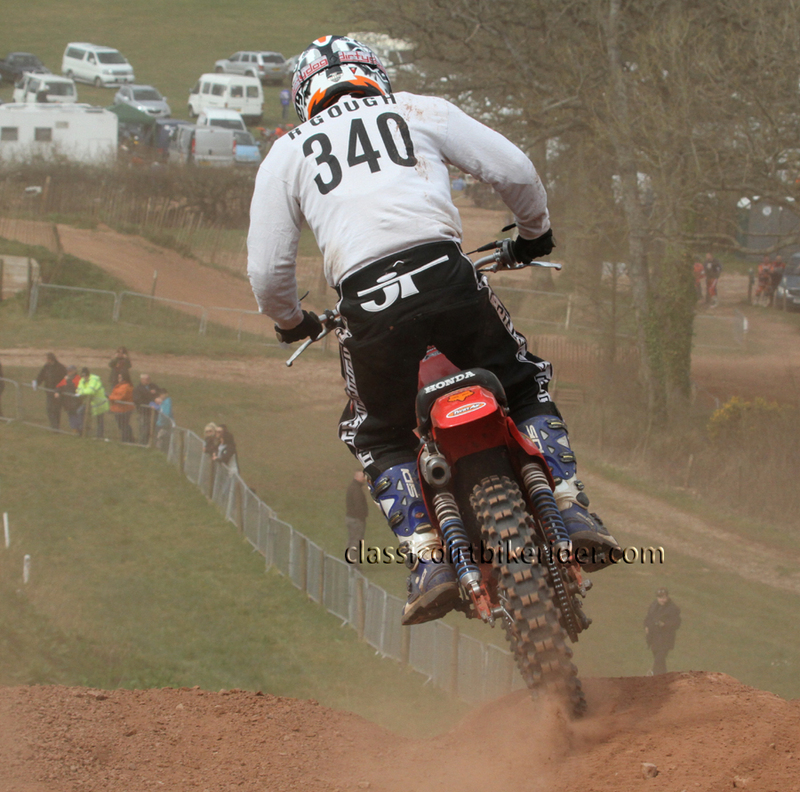 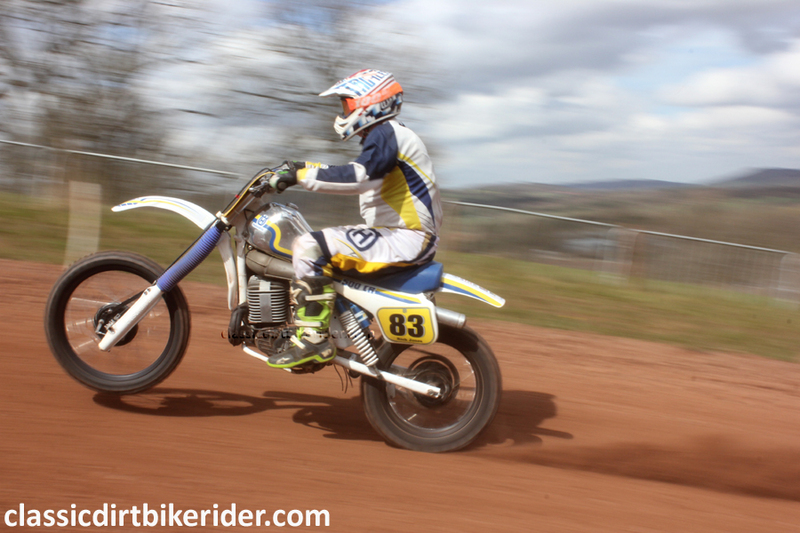 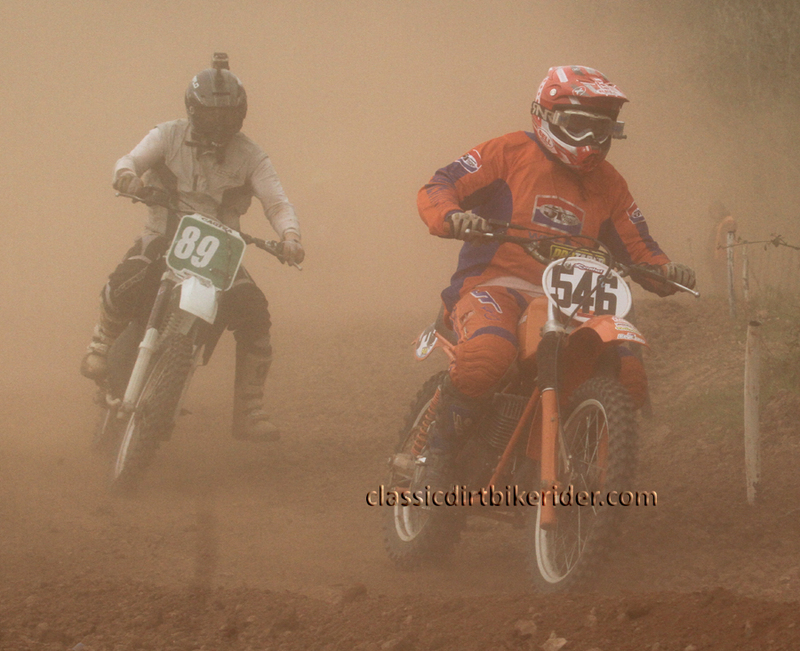 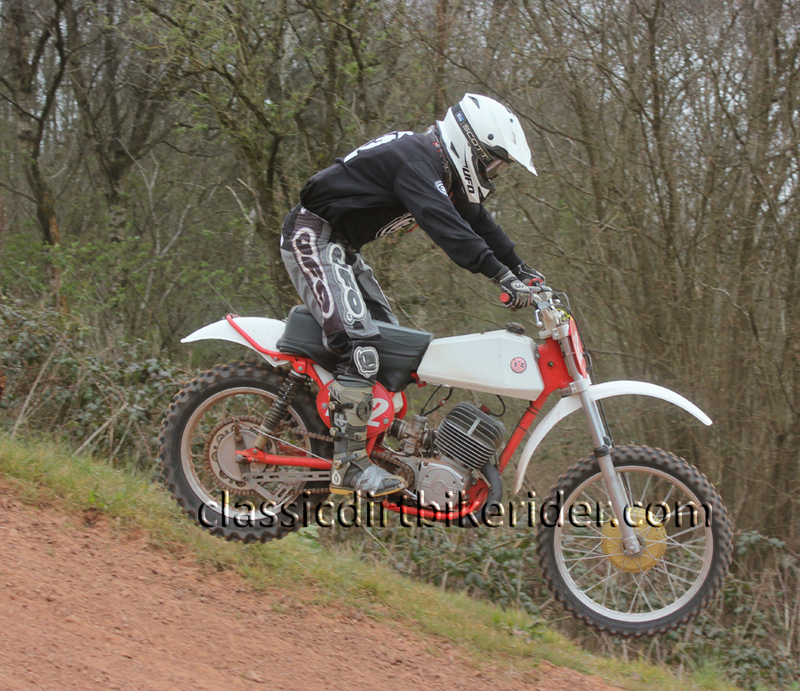 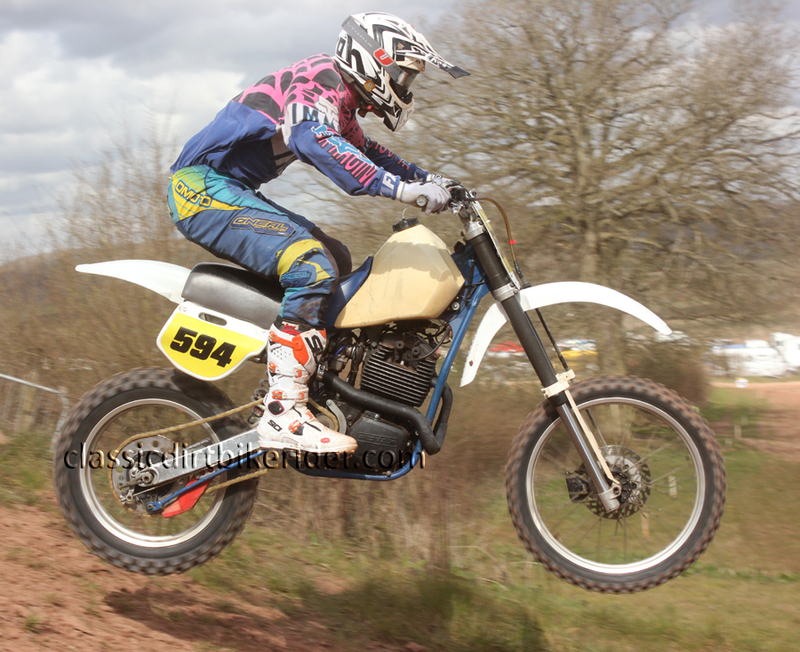 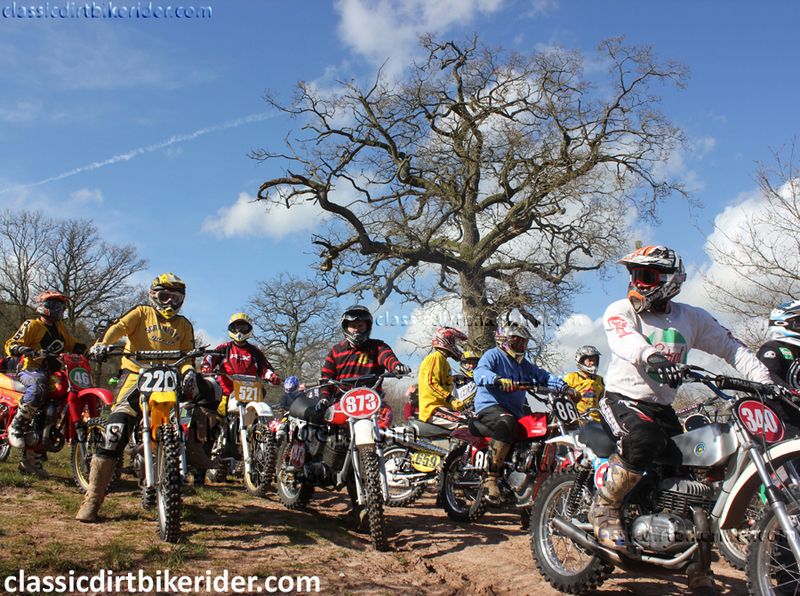 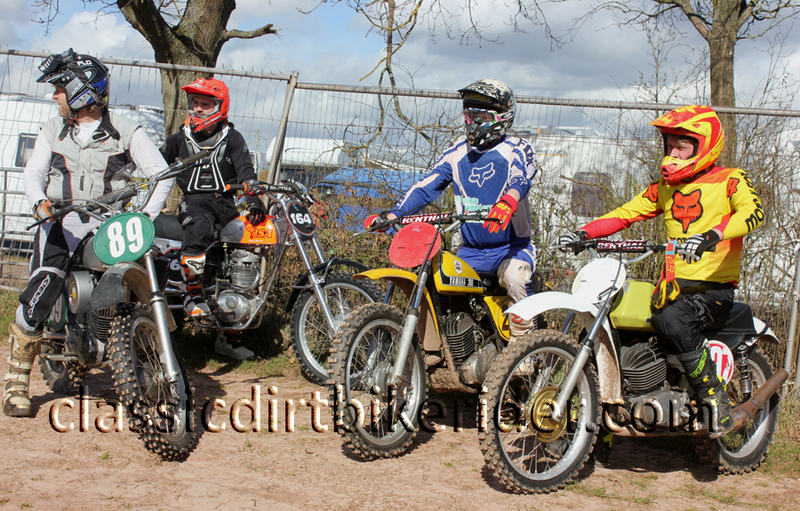 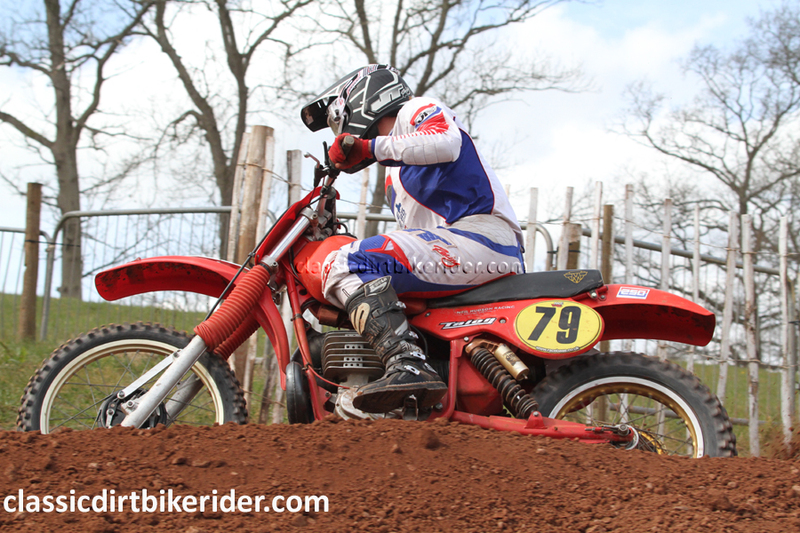 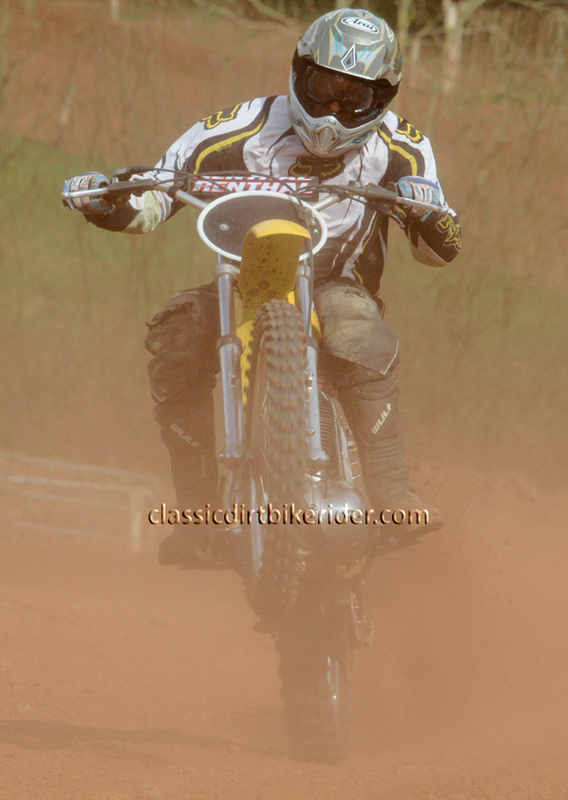 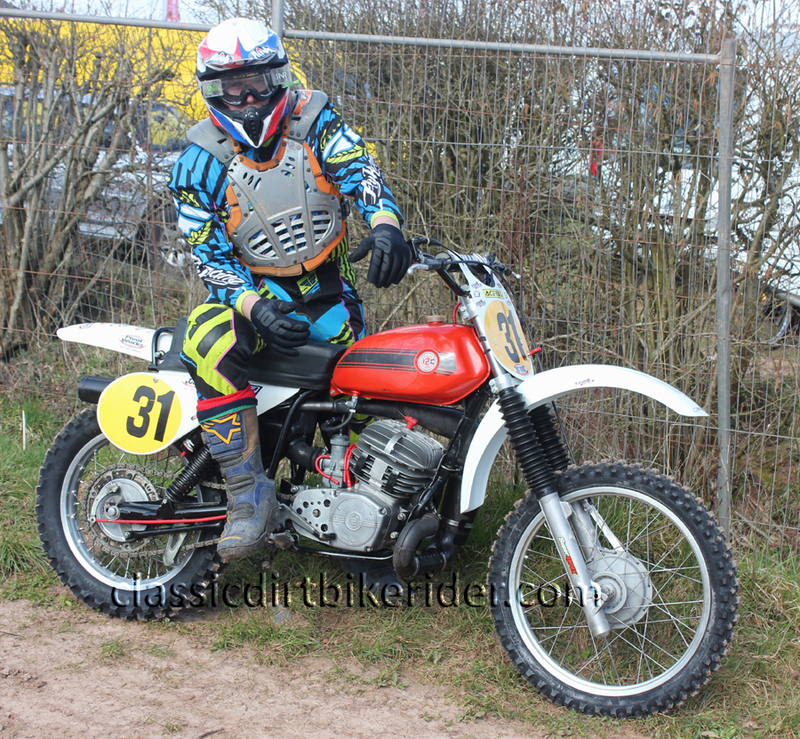 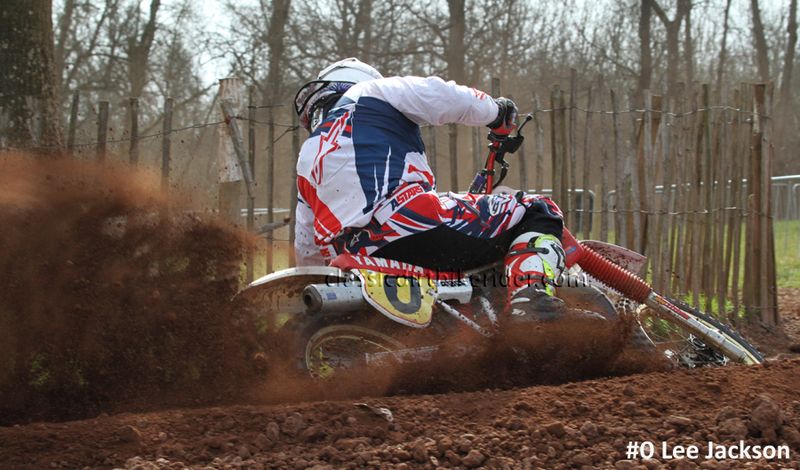 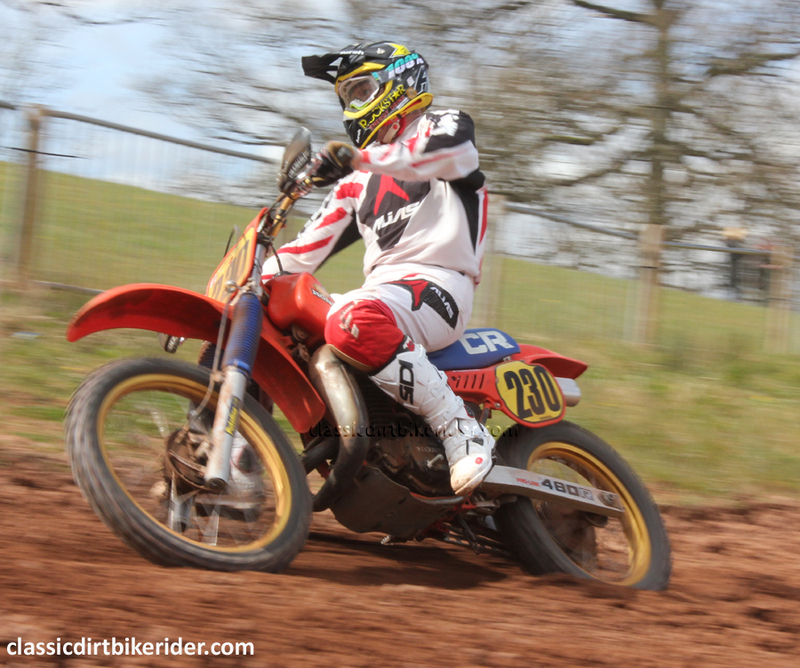 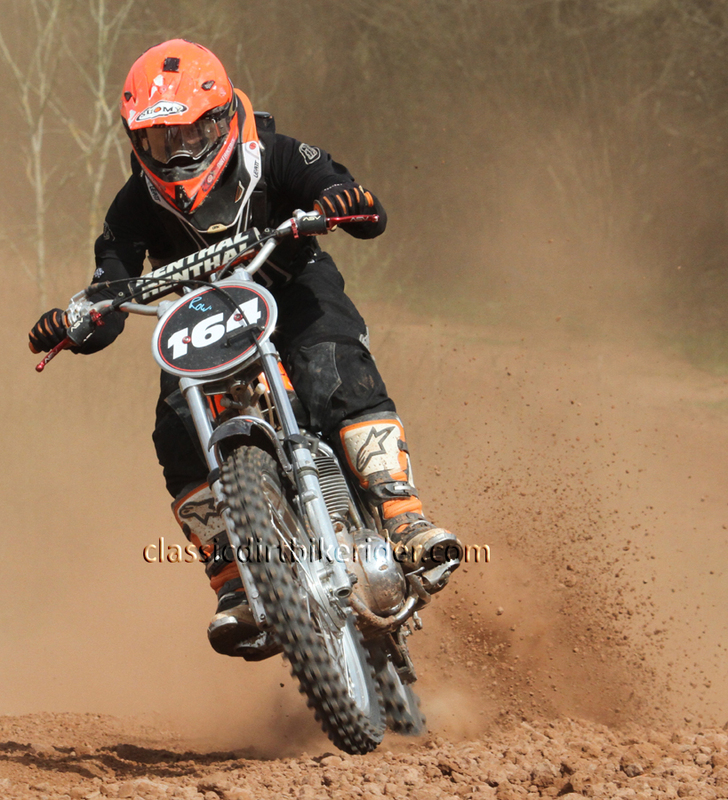 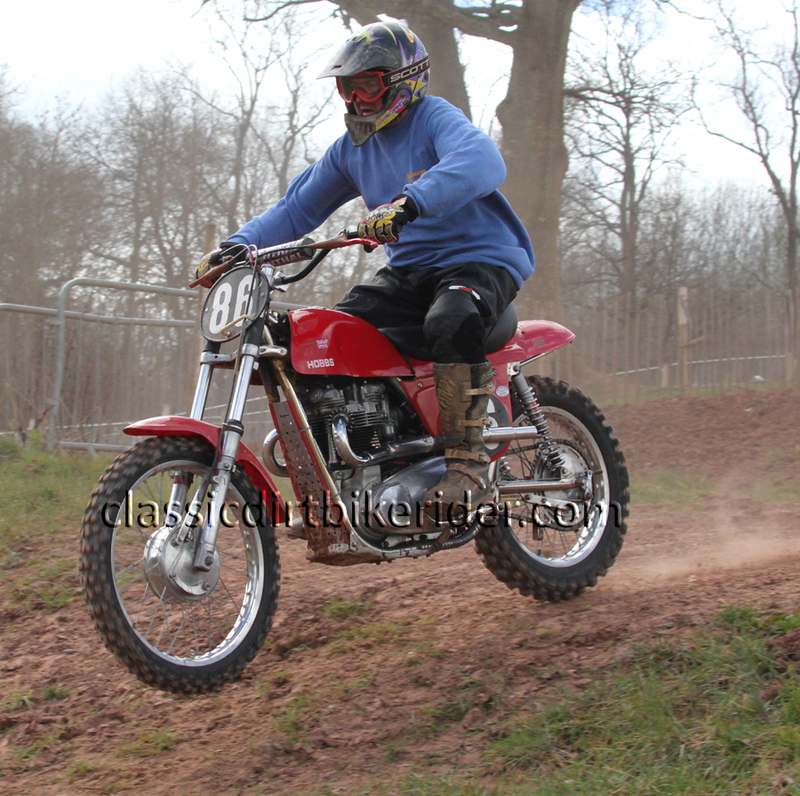 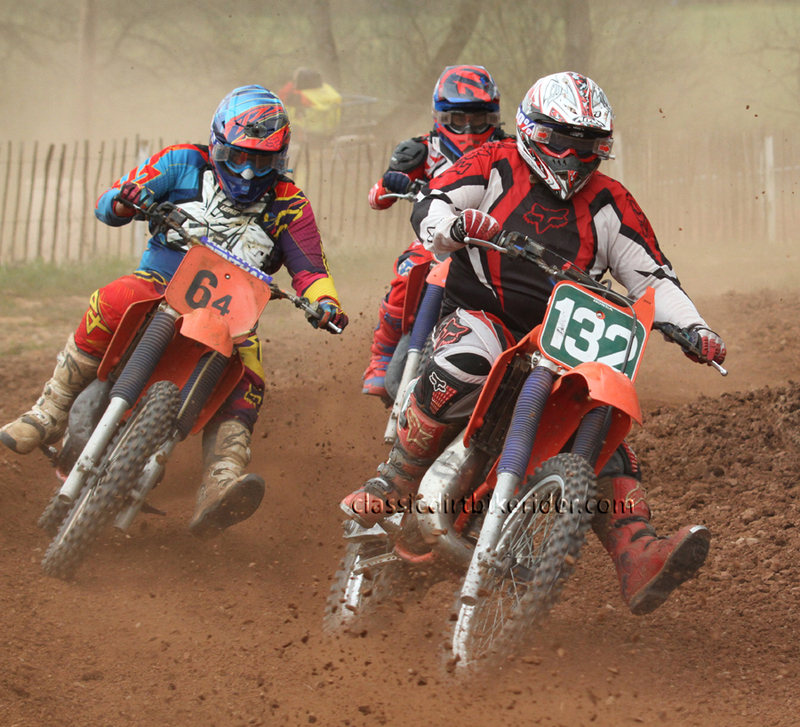 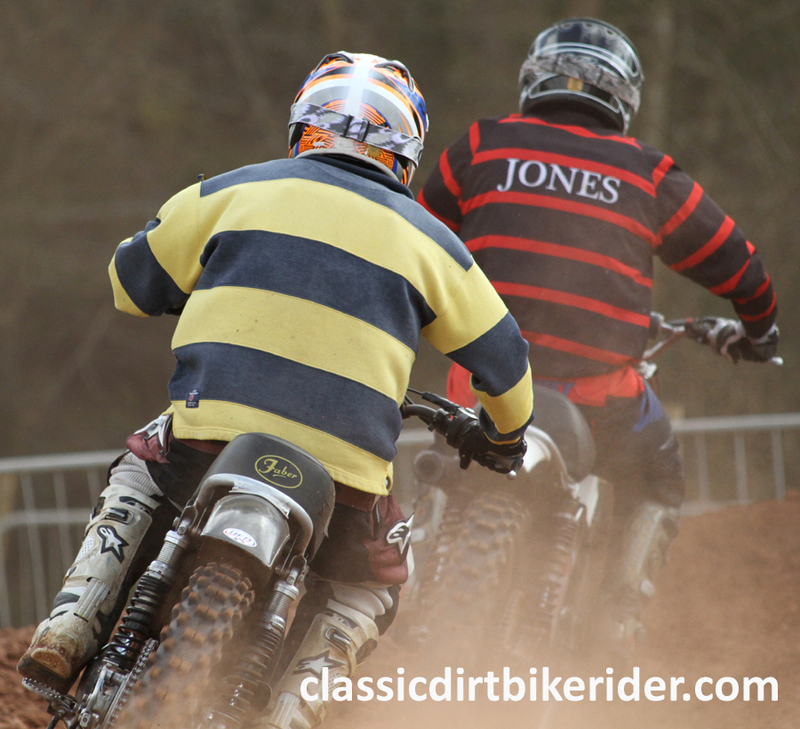 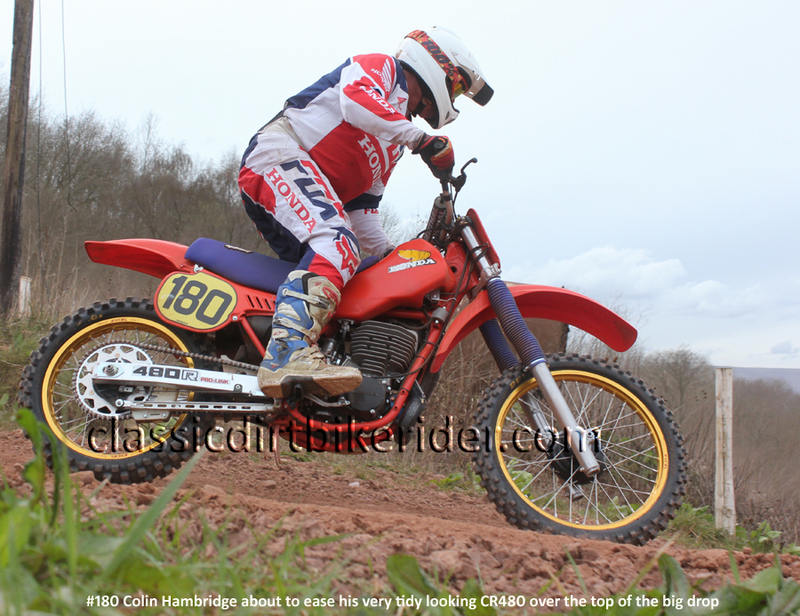 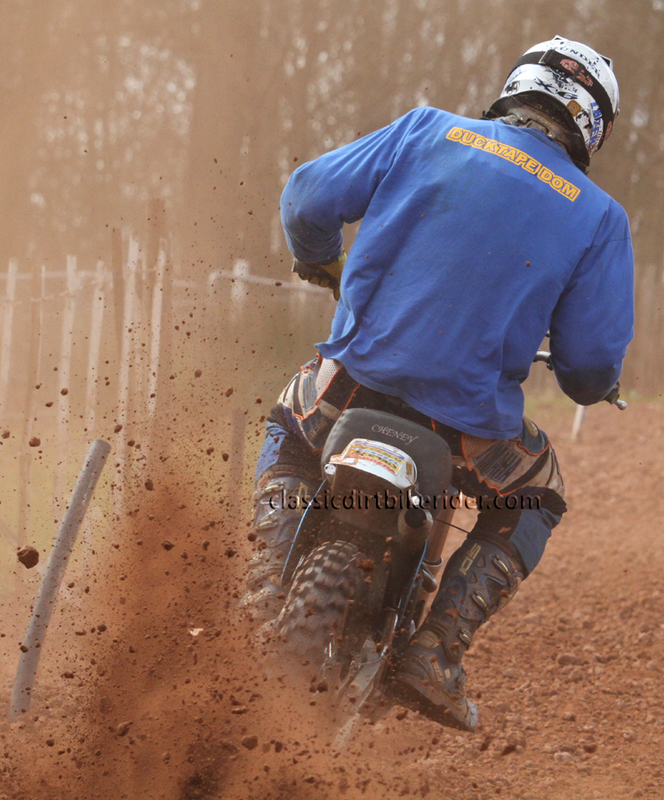 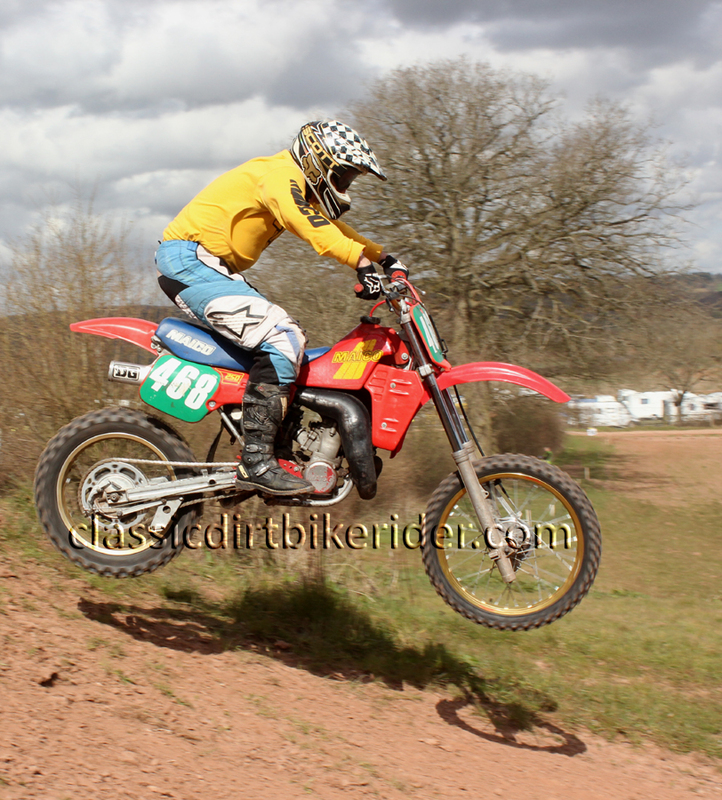 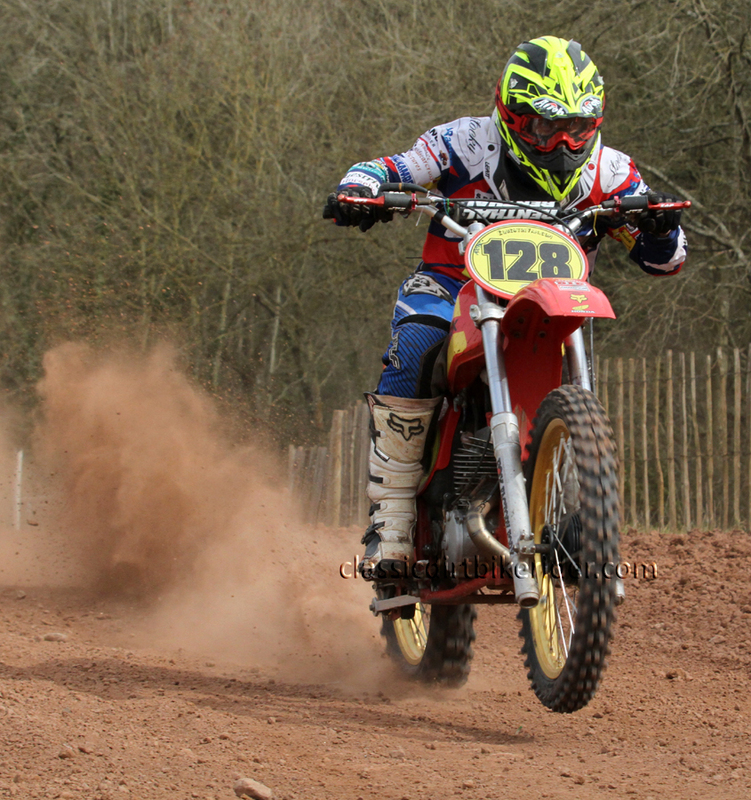 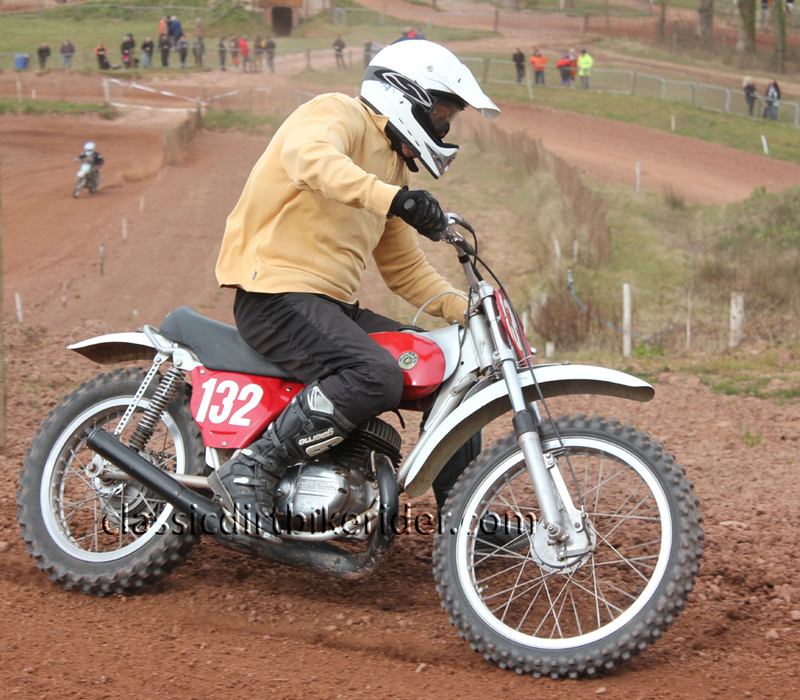 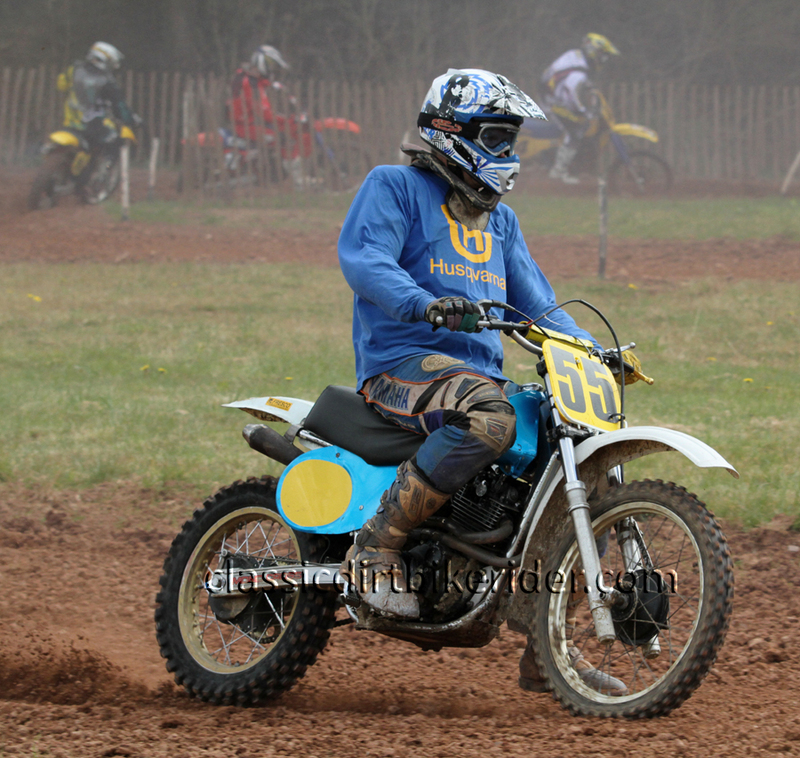 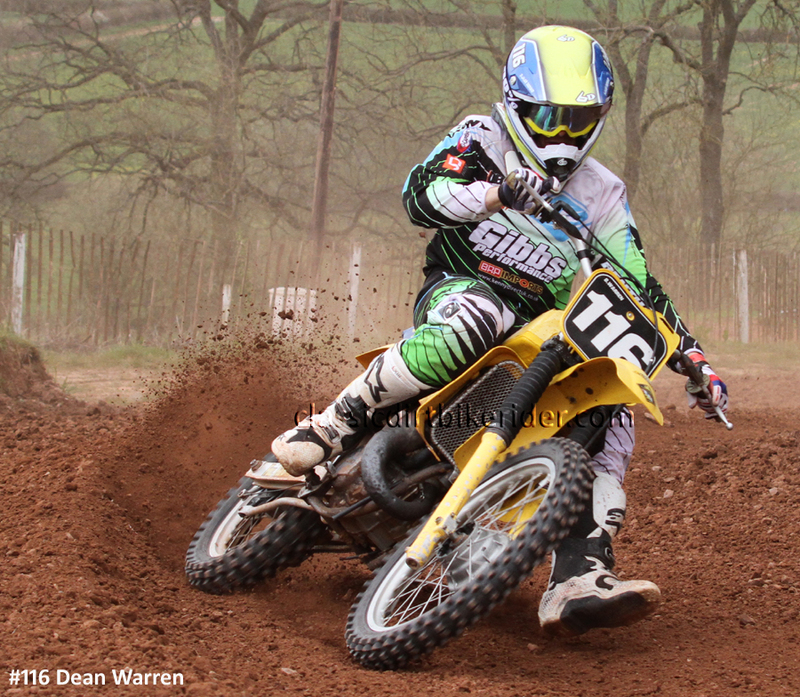 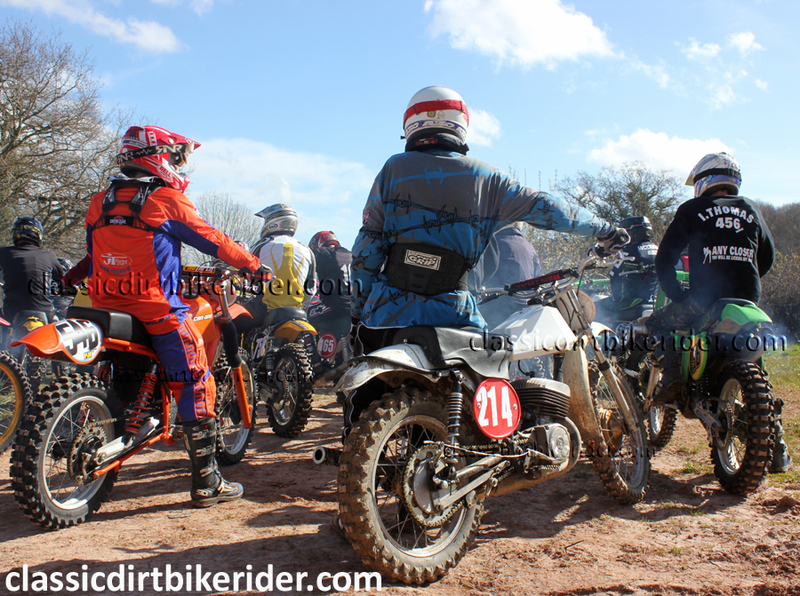 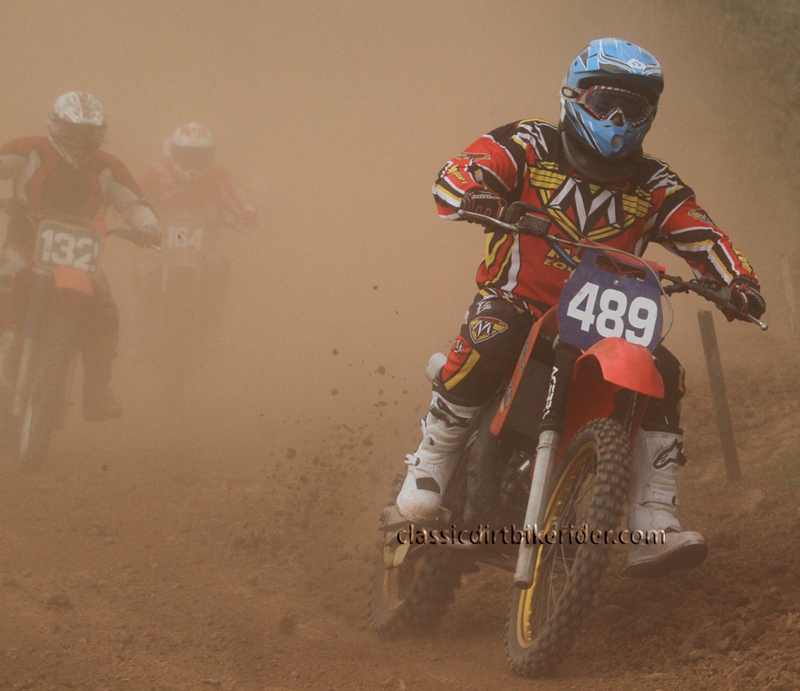 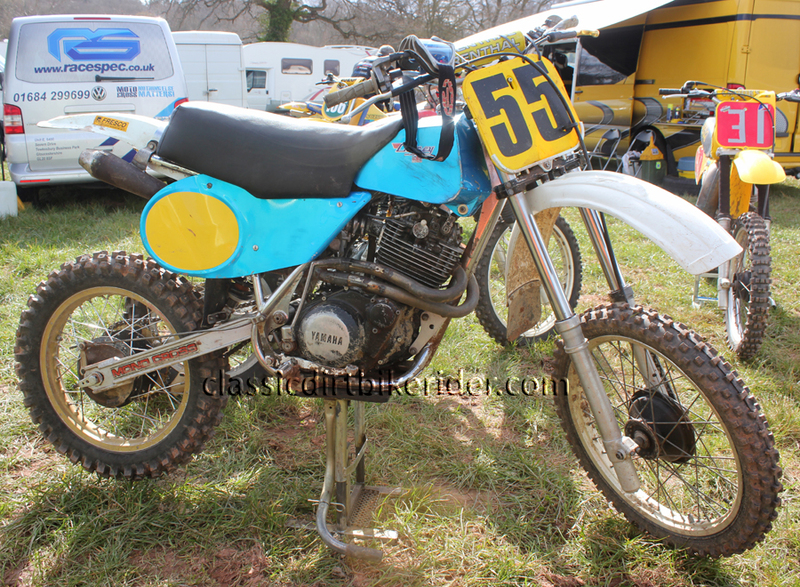 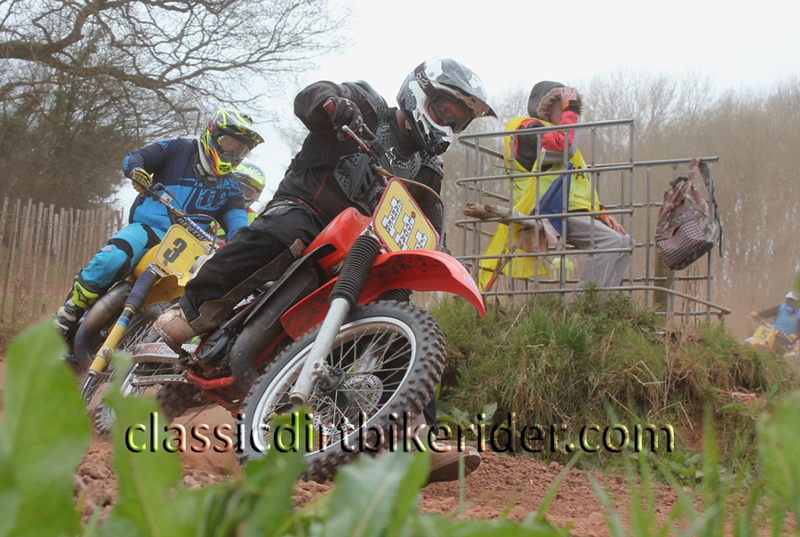 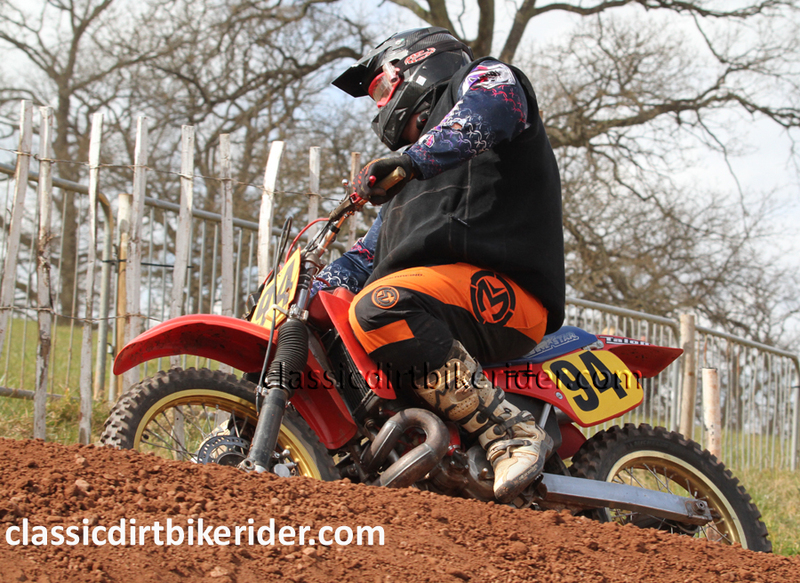 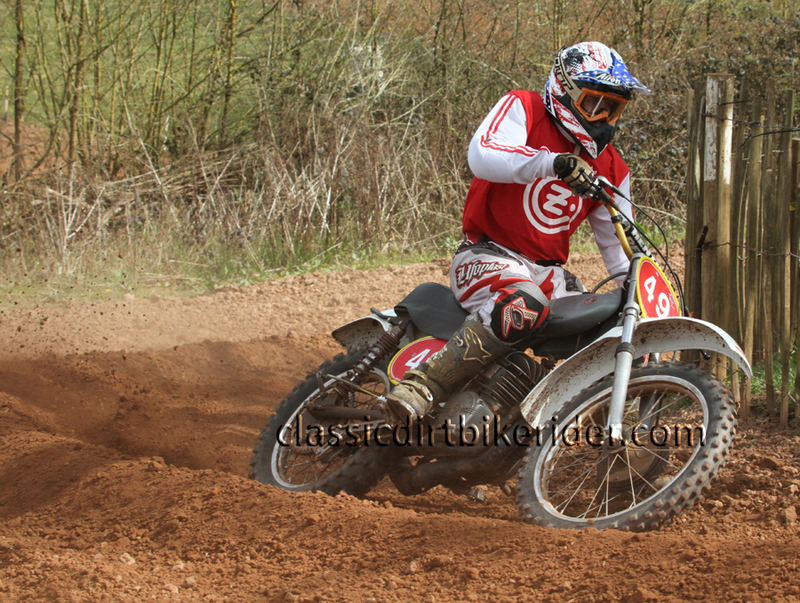 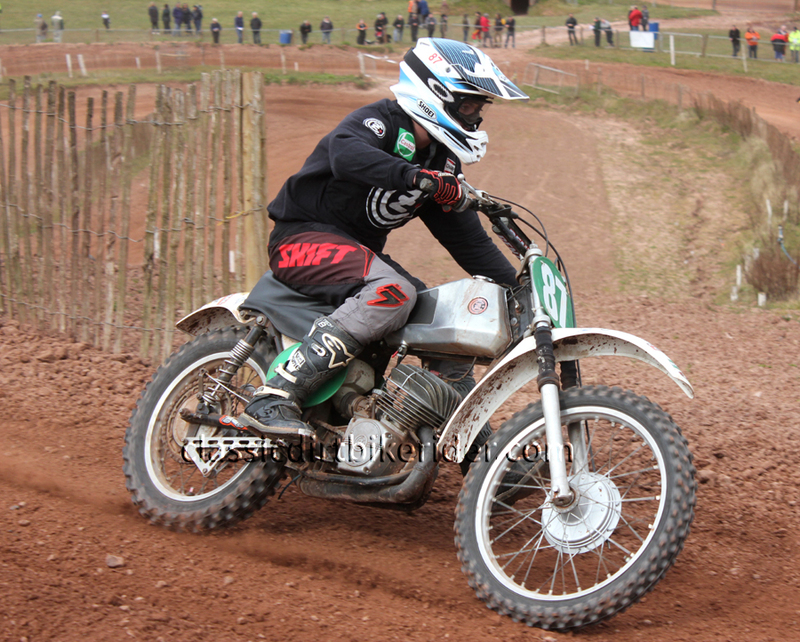 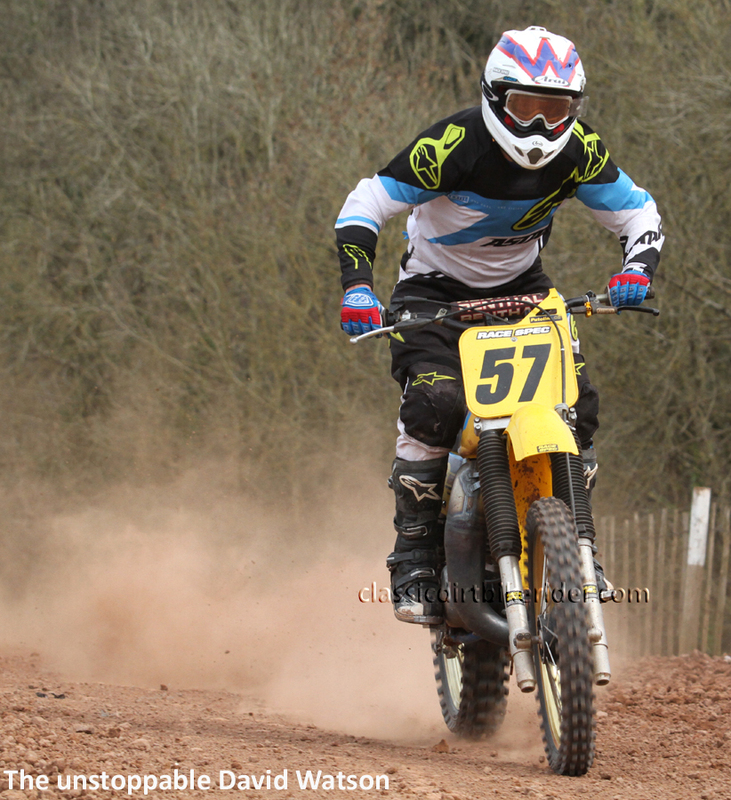 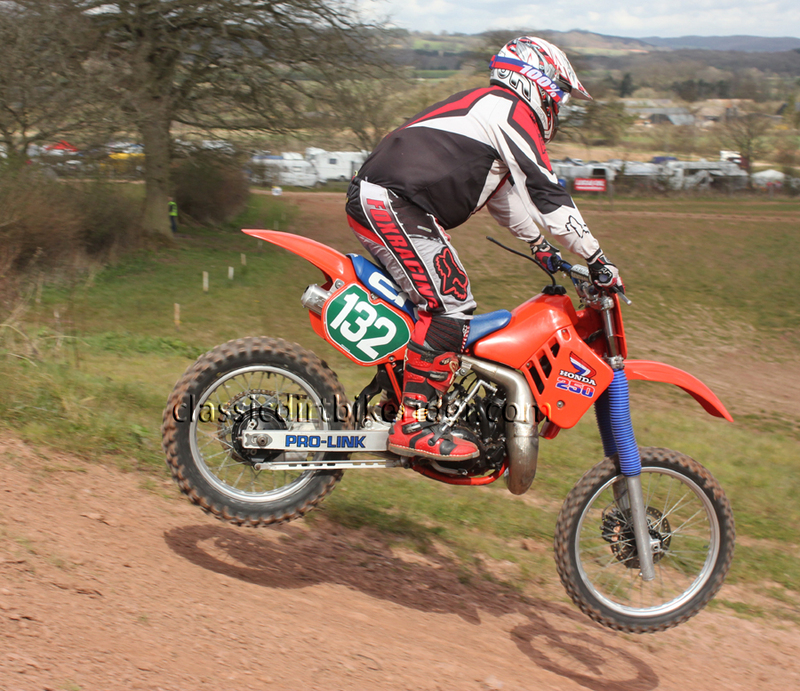 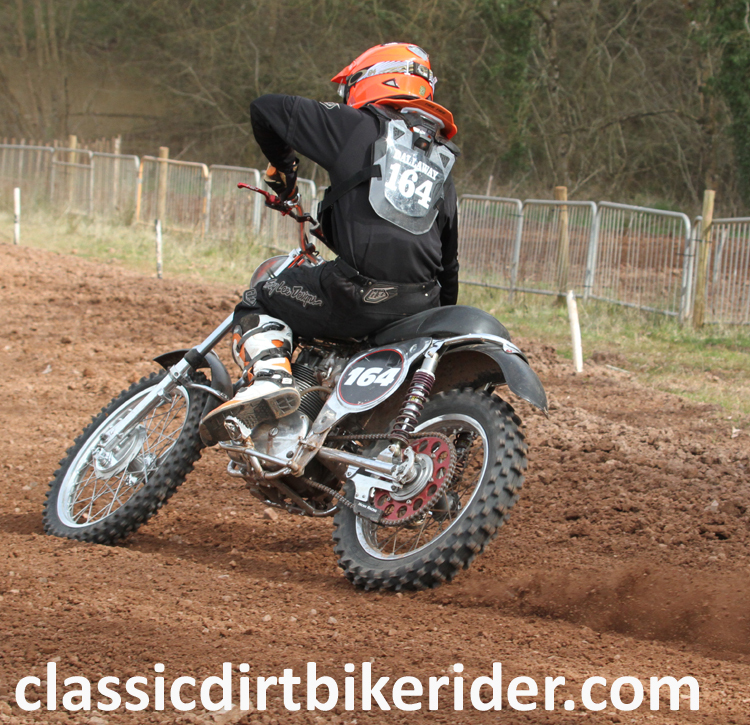 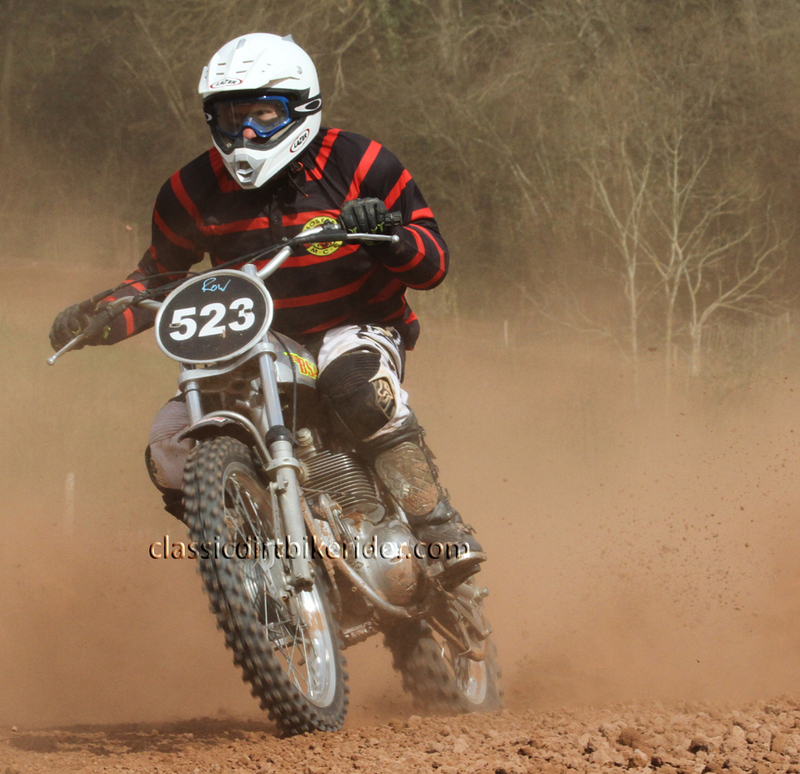 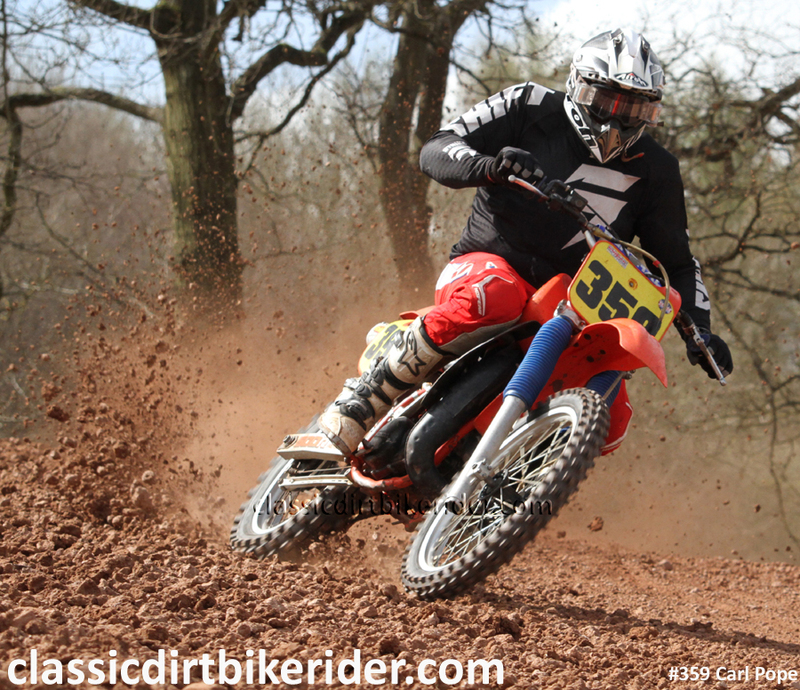 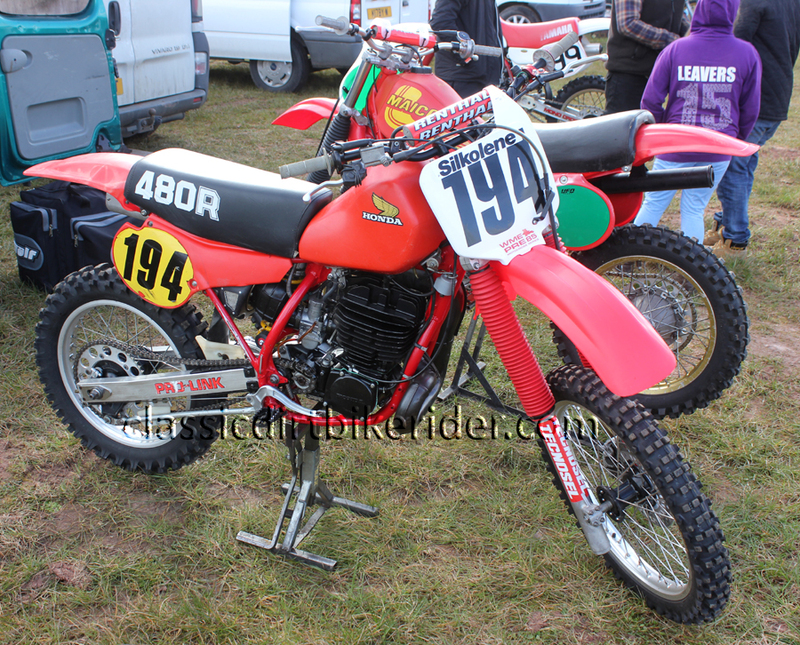 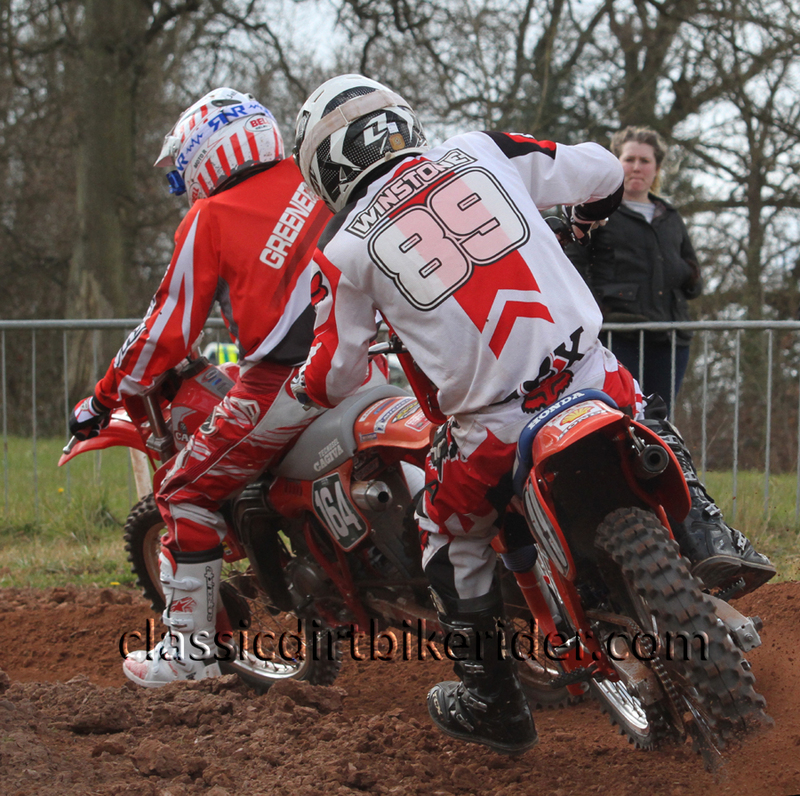 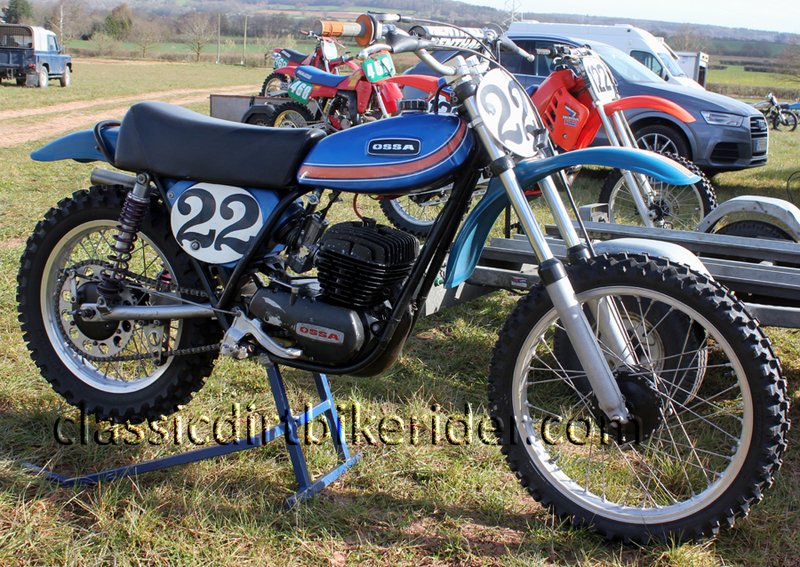 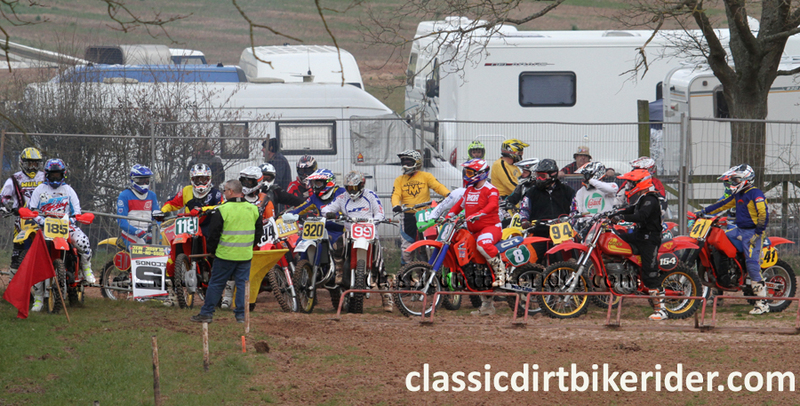 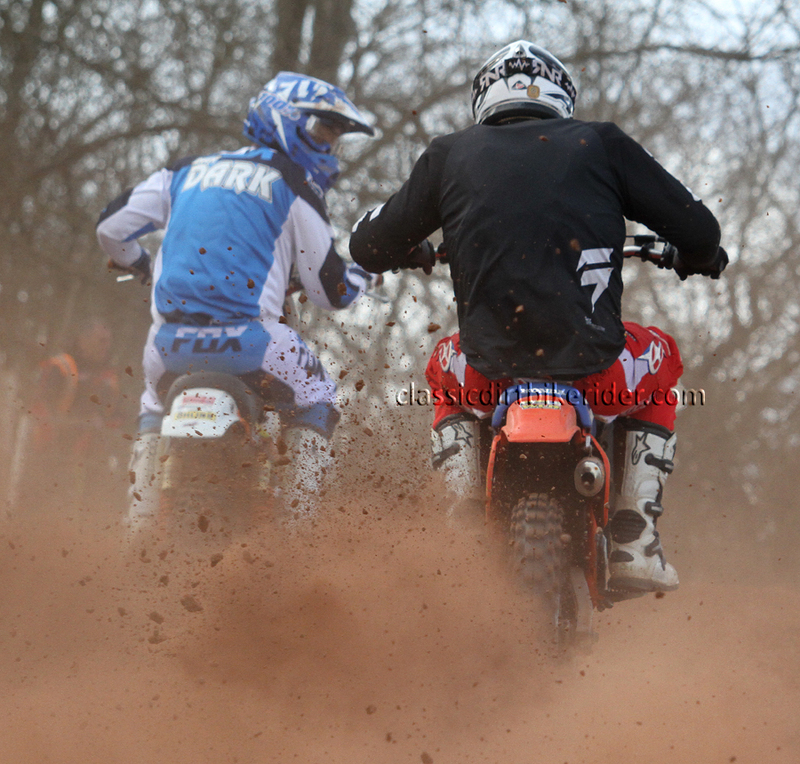 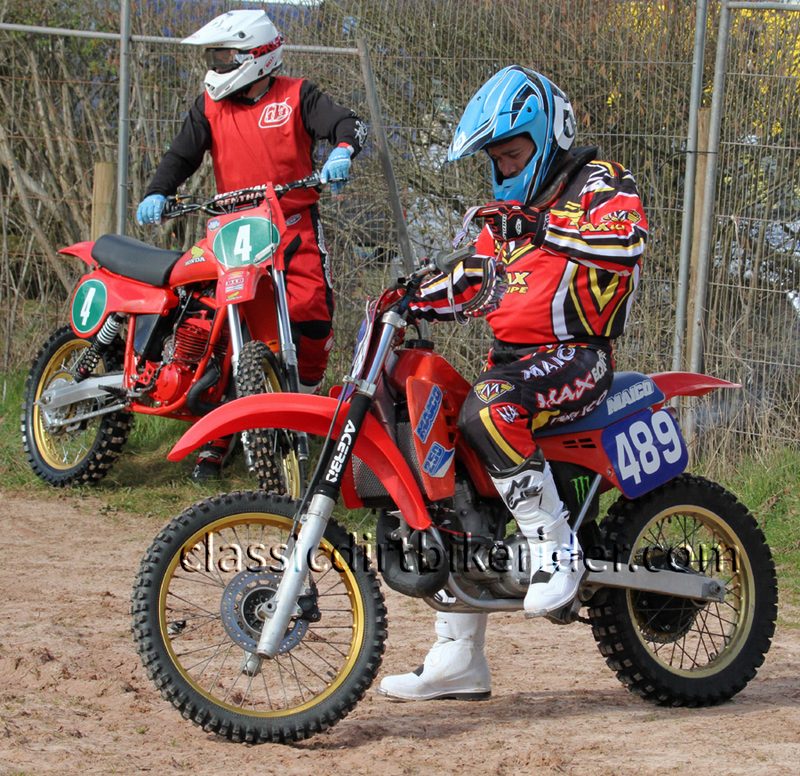 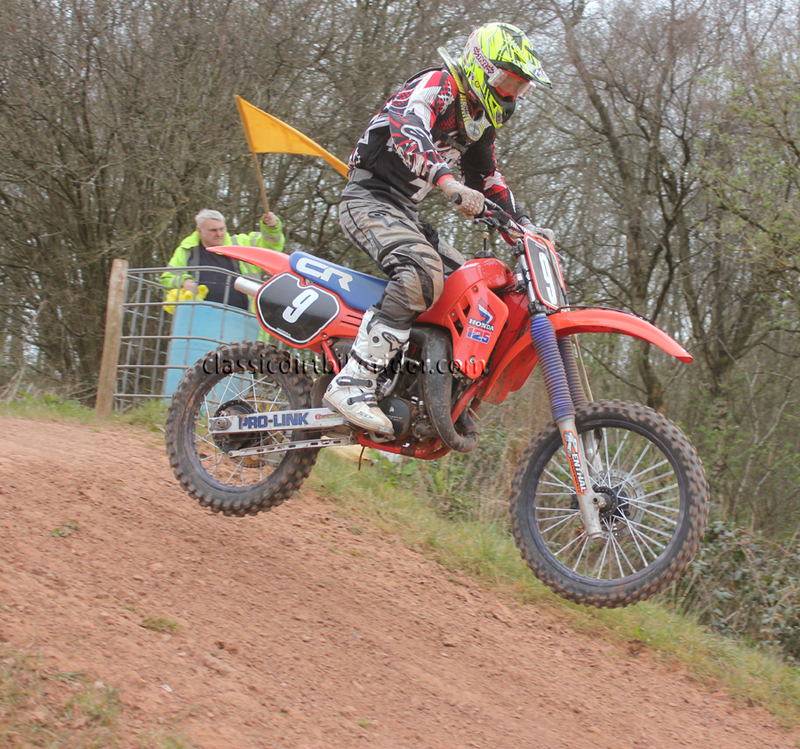 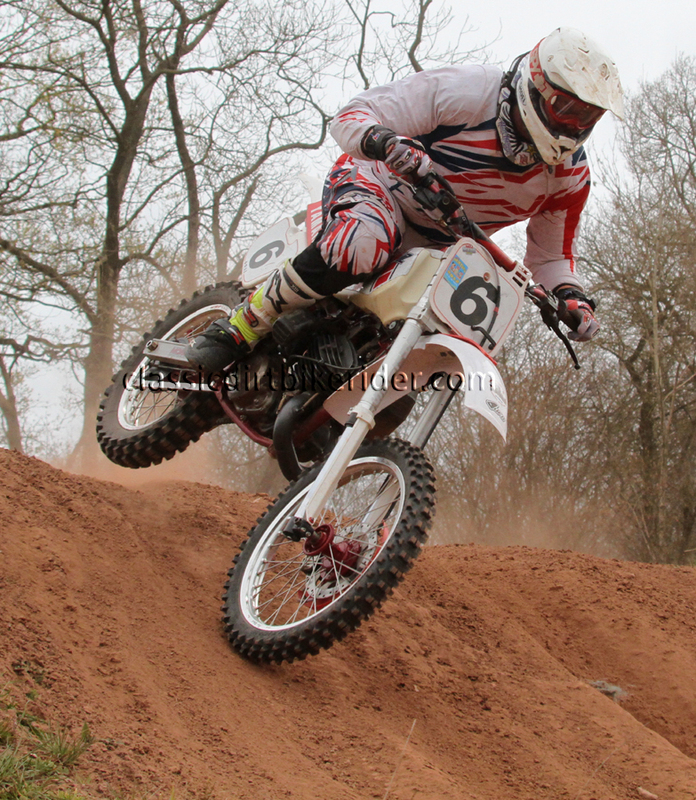 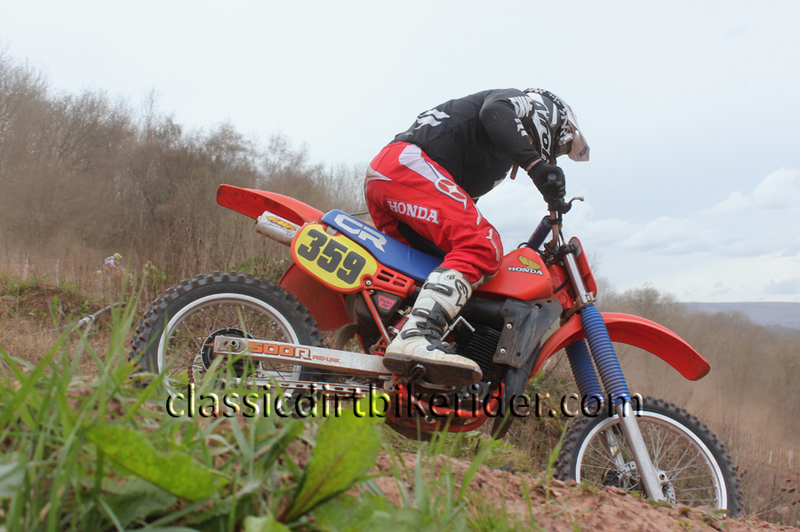 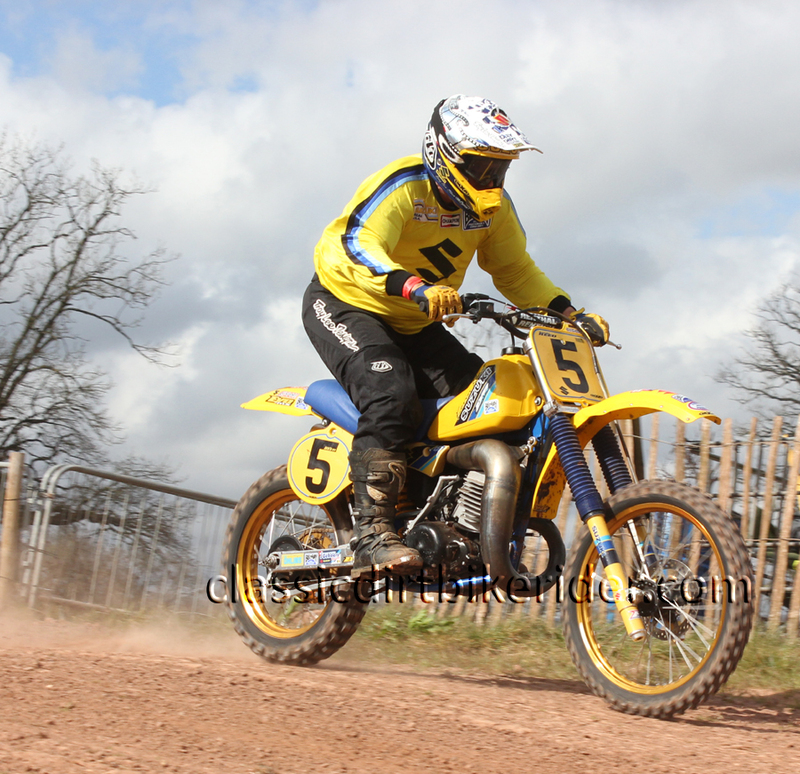 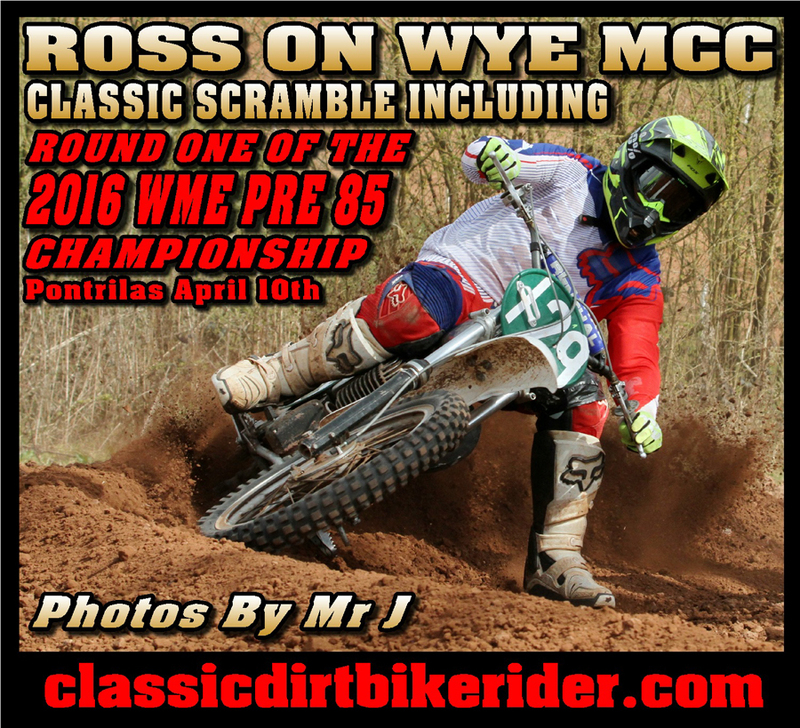 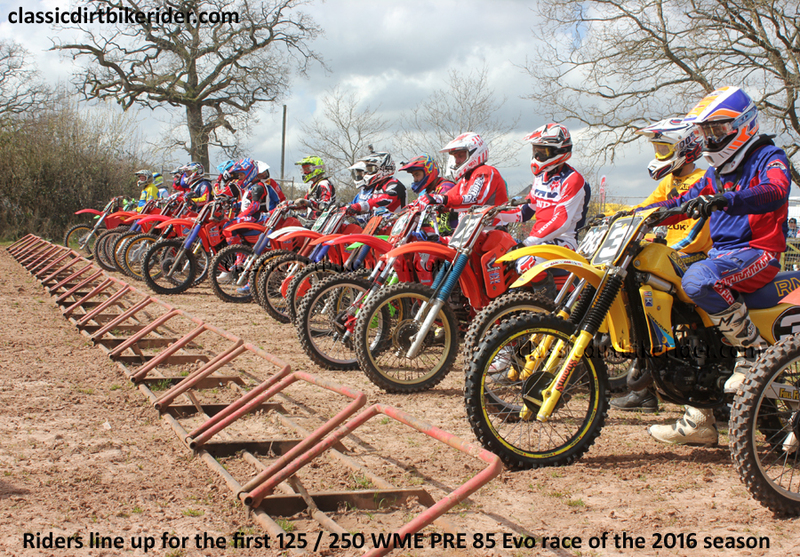 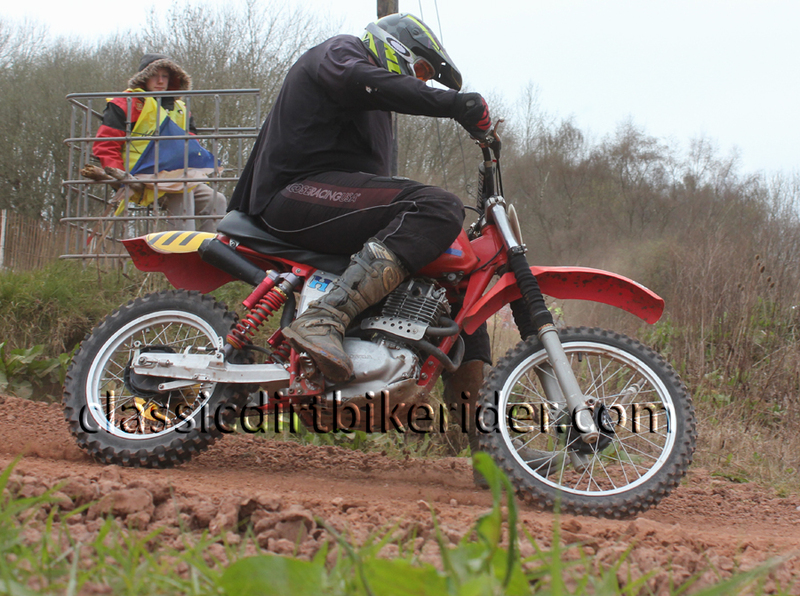 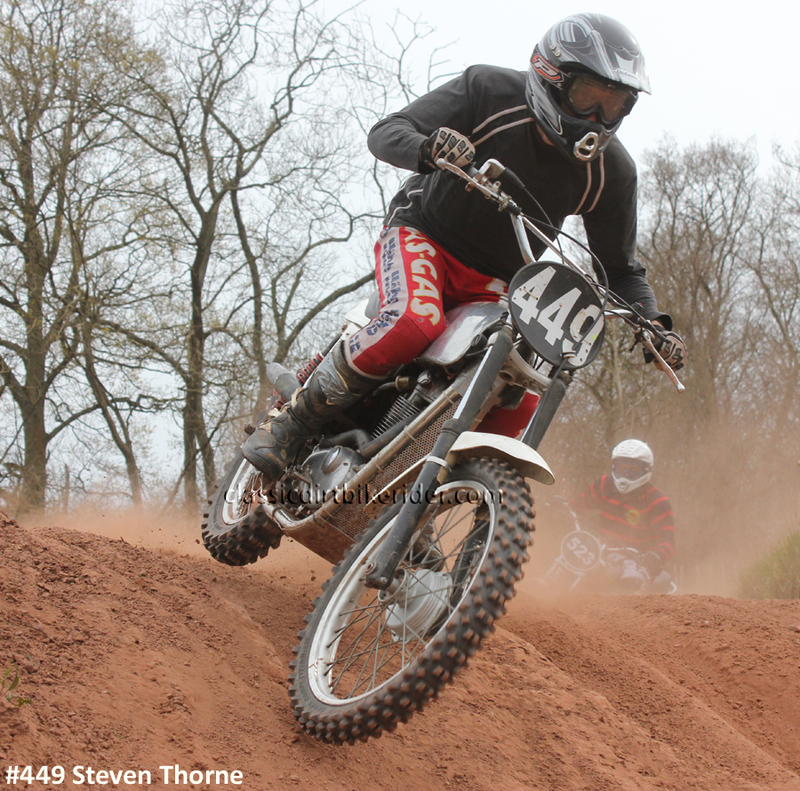 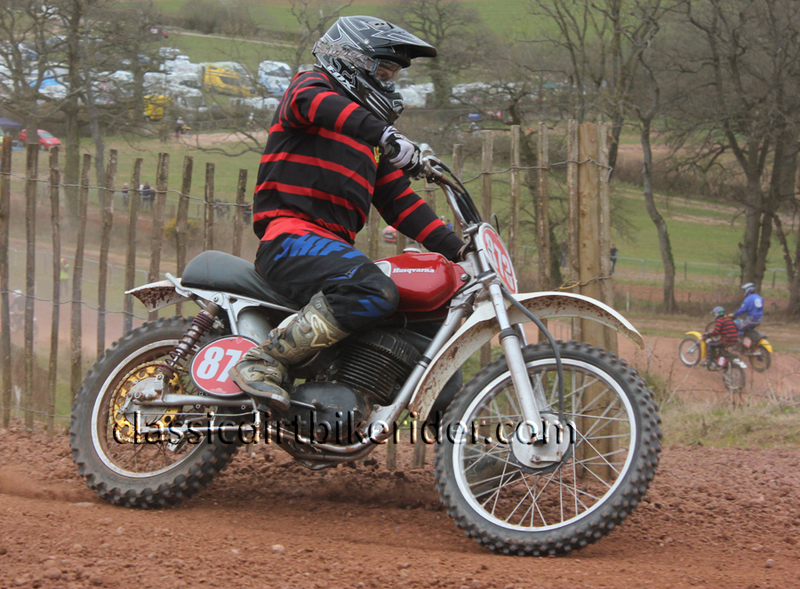 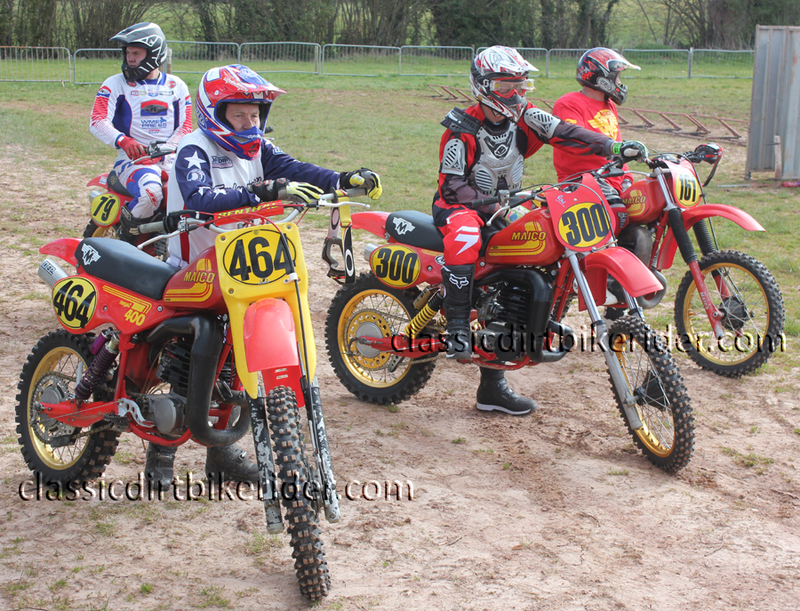 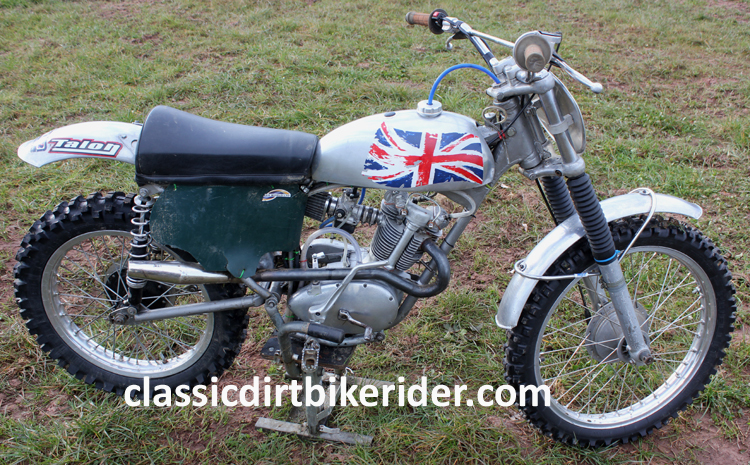 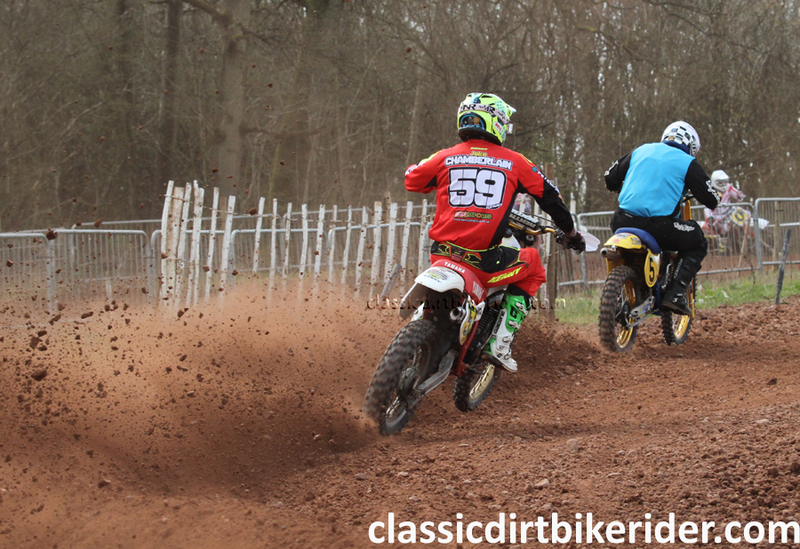 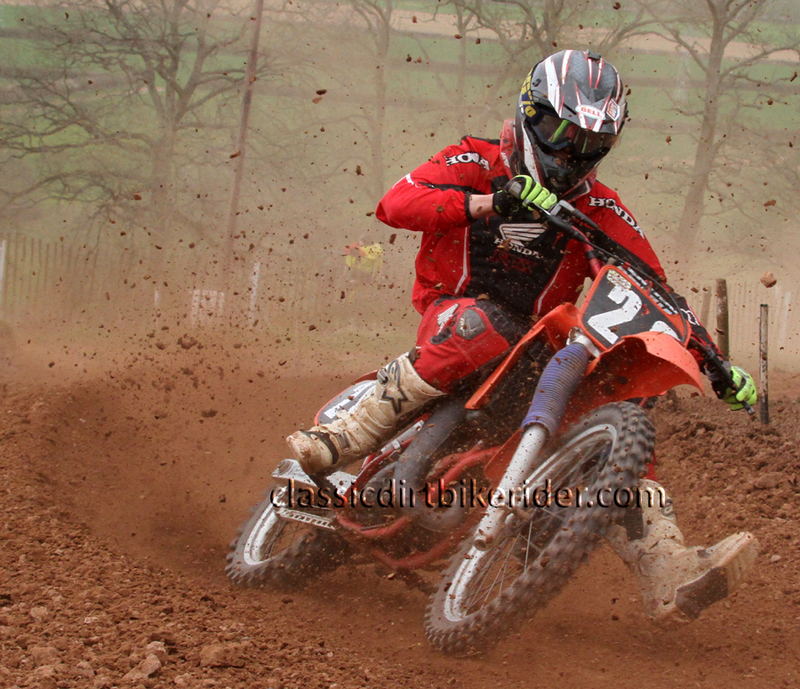 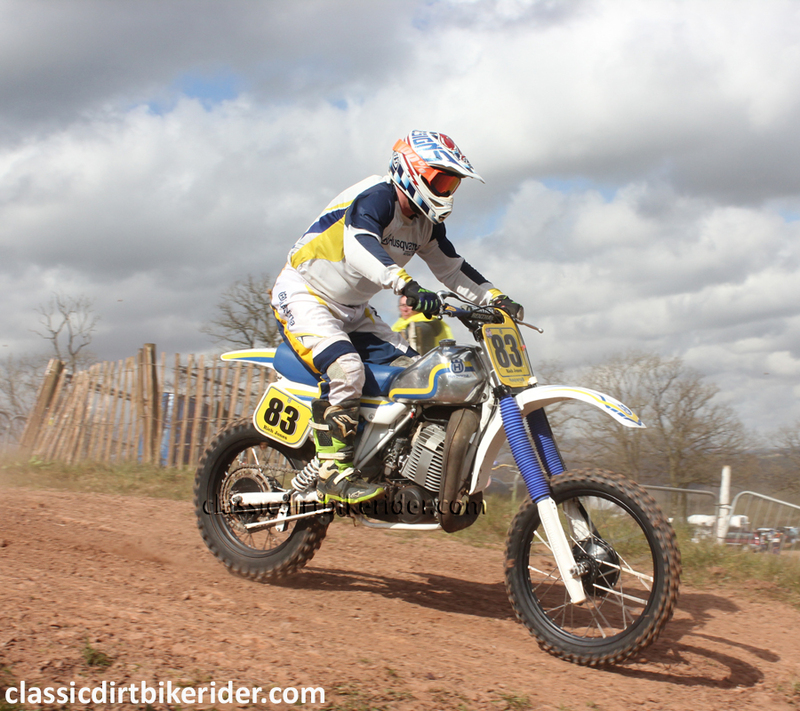 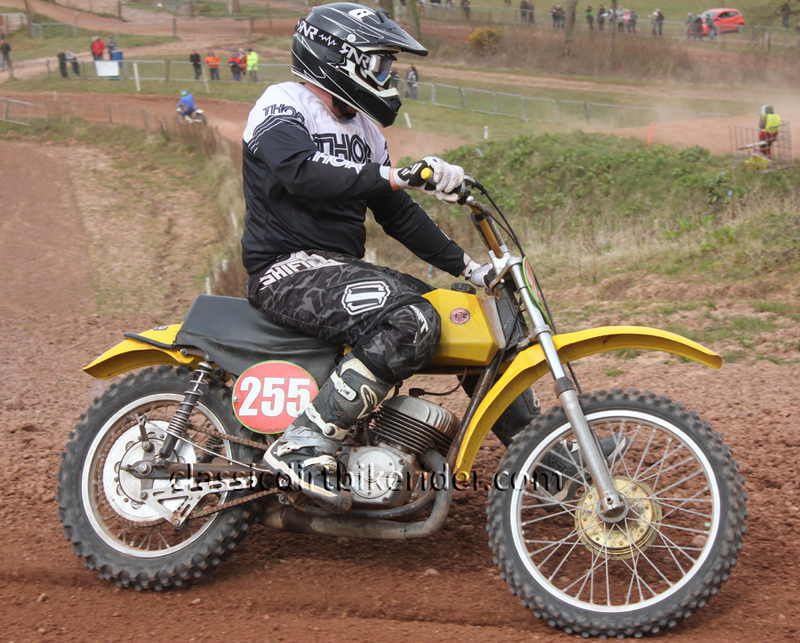 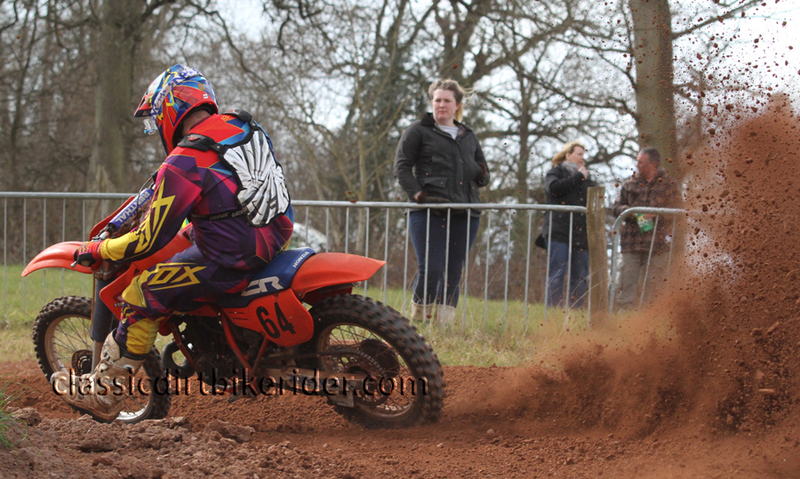 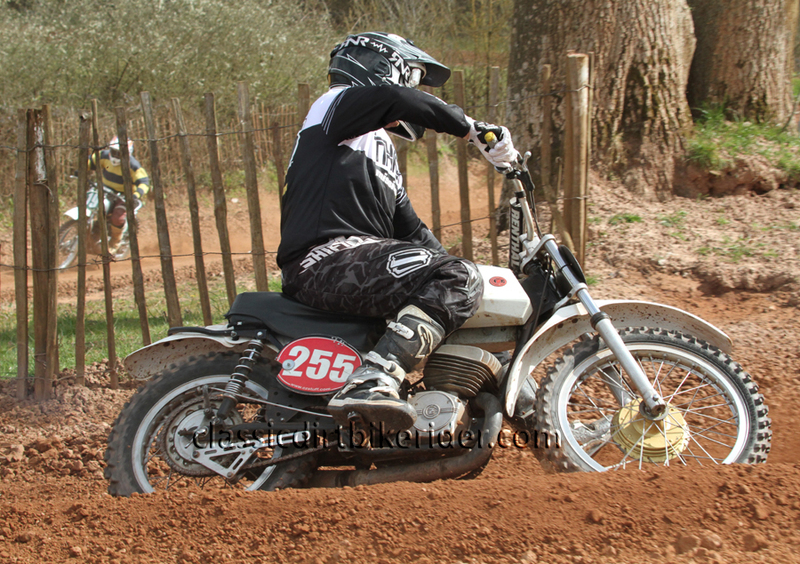 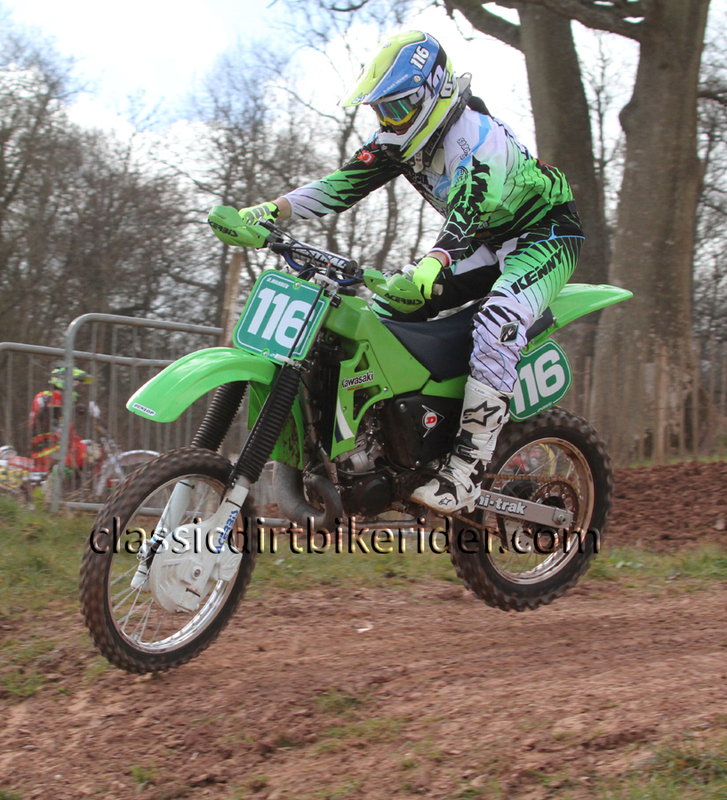 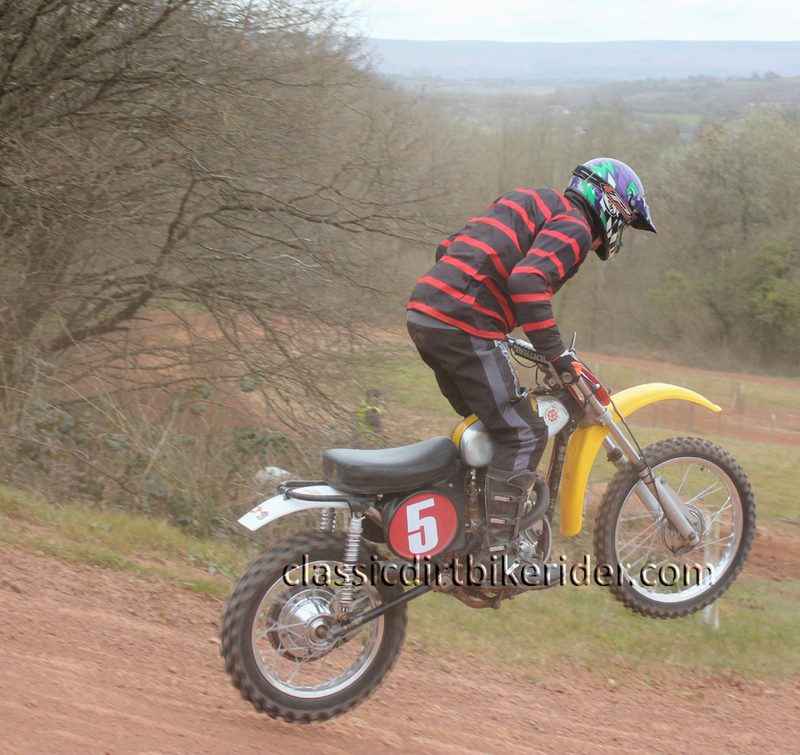 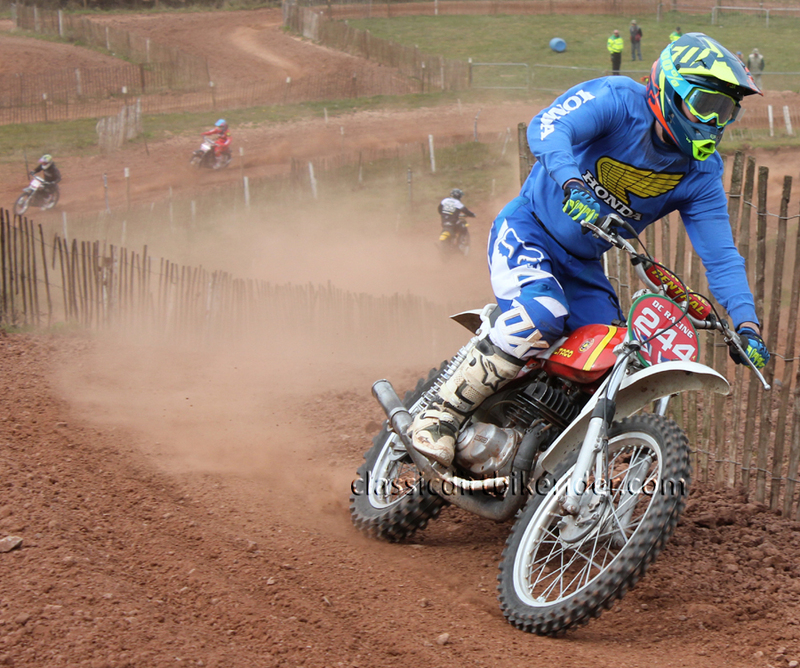 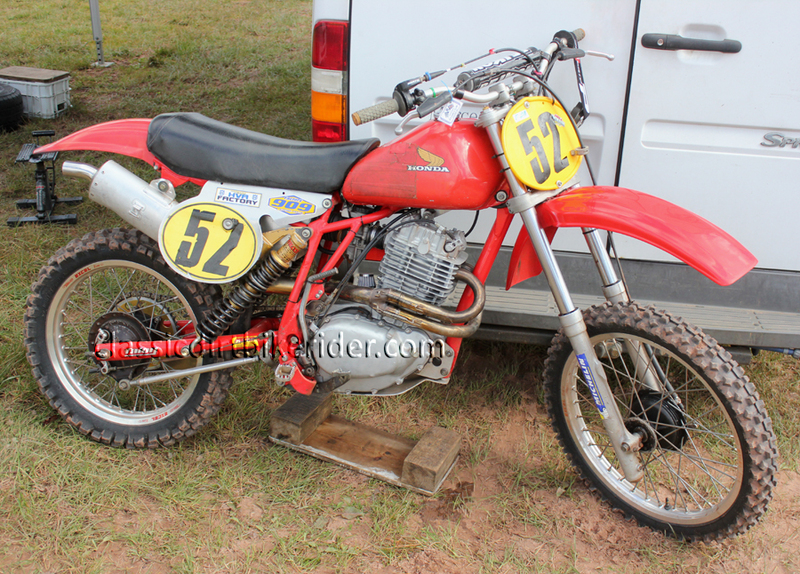 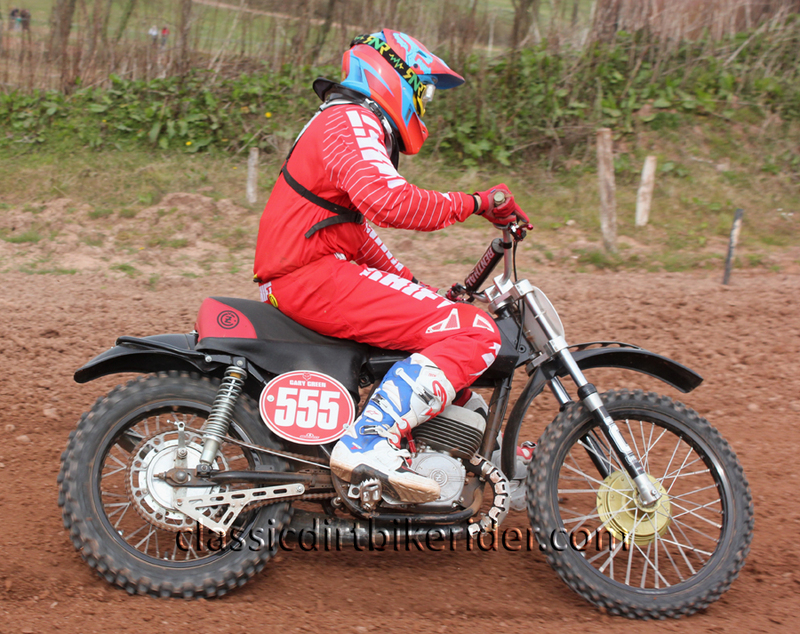 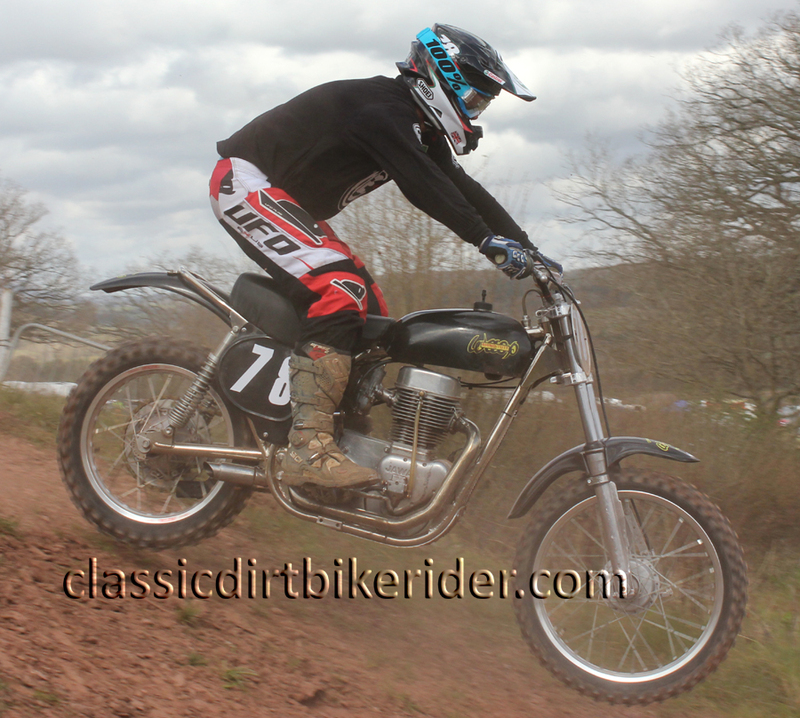 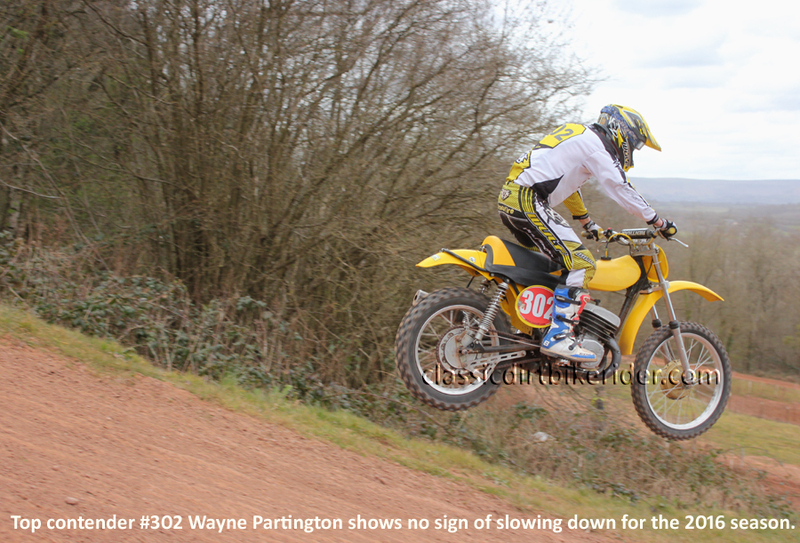 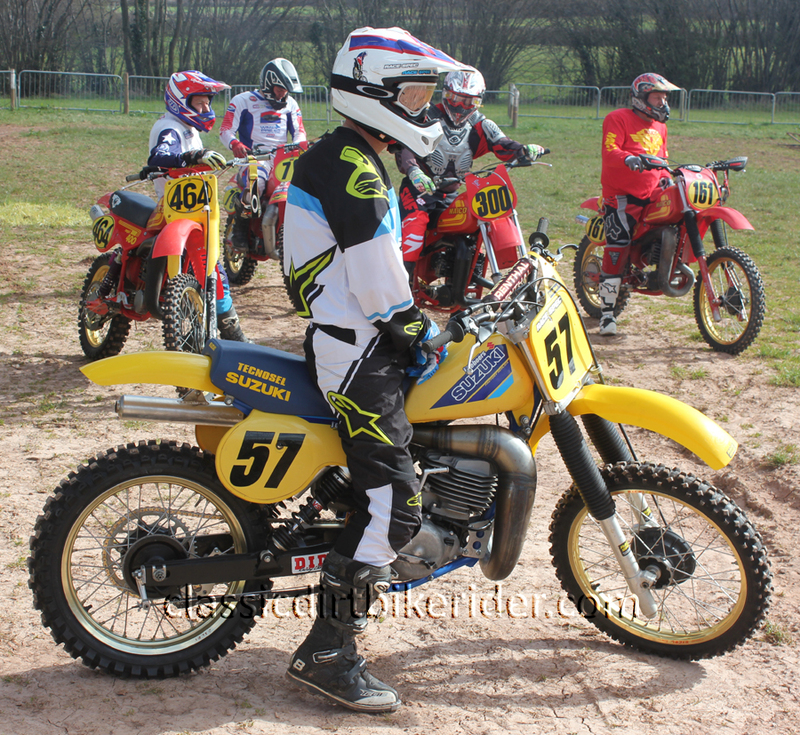 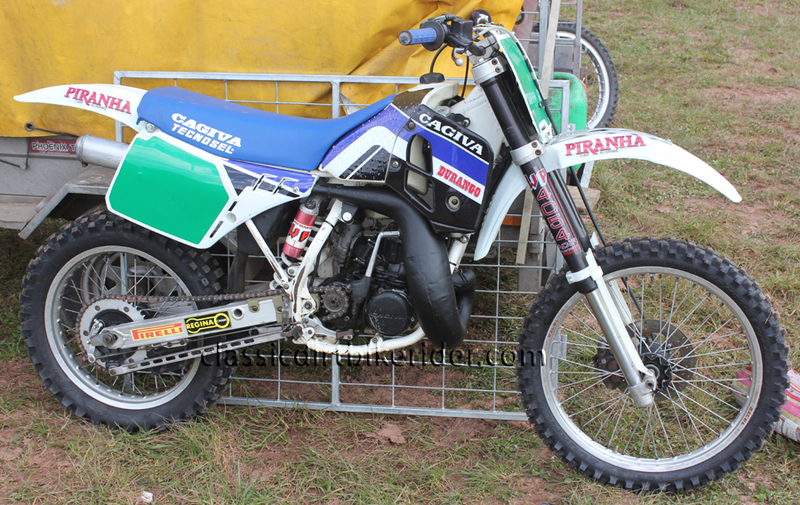 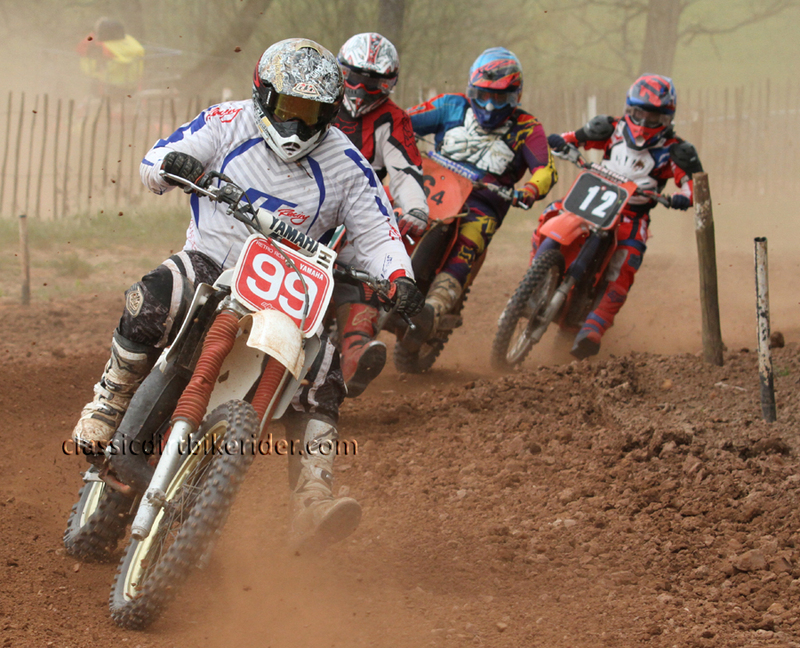 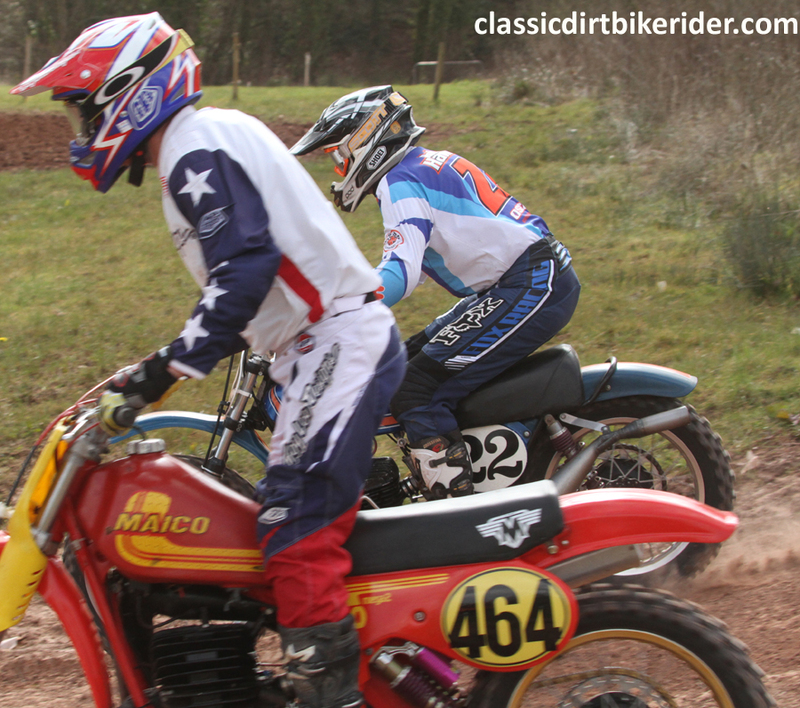 Pontrilas Classic Scramble April 10th, Including Round 1 Of The 2016 WME PRE 85 Motocross Series…..Being up & out early traveling to a motocross race meeting on a Sunday morning is a bit of a double edged sword, on the one hand the roads are usually clear & on the motorways you can cover great distances in quite a short time, in fact this is how those original super highway planners must have thought it would be all the time, sadly as we all know the M6 motorway section that runs through Birmingham might as well be on two different planets when you compare it at 6.00pm on a Friday with 6.00am on a Sunday morning. 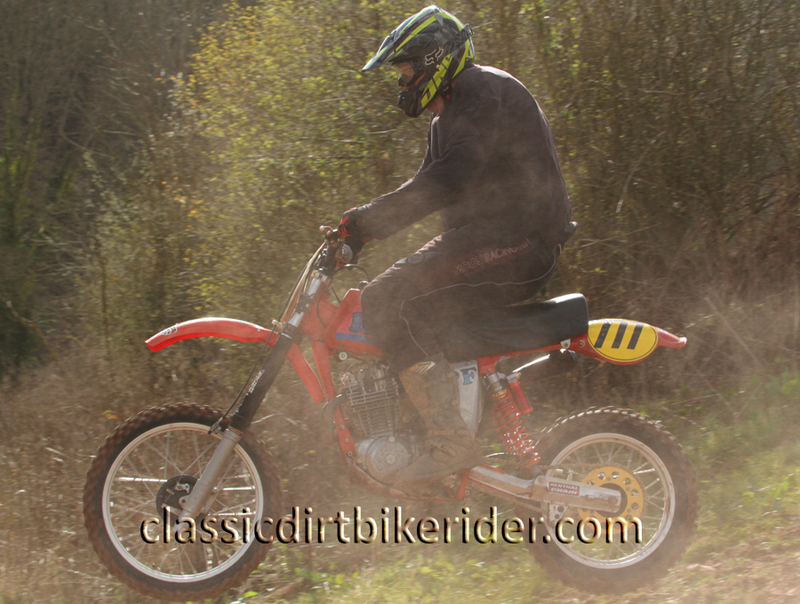 The down side to all this early Sunday morning motorway freedom comes when you try & listen to the radio, if like me you fancy a mixture of pleasant conversation & easy listening music you invariably tune into Radio 2, sorry it`s an age thing, all is well with the world, you have a whole day of motocross action ahead, you have a clear road in front of you & a giant bag of wine gums to keep you company, but what’s this, Radio 2 has suddenly turned into Radio God ! 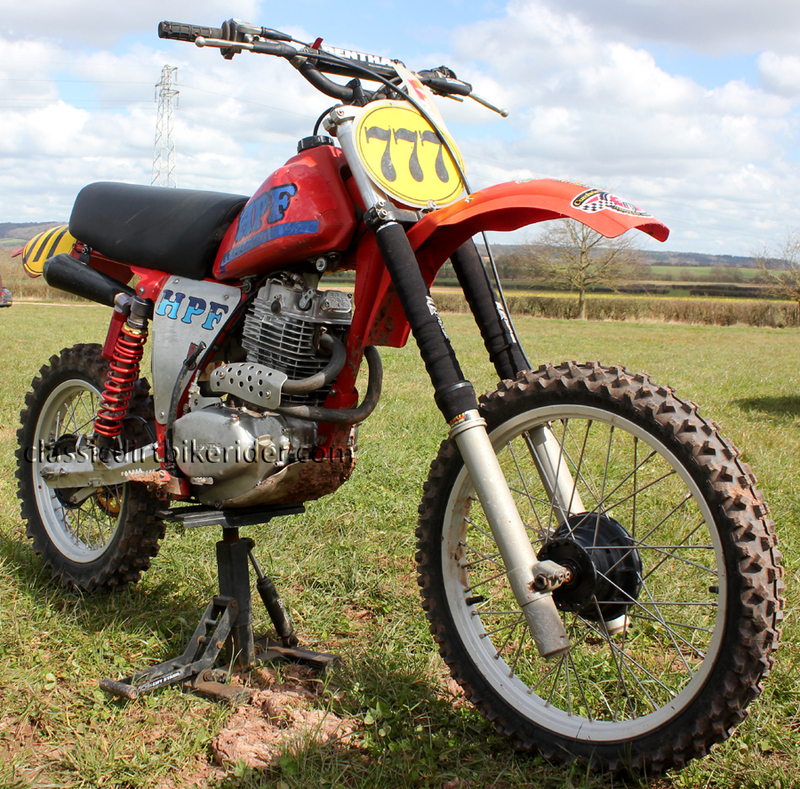 You quickly try evasive action & retune to the local BBC radio station & then the station in the next county but it`s no good, the whole of the BBC Radio network is in “Radio God” mode & no matter how fast you drive you can`t out run it ! 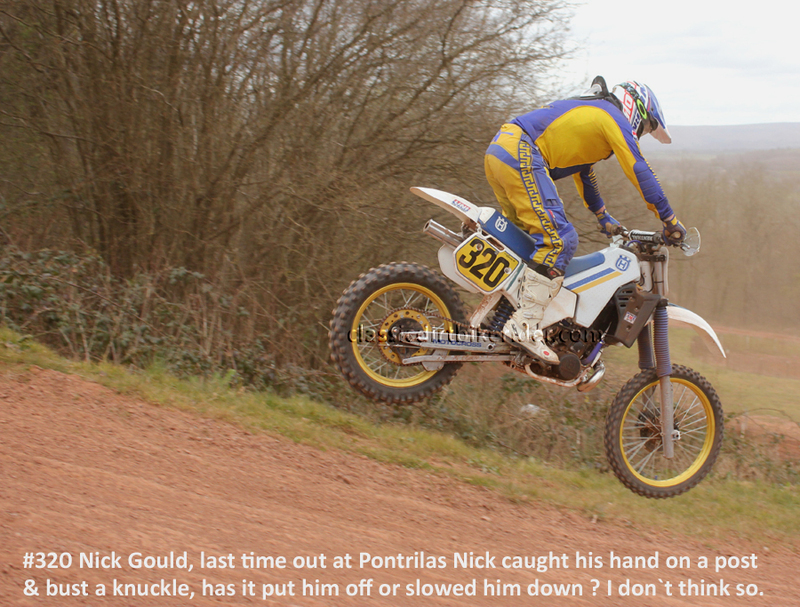 Slowly you begin to realise you have only three choices, 1- listen to BBC Radio God, 2- Listen to local commercial radio, 5 minutes of adverts followed by 4 minutes of drivel from the presenter ( Have you noticed that the track about to be played is always one of the presenters all time top, top favourites, how many have they got ? 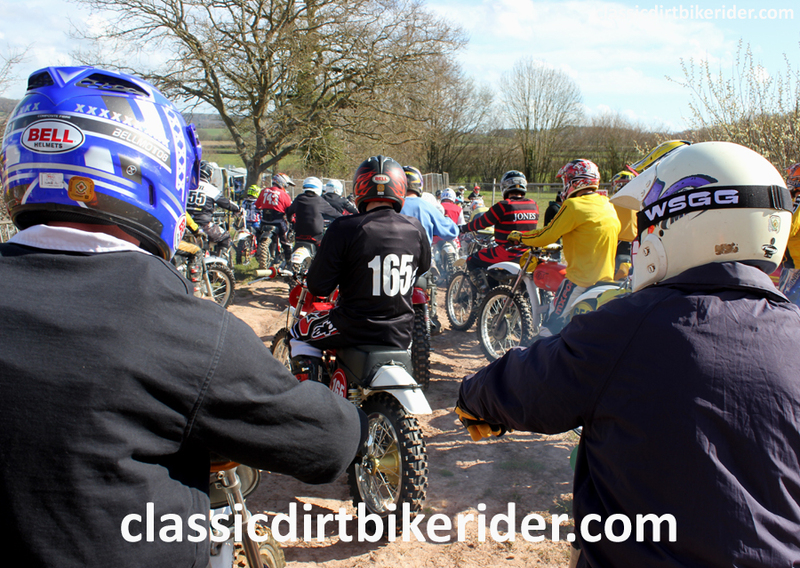 every song ever made seems to be one of their absolute favourites ) followed by 3 1/2 minutes of music & then back to the adverts again, 3- Switch radio off & listen to the rumble of your tyres on the tarmac. 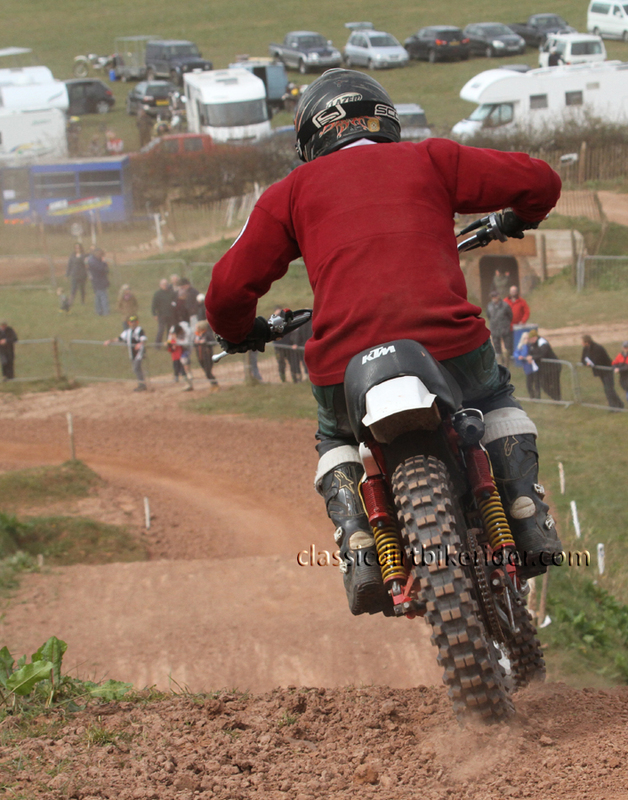 Tough choice I know but for me my tyres win every time ! 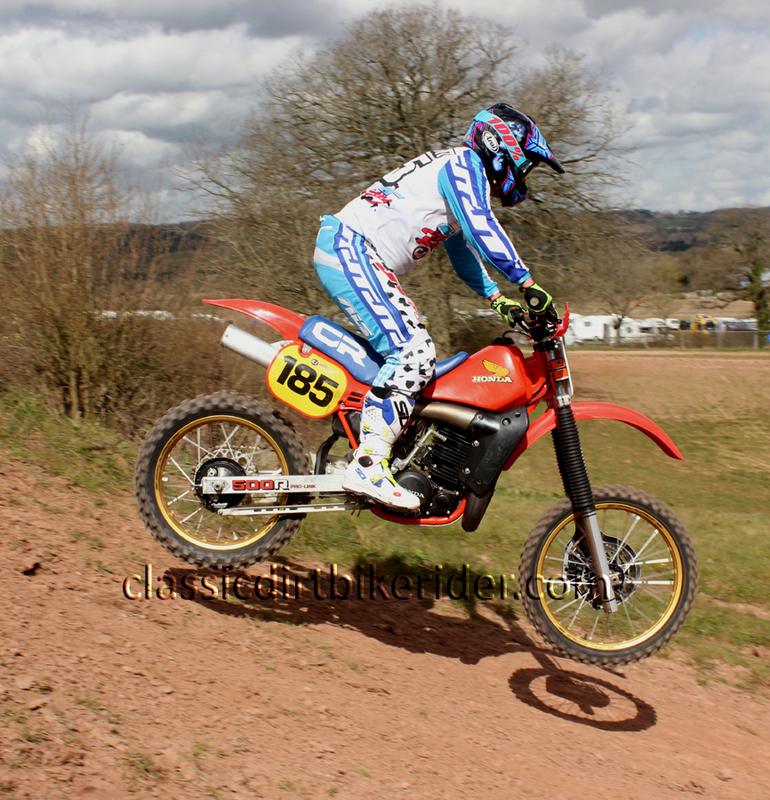 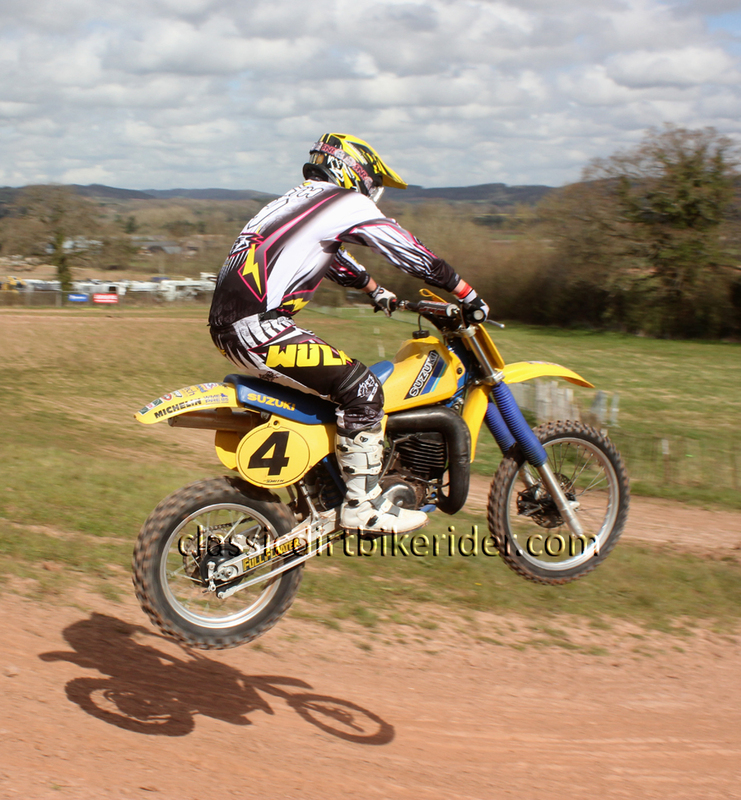 Fortunately for me the big man upstairs didn’t take offence to the fact that I had chosen not to listen to his representatives down here on earth & he delivered me safely to the very well prepared, national championship standard, Pontrilas motocross circuit that’s situated in lovely countryside about 10 miles outside of Hereford & “Mr G” even threw in some sunshine & blue skies to make the whole day go with a swing. 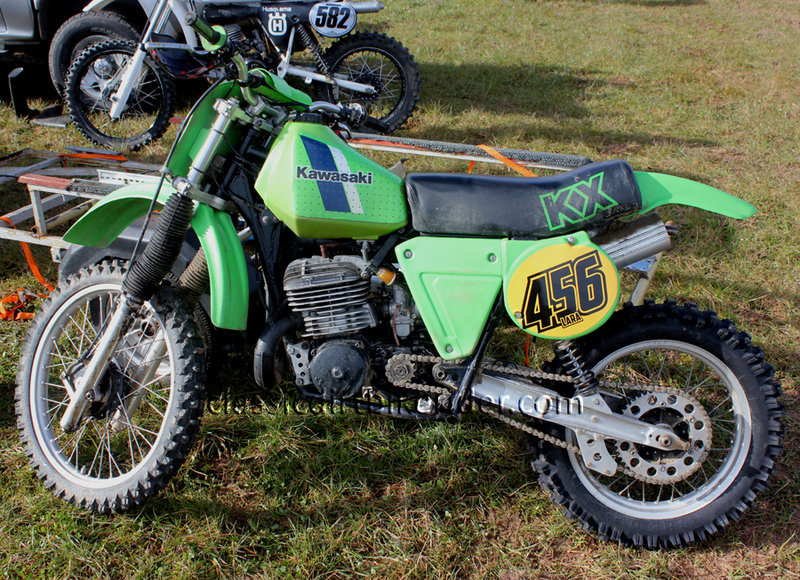 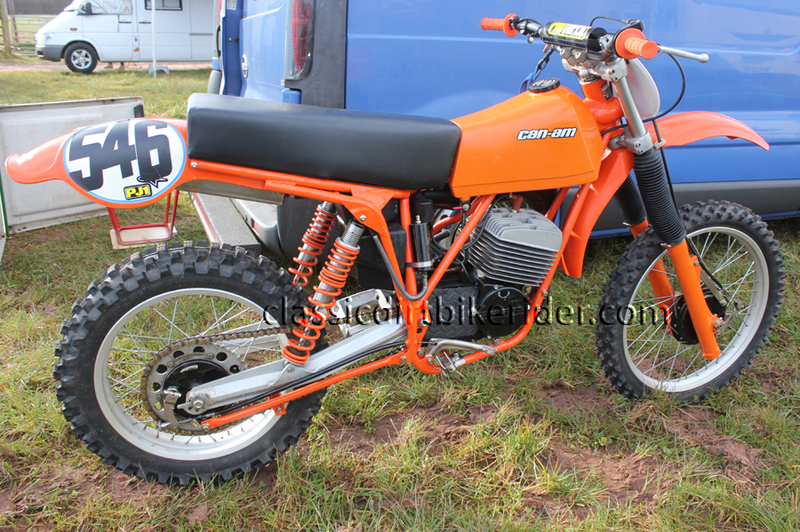 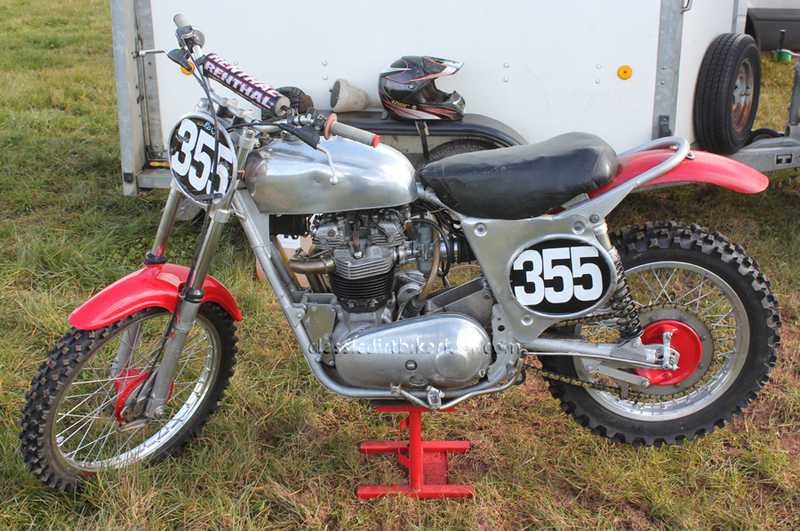 Wandering around the paddock one of the first machines I spotted was this, it belongs to born-again racer #66 John Gerrish who is now into his second season of competition, these early 80s air-cooled KX500 machines are quite rare. 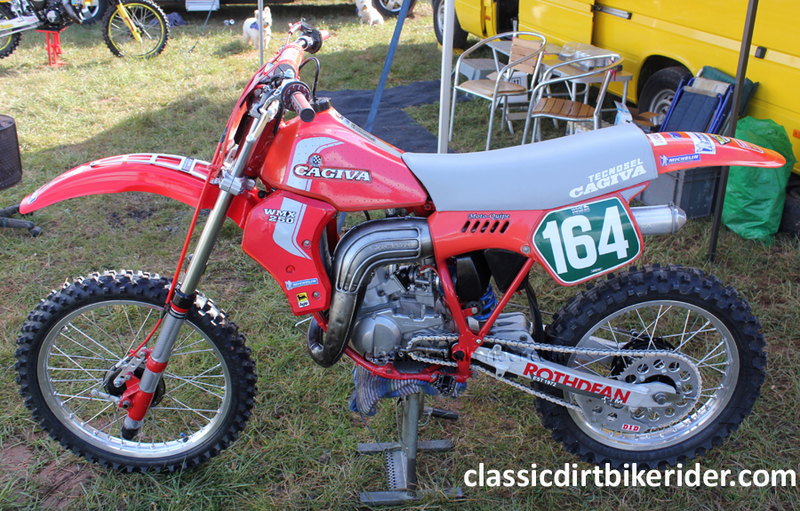 According to John the big 500 was never that popular until Kawasaki introduced the water-cooled KX500, this particular model was renowned for being difficult to start so the next version saw Kawasaki introduce a twin spark plug head presumably to try & solve the problem. 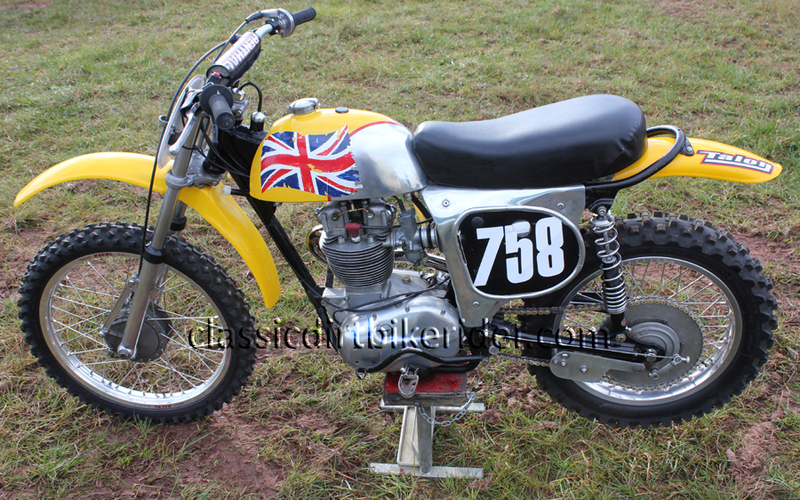 As ever it`s a familiar story when you start to quiz a rider about their bike, lots of time & money has gone into this machine & the job is still not quite finished, John managed to rejuvenate the gold coloured components with an enamel paint from his local DIY store, it`s fairly close to the original colour & still looks good after two years but he’s now after some original wheel rims that were finished in a muted gold type of colour so if you have a good one or better still a pair let him know. 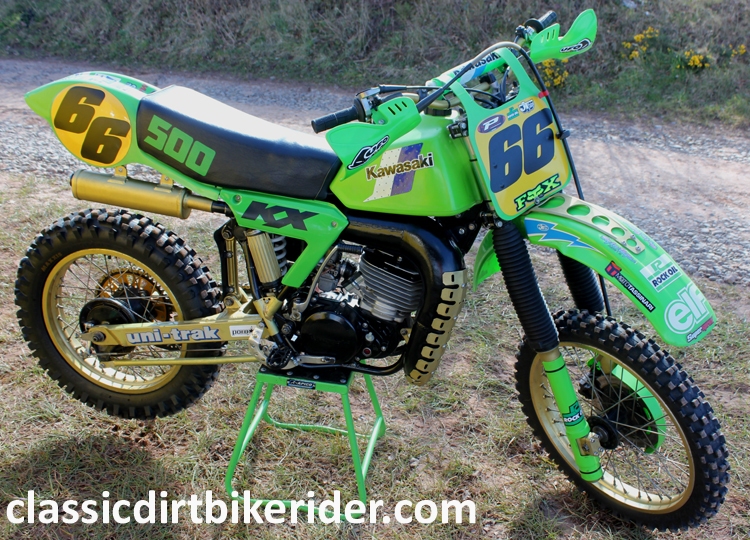 Interesting Fact if you need a kickstart for a KX500 like this get one off a 1975 GS750 Suzuki road bike, that’s what John was told to do & it fitted a treat. 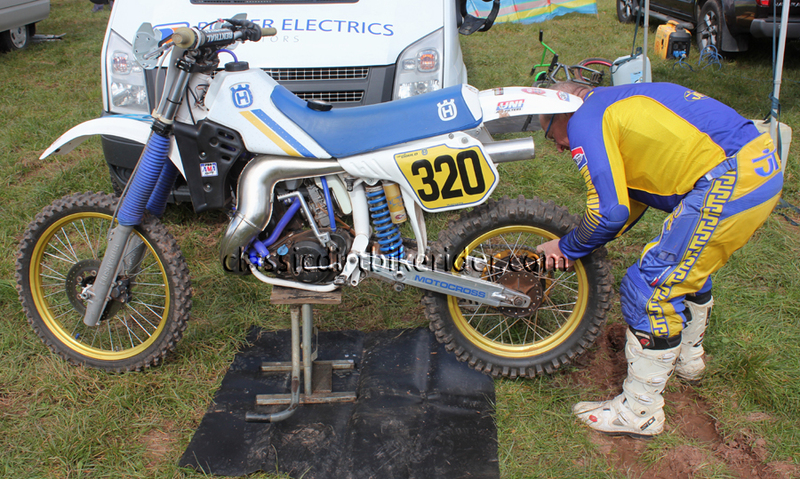 I think this bike is going to be a familiar sight at the front of the Pre 85 Evo pack this season, it belongs to rider #230 Jason Aylett a familiar name in the world of Evo racing. 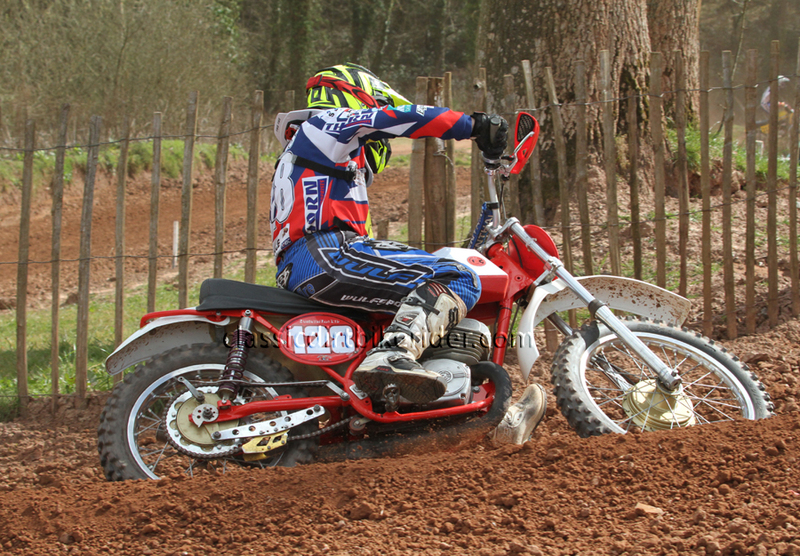 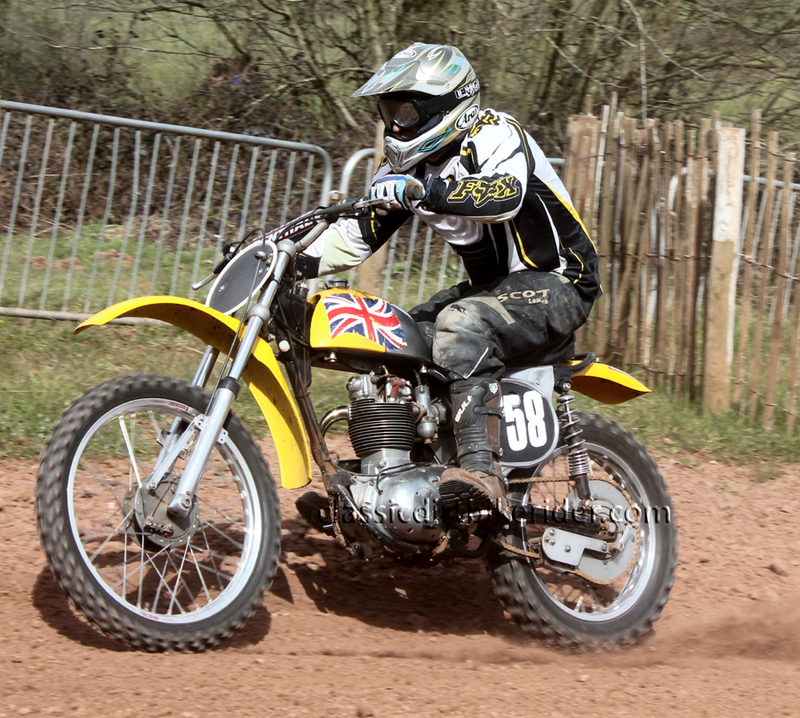 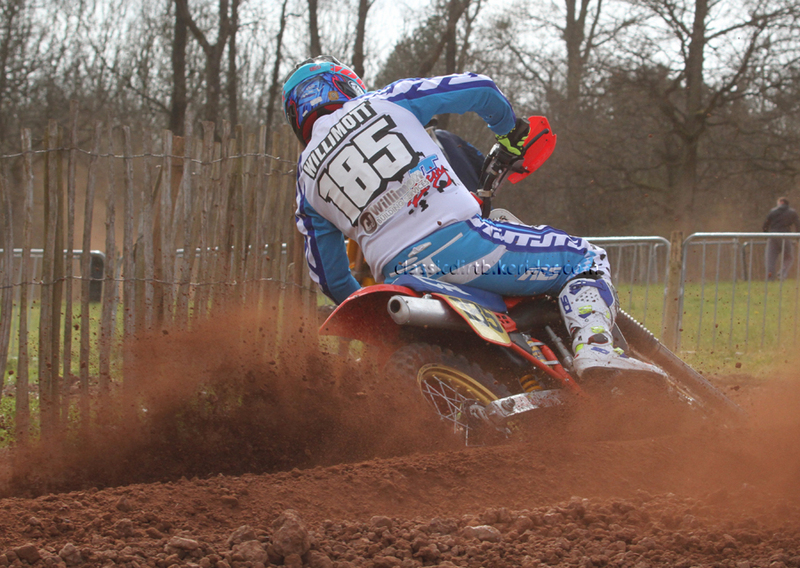 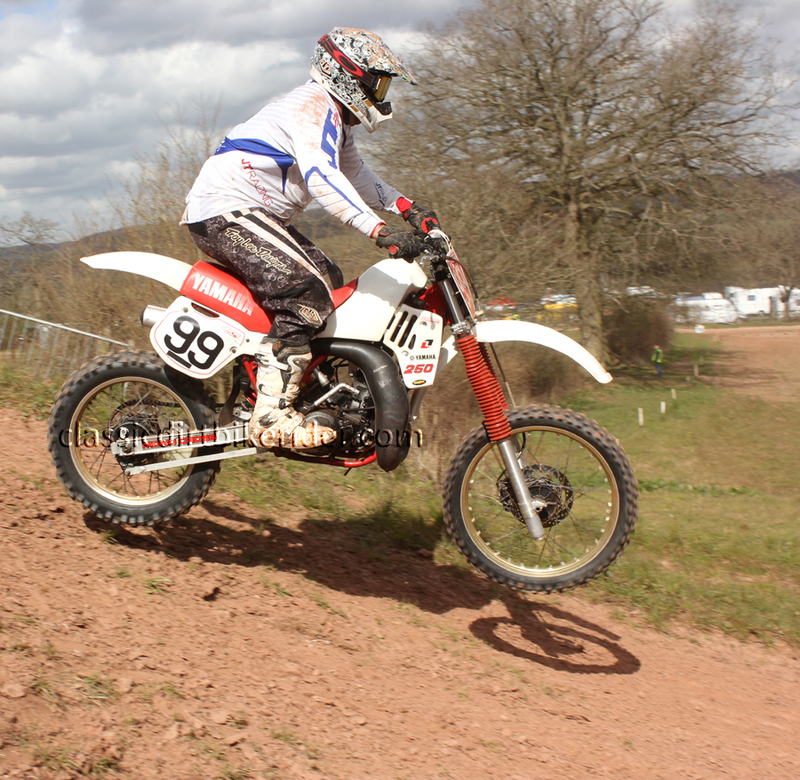 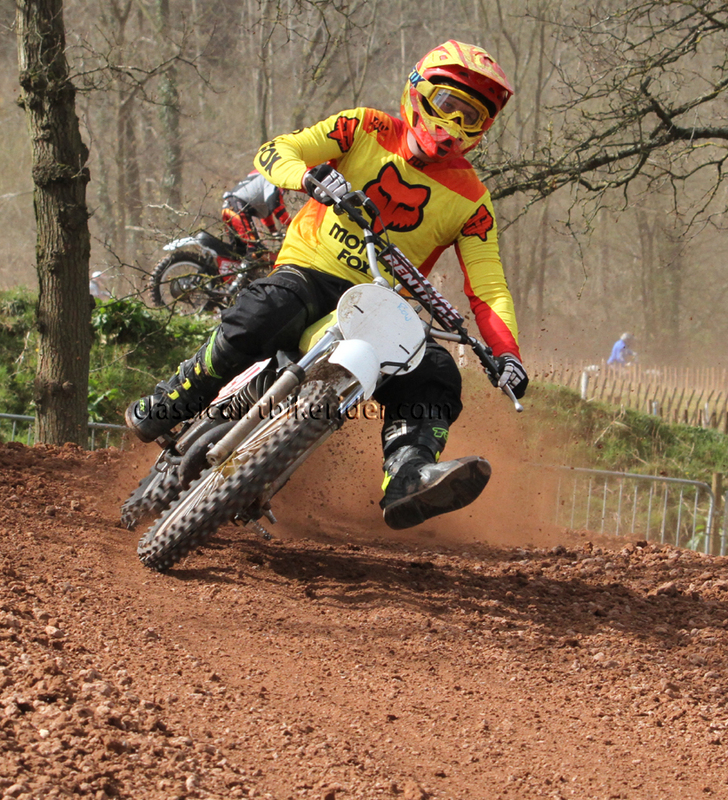 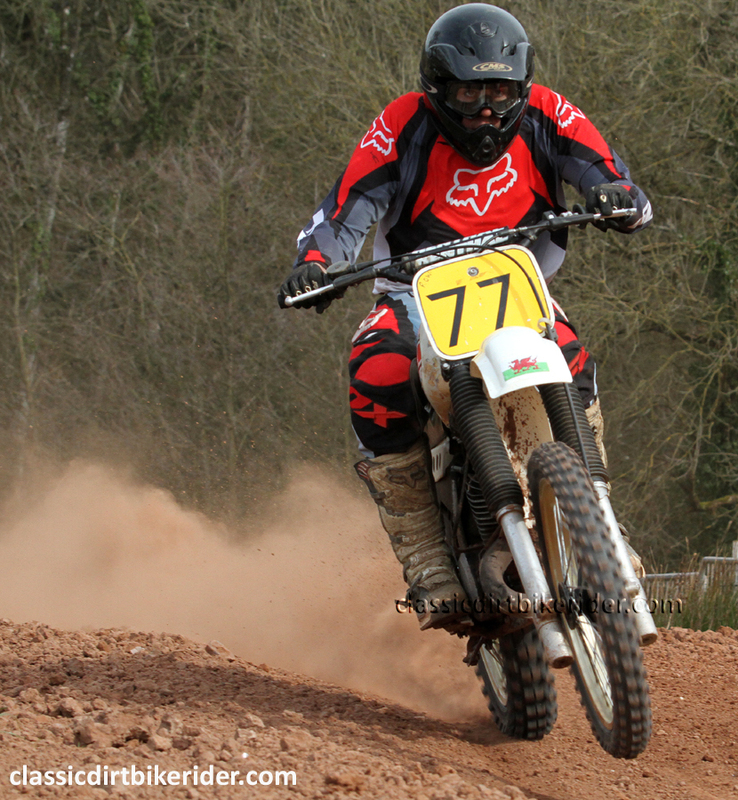 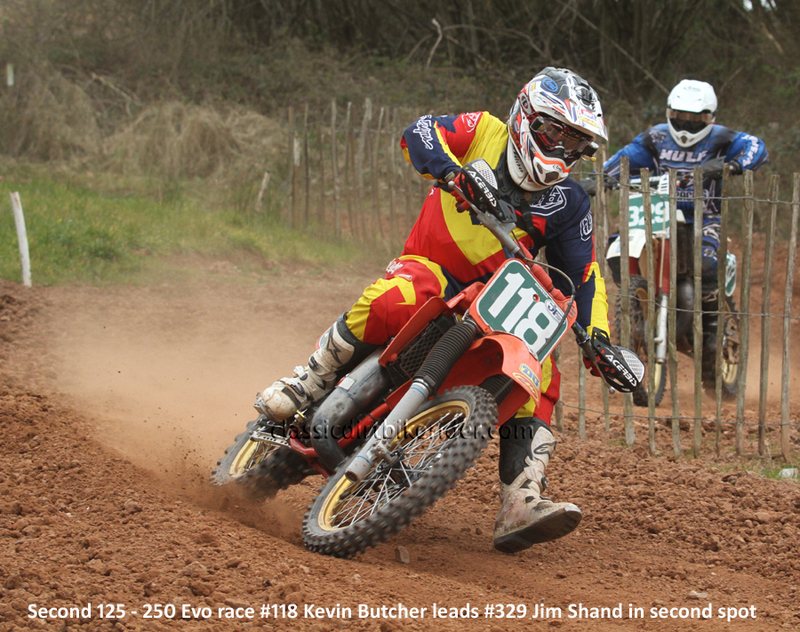 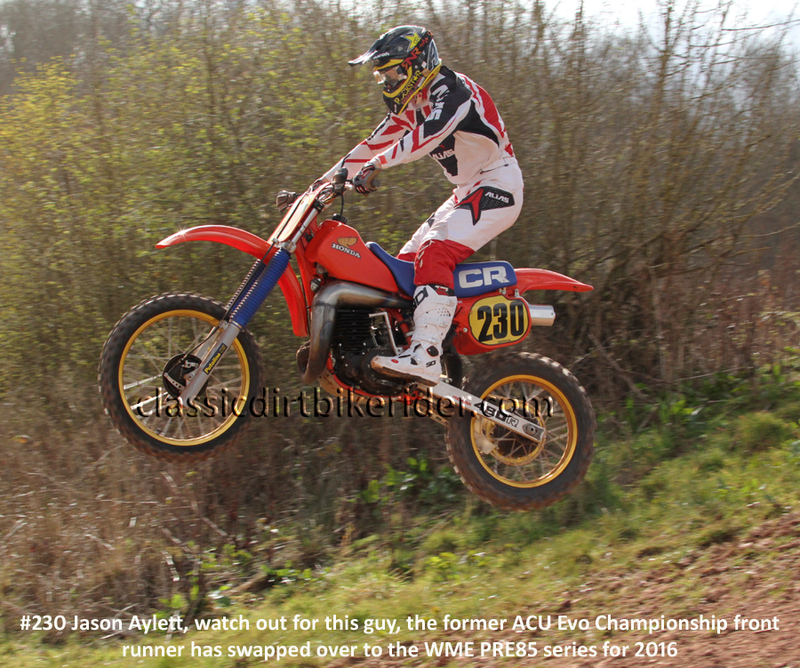 Jason won the Vintage MX Bonanza series last year & narrowly missed out by just 1 point on taking the 2015 ACU British 500cc Championship. 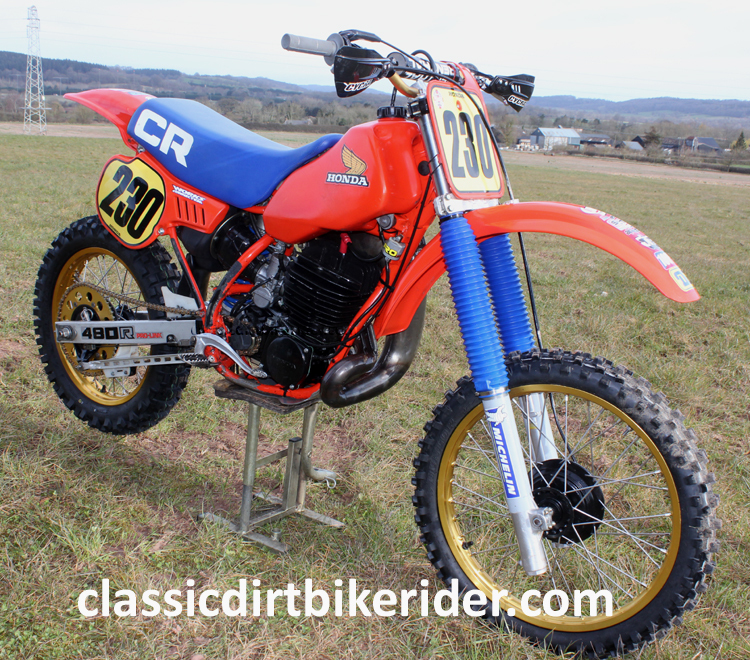 This year sees Jason on a new machine an imported 1983 5-speed Honda CR480, according to Mr Aylett the rebuild & tidy up has been pretty straight forward with only a problem regarding 3rd gear to sort out. 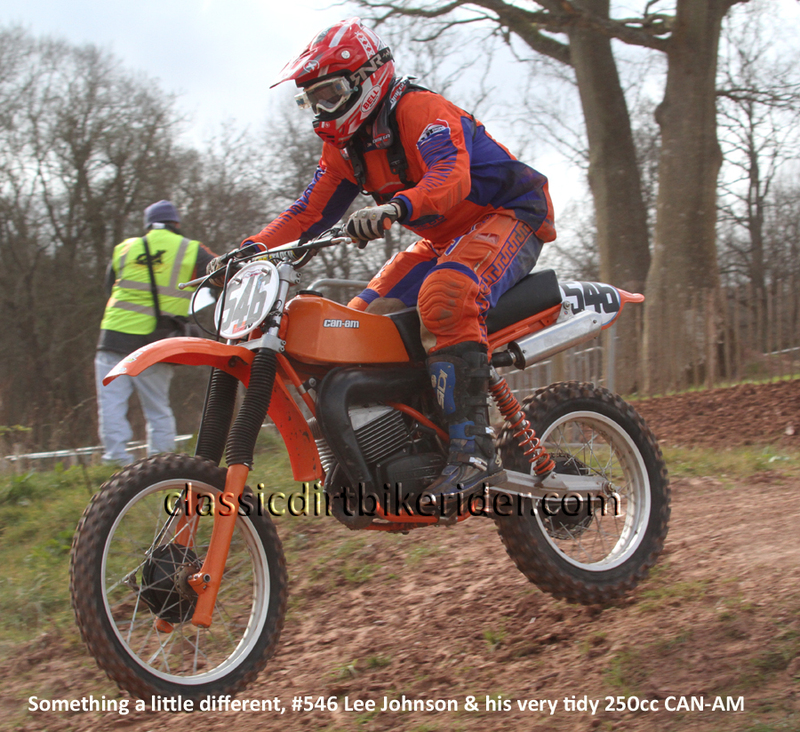 So why the change of scene for 2016 ? 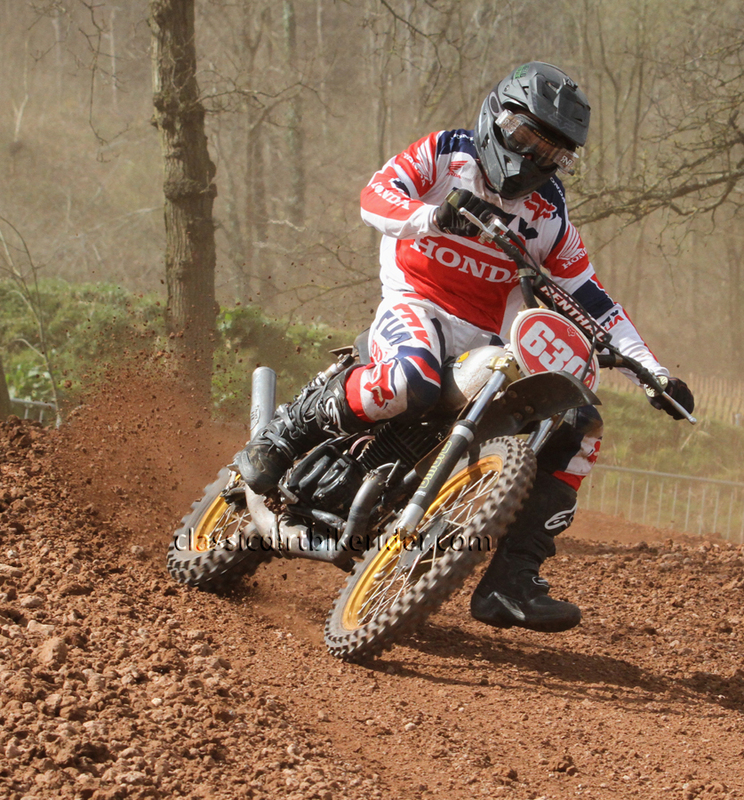 No mystery, it`s just a case of wanting to ride at new & different tracks, Jason is also planning to race in both France & Holland later this season. 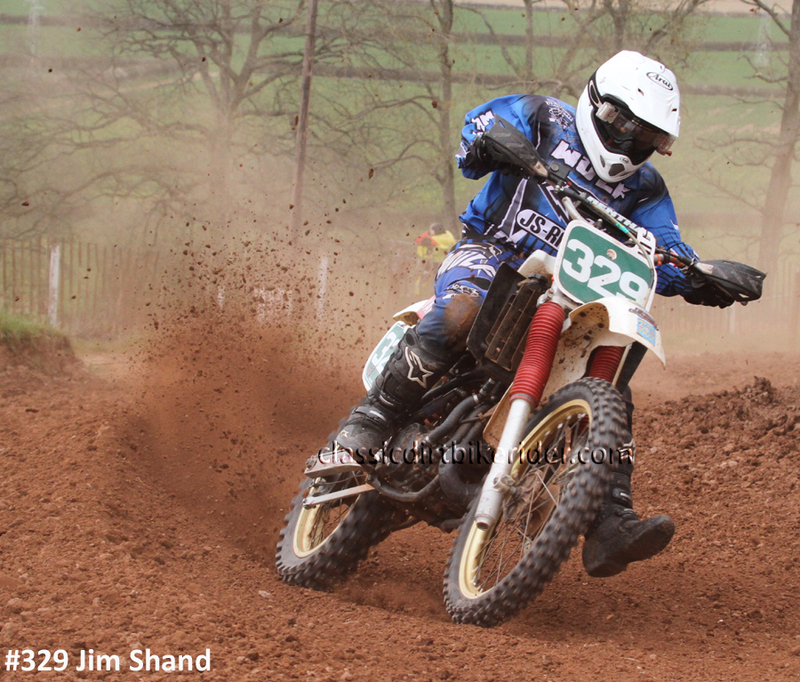 He’s a class act for sure, with a smooth & fast riding style he got his WME Pre 85 campaign off to a flying start by finishing 2nd -2nd -1st at Pontrilas. 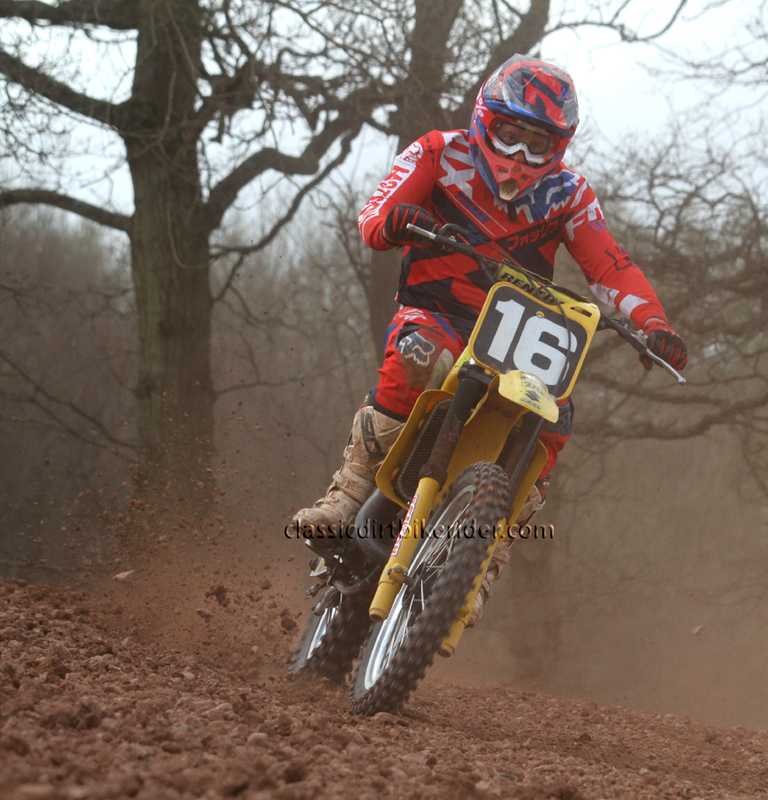 If you want to get your hands on that 1st place overall trophy at the end of the season, then by the looks of it you are going to have to get past this man first, Its Game On. 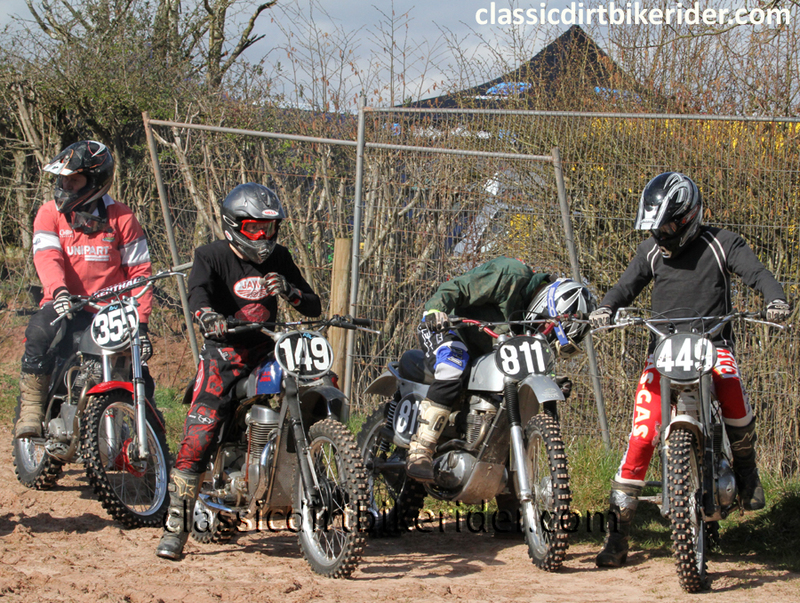 This annual meeting put on by Ross On Wye Mcc is quite interesting as its one of the few meetings where you can go & see classic Scramblers, Twinshock & Evo machines all in action on the same day, usually at classic AMCA events it`s scramblers & Twinshocks only, other organisations run race meetings for Twinshock & Evo bikes only so this event is quite a nice treat. 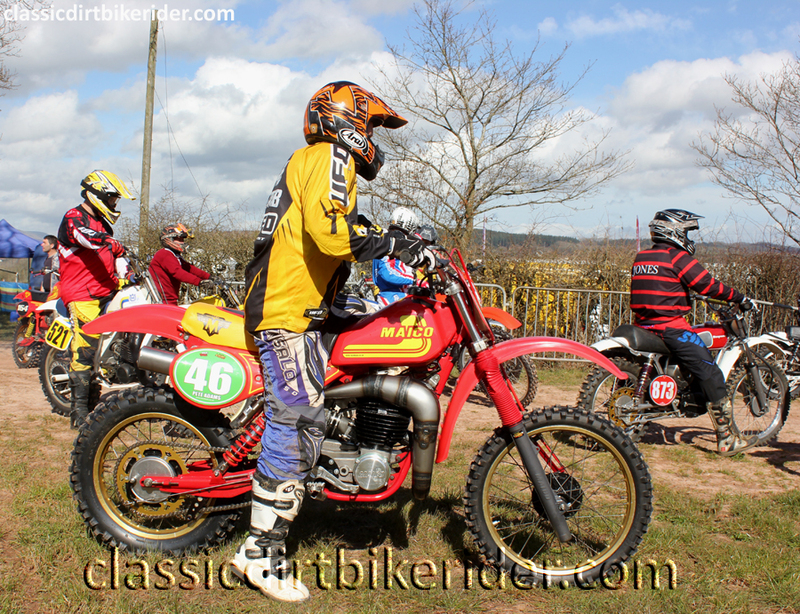 Something that you don`t see very often is a Triumph Tiger Cub Scrambler, with four-stroke riders tending to go for the bigger BSA C15 or B40 it often gets overlooked & forgotten about, unfortunately I don`t seem to be able to find the riders name listed in the program, it had #757 on the front plate. 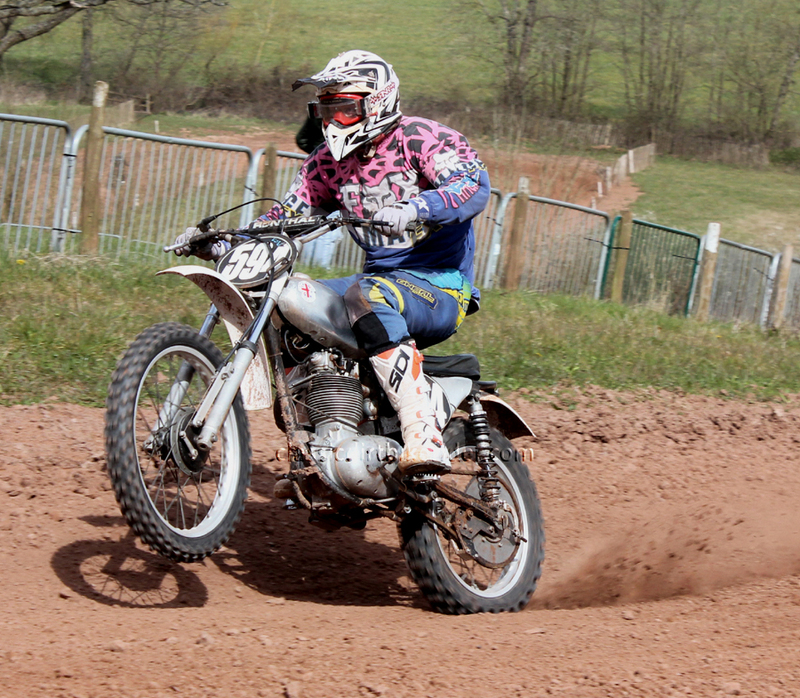 The bike & rider were bombing around the circuit all day without problem & giving the crowd quite a rare sight indeed. 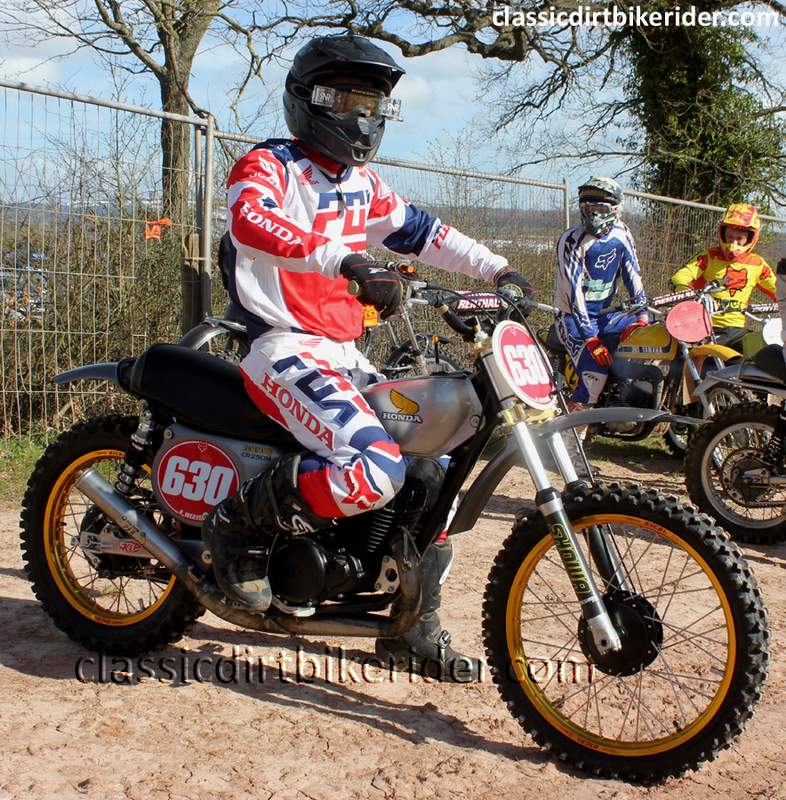 A Tiger Cub Racing Series for 2017, now there’s a thought. 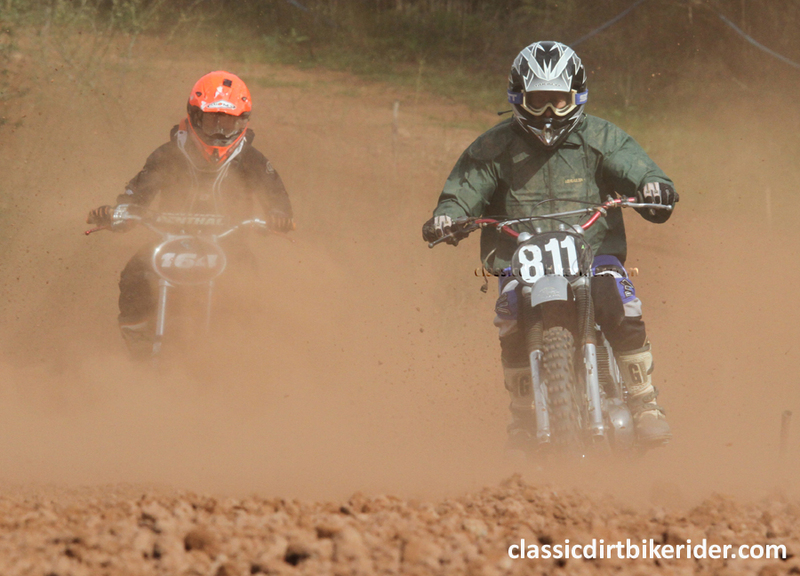 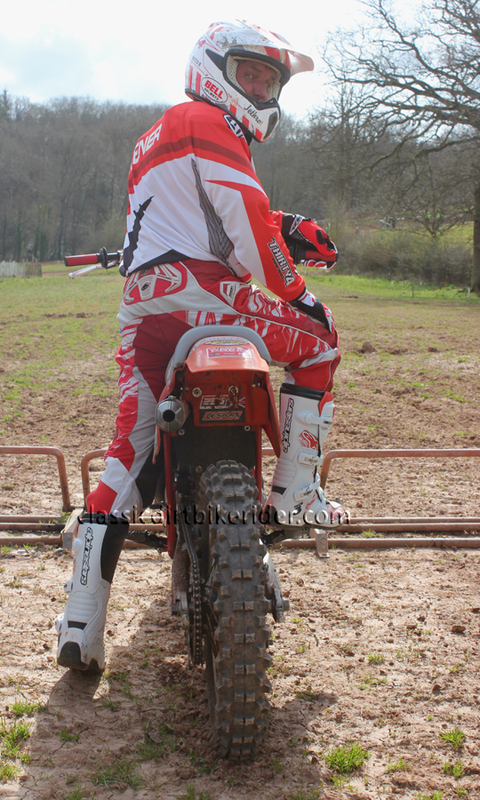 The practice sessions & racing all went well with riders making full use of the excellent track in the dry & sunny conditions, the unusually dry weather did create some seriously dusty conditions on the long & fast up hill straight in the afternoon but that’s motocross is it not. 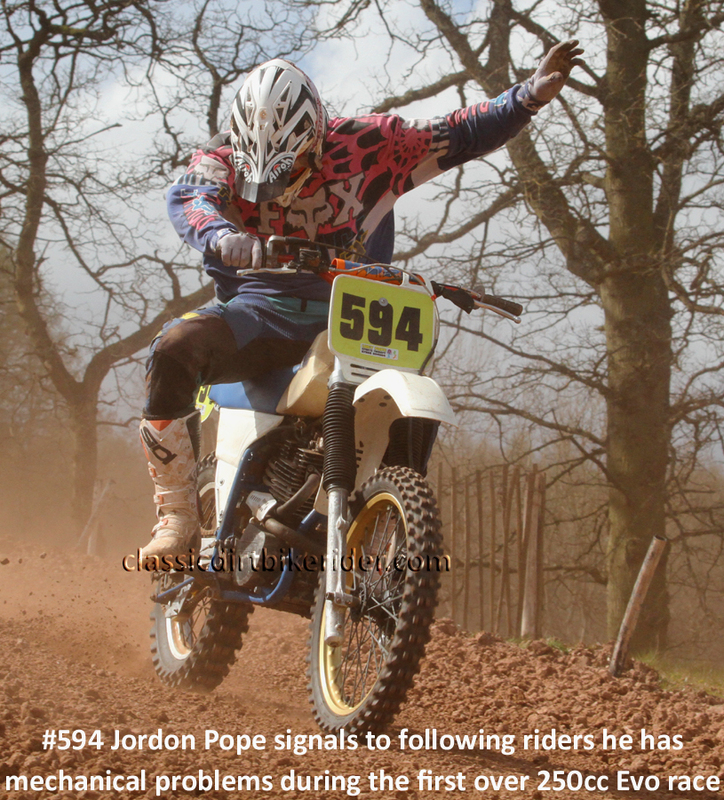 The spectators witnessed some fantastic ding dong battles, #594 Jordan Pope took an early lead in one of the Pre 68 races & rode like a man possessed to try & keep ahead of #164 Tim Dallaway but it was no good, Dallaway slowly began to chip away at Popes lead & eventually blew past him. 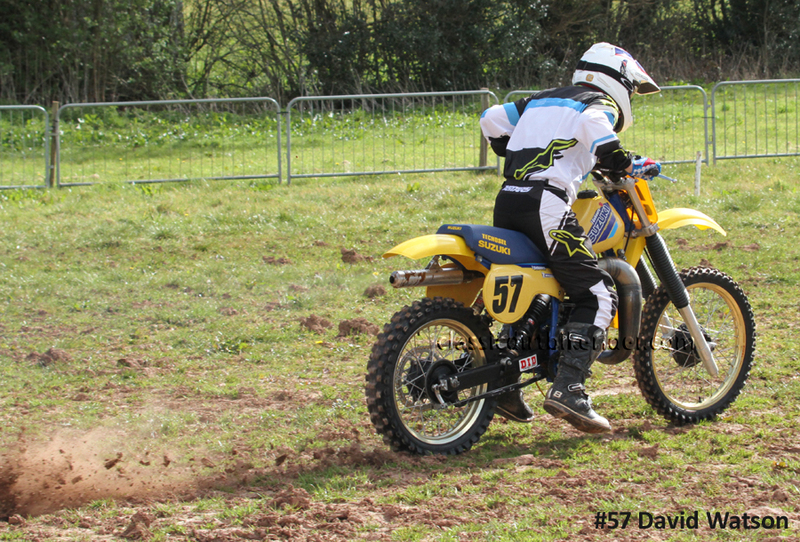 A similar scenario developed in a Twinshock race, #77 Rhys Edwards pulled out a massive lead at the front of the pack on his Yamaha but who should be fighting his way through the dust & slowly reeling him in ready to pouch, none other than former GP racer #57 Mr David Watson on his Suzuki, nothing sort of an anti tank mine would have slowed this man down. 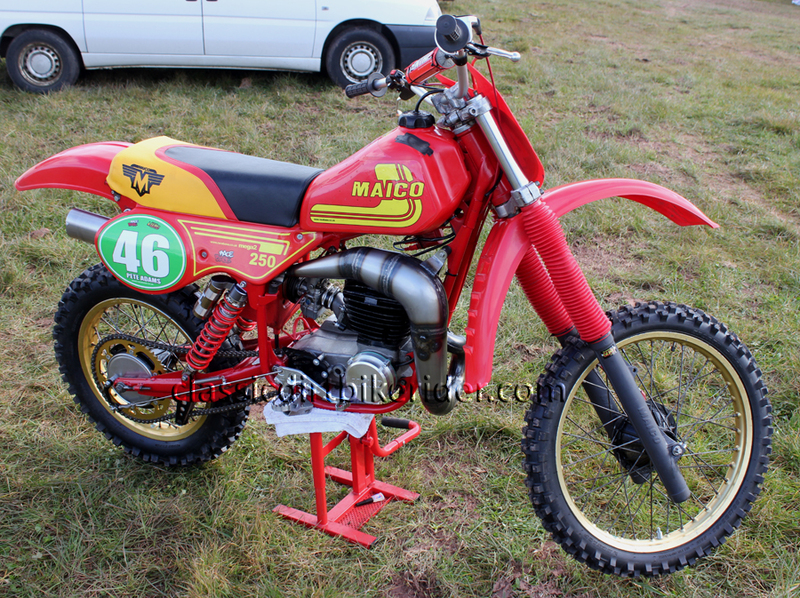 Later on I did remark to Mr Watson that he hasn’t changed much in build or appearance since I watched him in the early 1980s racing his works Yamaha, he didn’t offer up much of a reason as to why this might be, perhaps its down to plenty of early nights & clean living ! 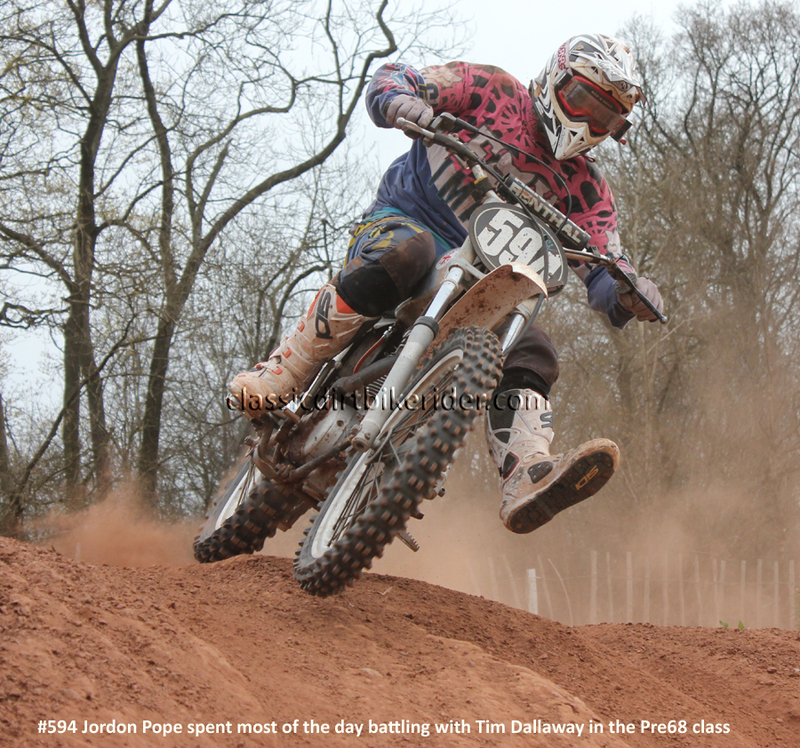 A master class in cornering technique from Tim Dallaway……If your wondering how riders like Mr Dallaway & Mr Watson can fight their way back & slowly reel in their opponents even after a poor start then take a look at the photos bellow, Tim put on a classic display of hairpin cornering technique for the camera & shows that even if you have the best motorcycle in the world you still have to know how to ride it. 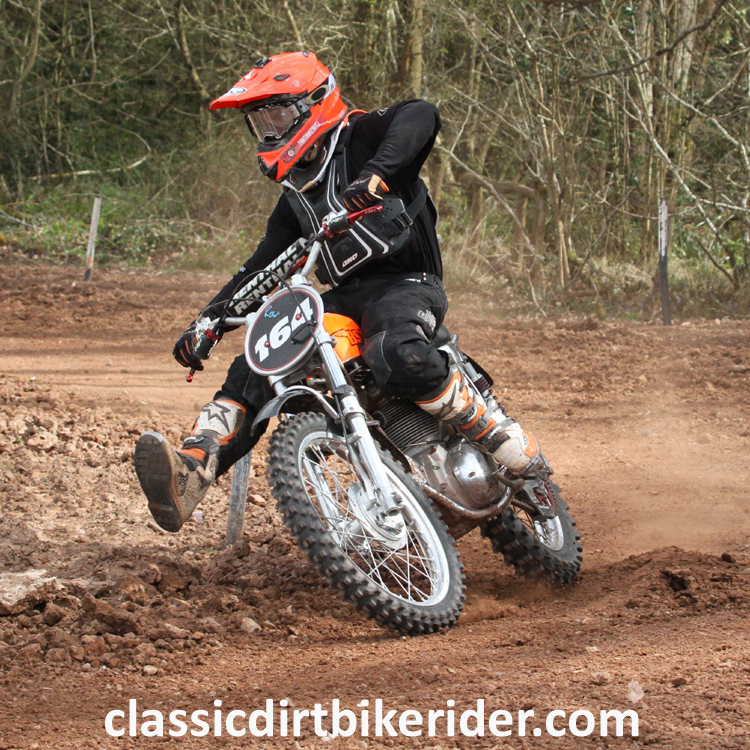 His inside arm is pretty much straight, outside elbow up, he has moved over to the outside edge of the seat to help lean the bike in but to also keep his body upright as well as helping to weight the outside foot peg & really making those tyres dig in & grip. 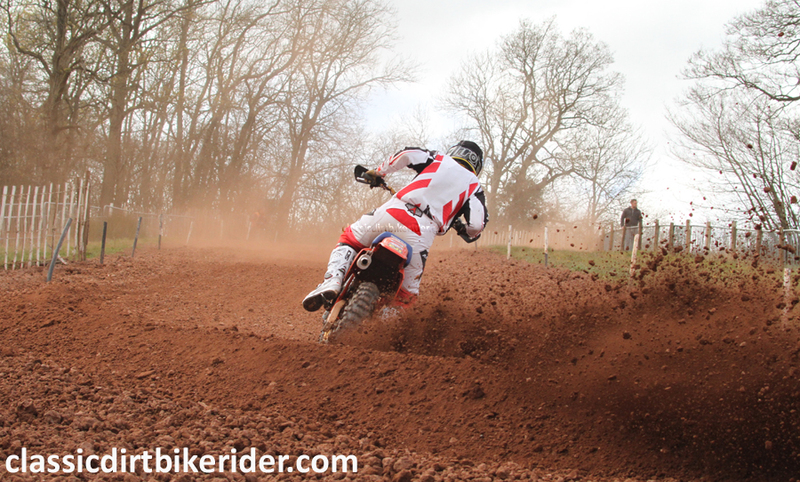 It`s just one technique to deal with one type of corner but the best riders master them all & then use all their different skills lap after lap without fail. 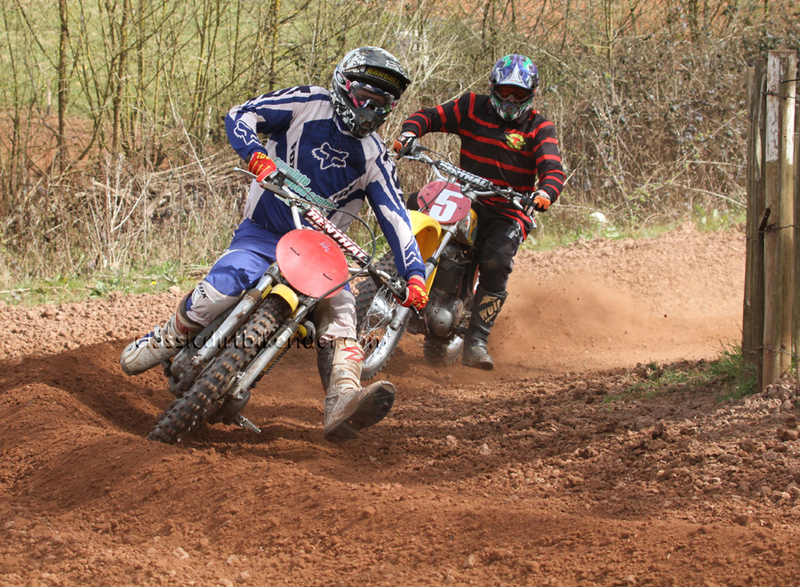 If a rider like Tim can get round a corner maybe 1/4 of a second faster than most of the other guys, on a track such as Pontrilas where each lap contains something like 19 corners, that adds up to 4 3/4 seconds faster per lap, over 5 laps this adds up to 23 3/4 seconds & that’s a lot ! 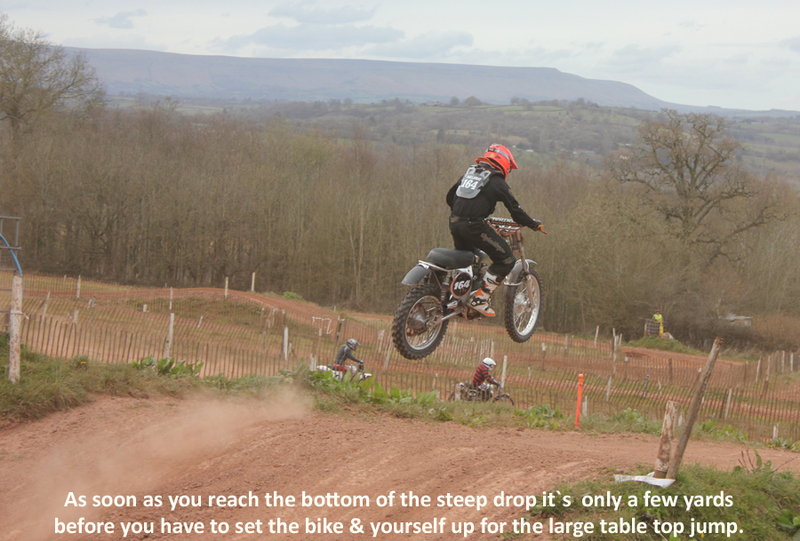 Even if you can match the top riders speed down the straights & be as daring over the jumps they will still start to gradually pull away from you as the laps go by. 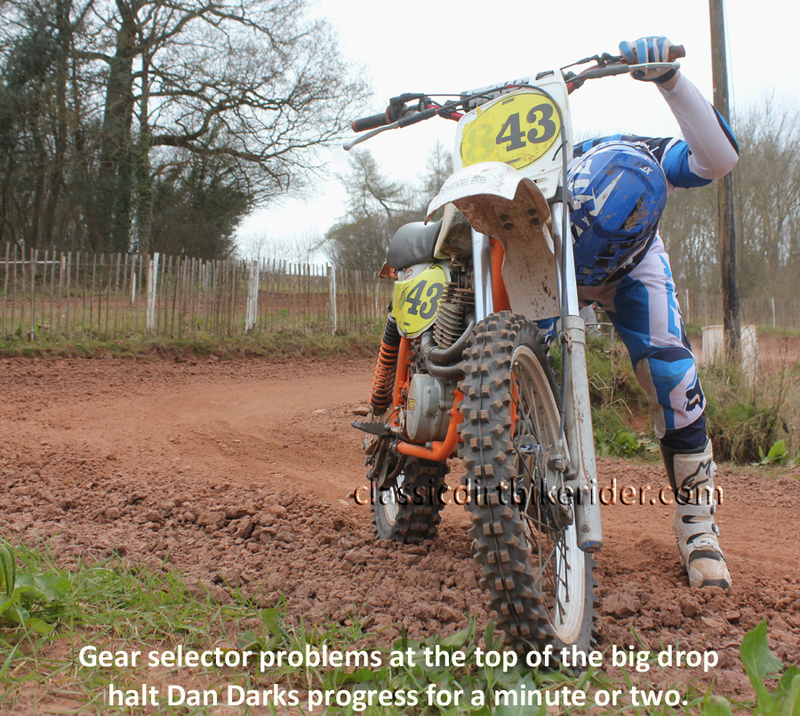 Depressing isn’t it.